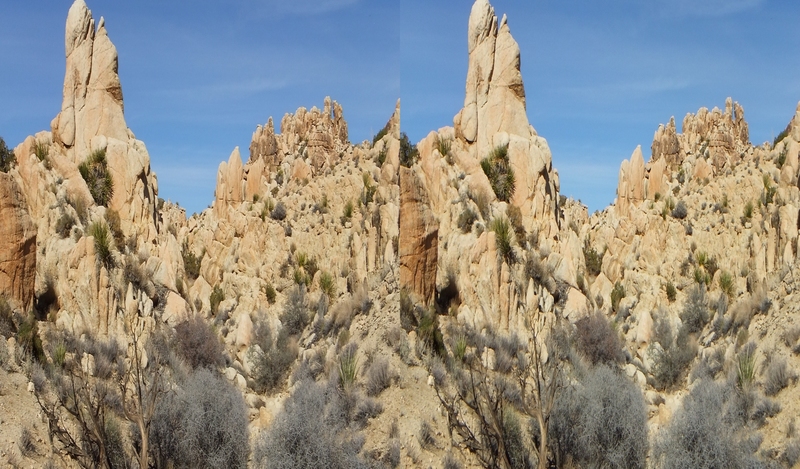 HAVING SPENT the morning and post-meridiem hours canvassing the Spire Cathedral at Towers of Uncertainty, and climbing the small hill just to its north, I began my afternoon return to the car. 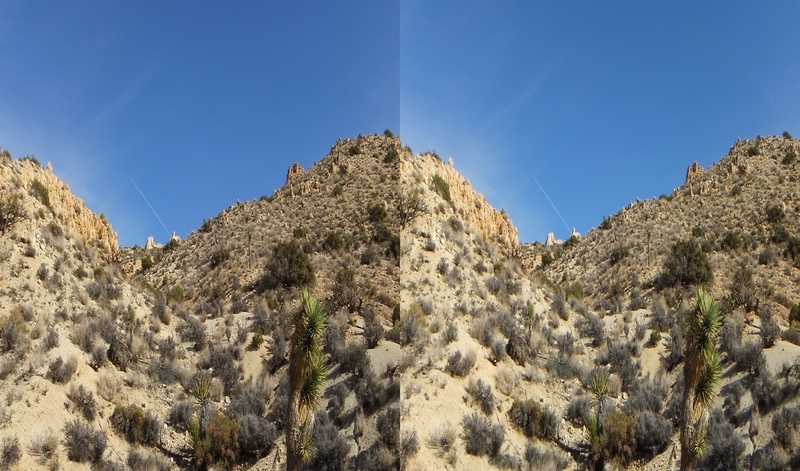 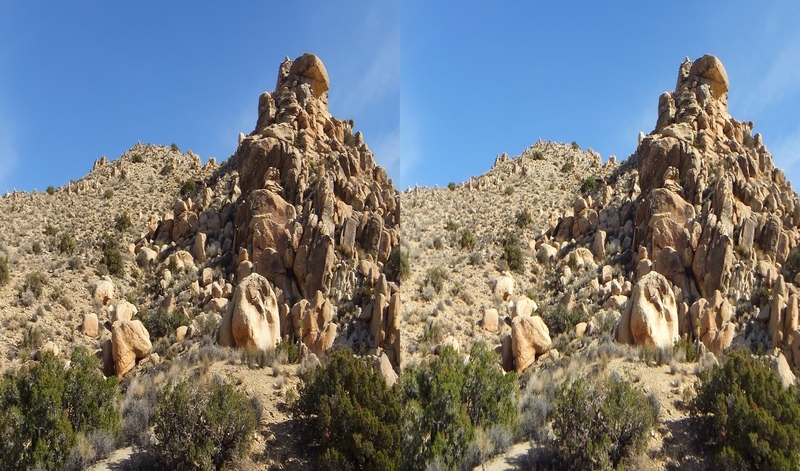 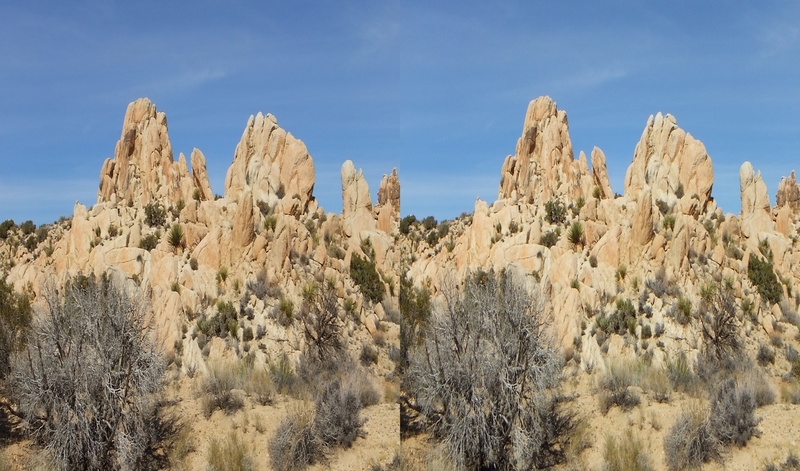 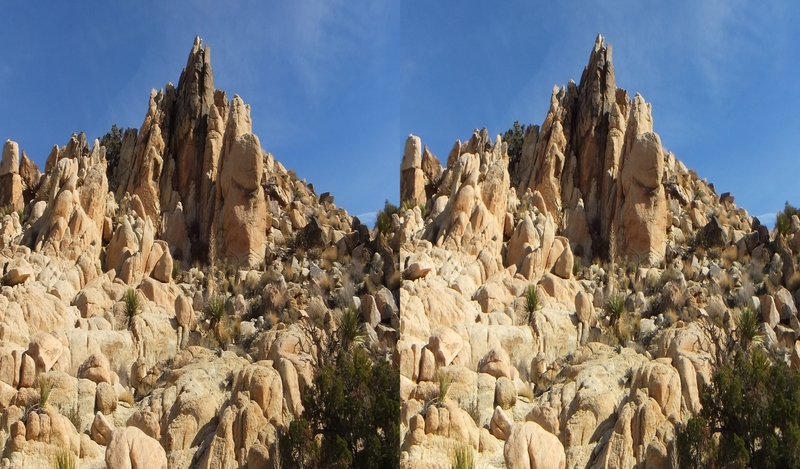 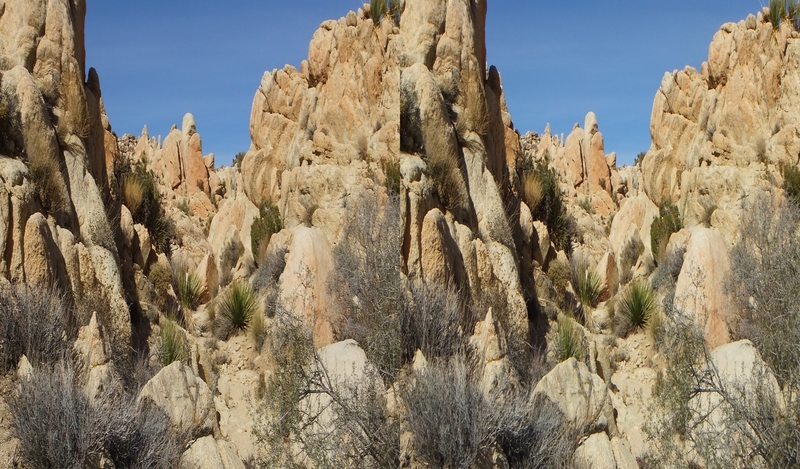 Since I had done the west side on the way in, I returned by the east area of the Towers formations. 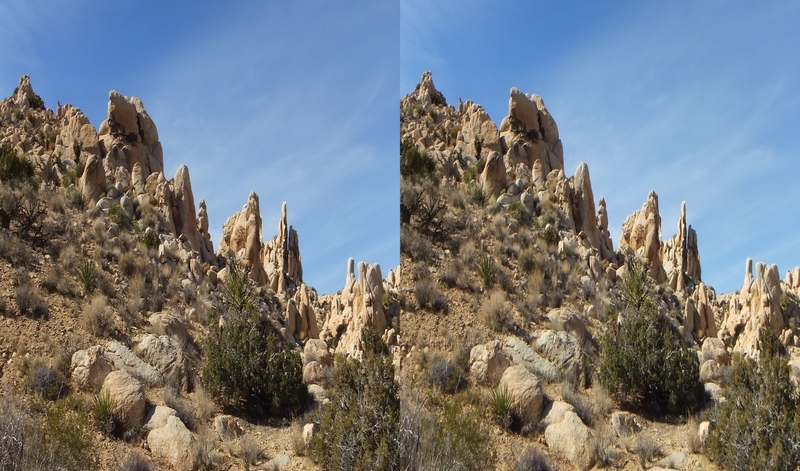 This included following the dry wash a couple of hundred paces into the Towers Hills and then out again, my direction being toward the “Crow’s Nest” climbing formation. 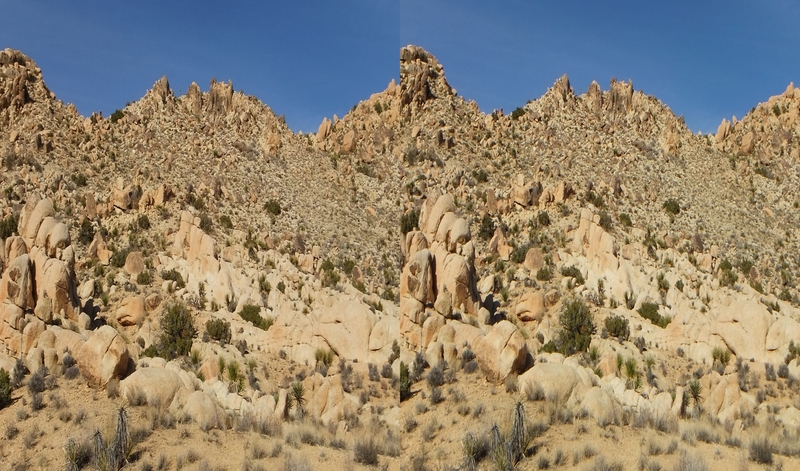 And then on south to Geology Tour Road parking area #4 (described on the GTR brochure as Stop 4). 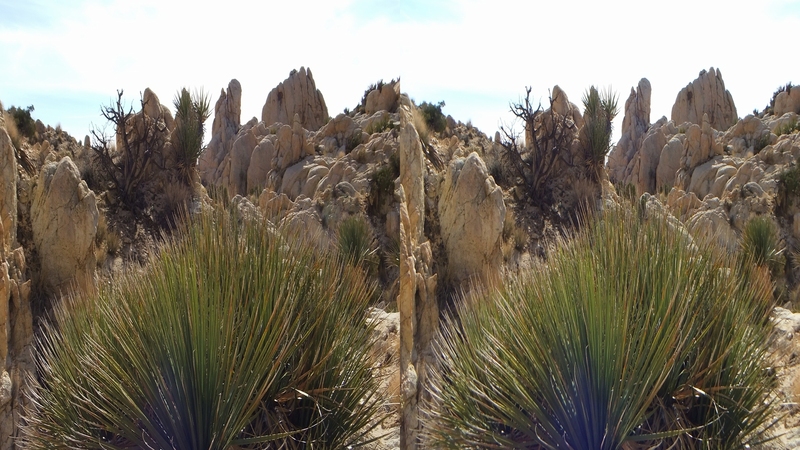 THE DRY WASH, on leaving the hill country, begins to snake its way down into the Spire Cathedral. 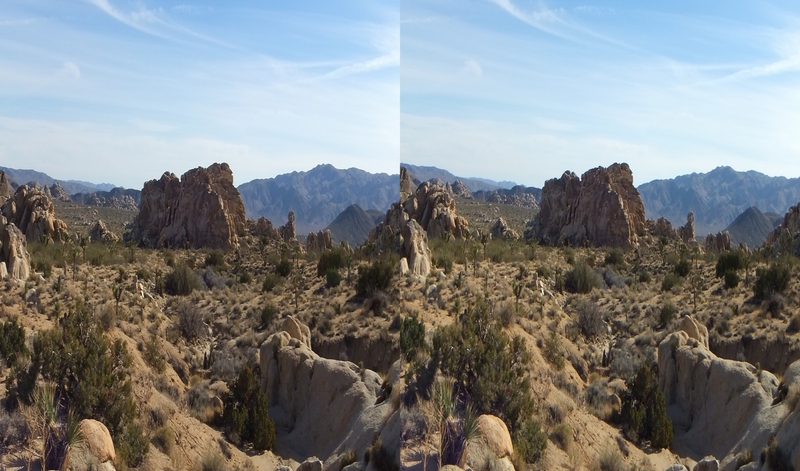 We leave the wash behind at this point. 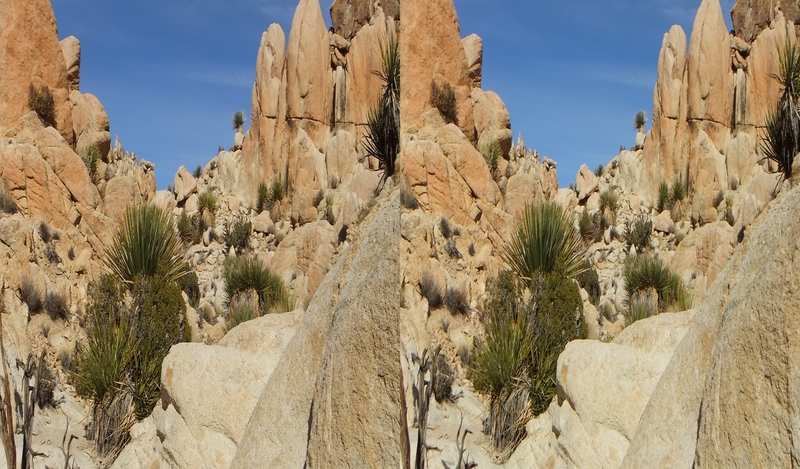 Table-top rock, balanced above us and defying gravity, ushers us along the final 350 yds slope toward “Crow’s Nest.” I won’t say it is all that threatening, this protrusion. 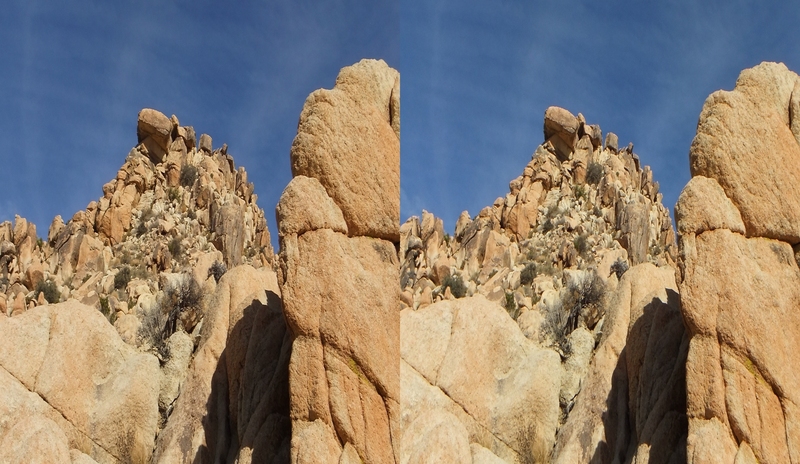 Likely as not, Table-top rock has stuck out there for hundreds of thousands of years. 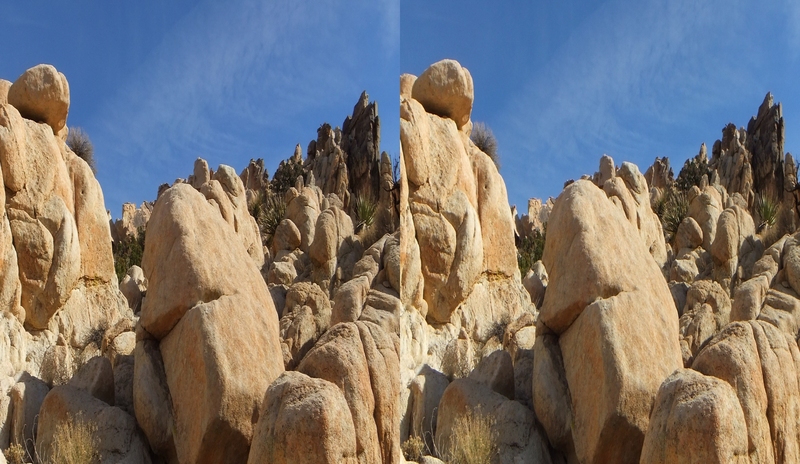 One day, however, the elements or gravitational pull or Apple iPhone App will cause its demise. 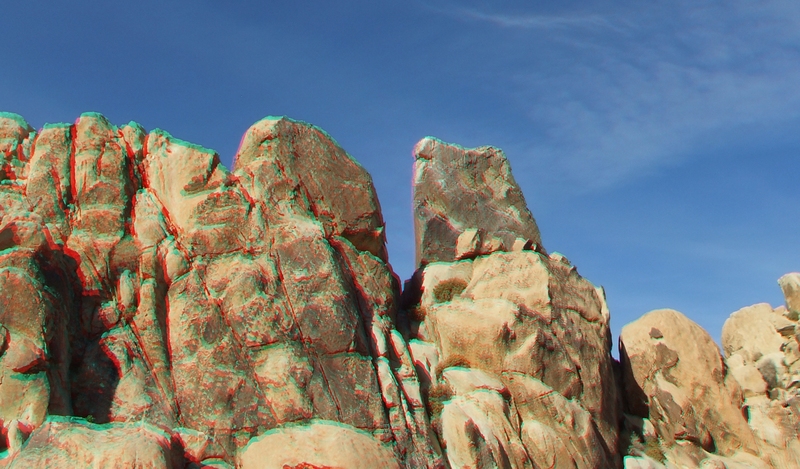 Imagine the loud crash and crunching sounds when that happens! 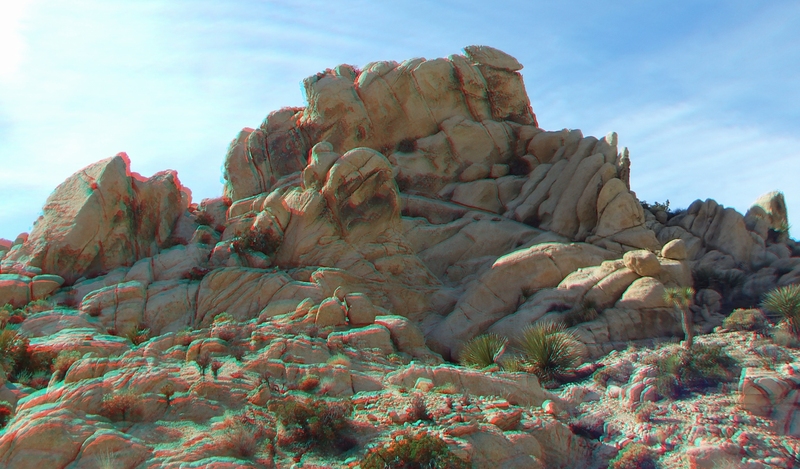 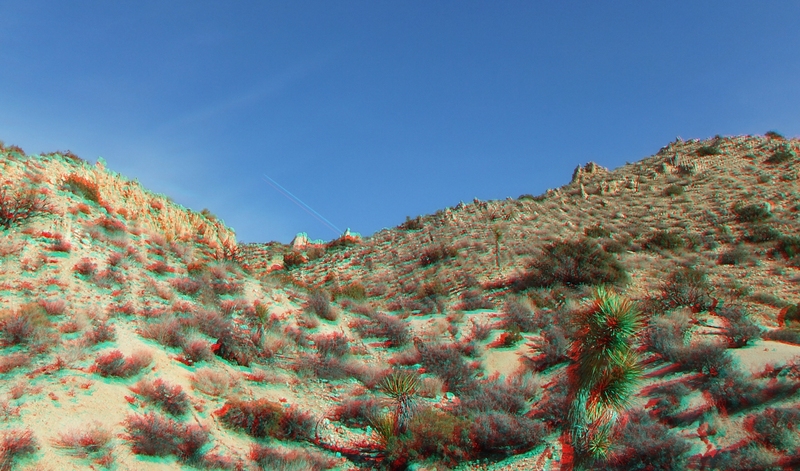 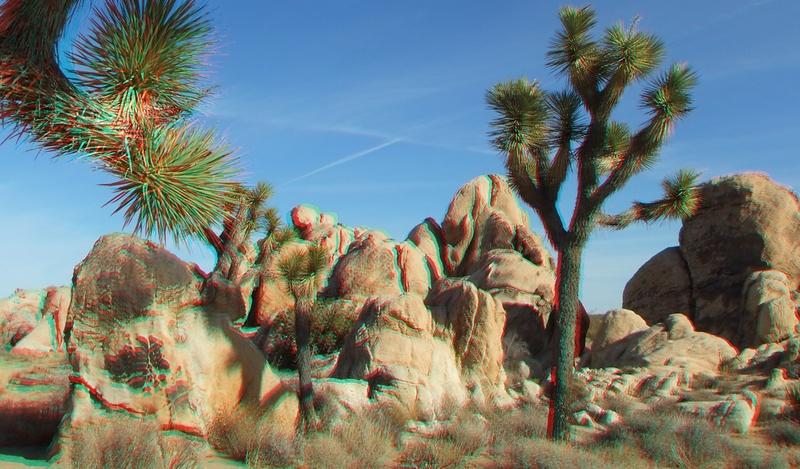 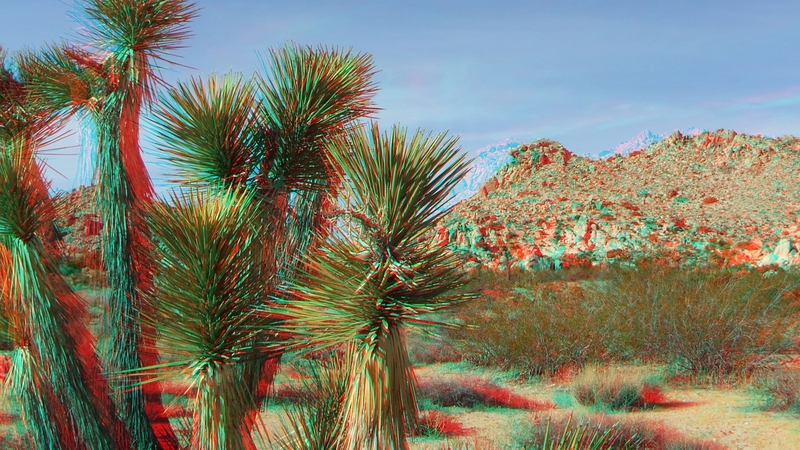 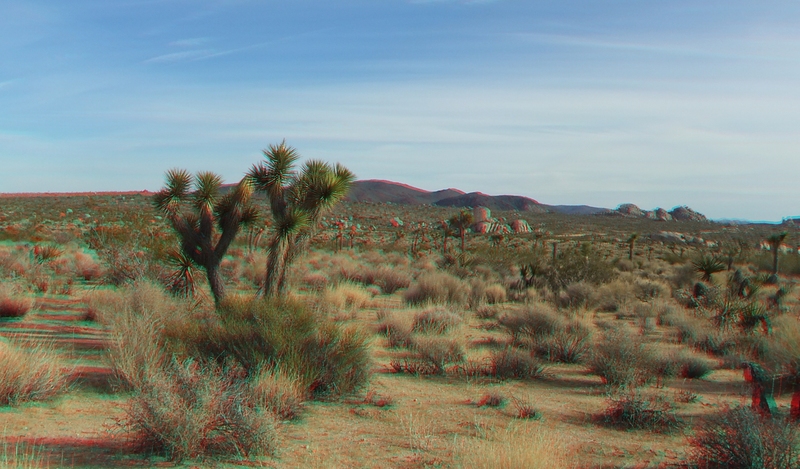 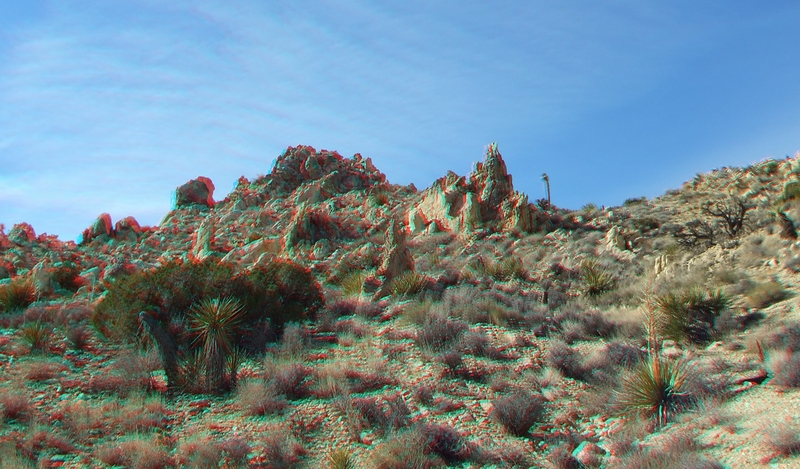 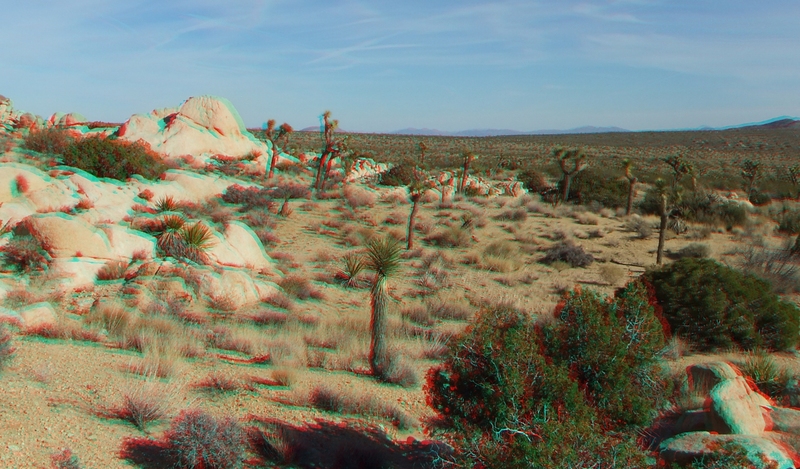 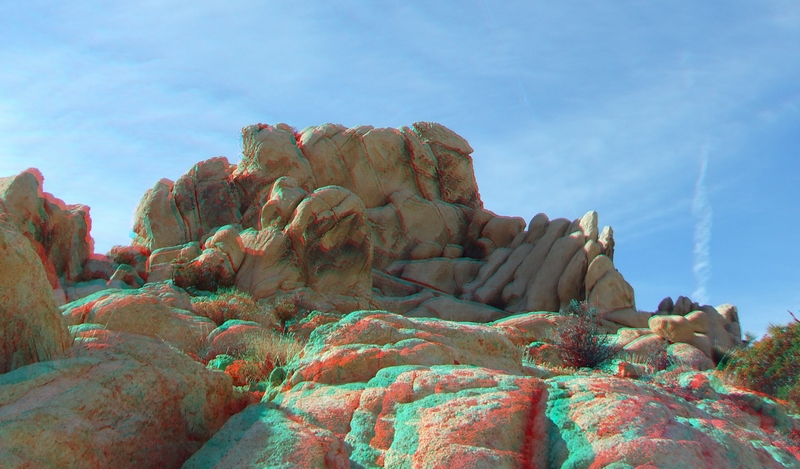 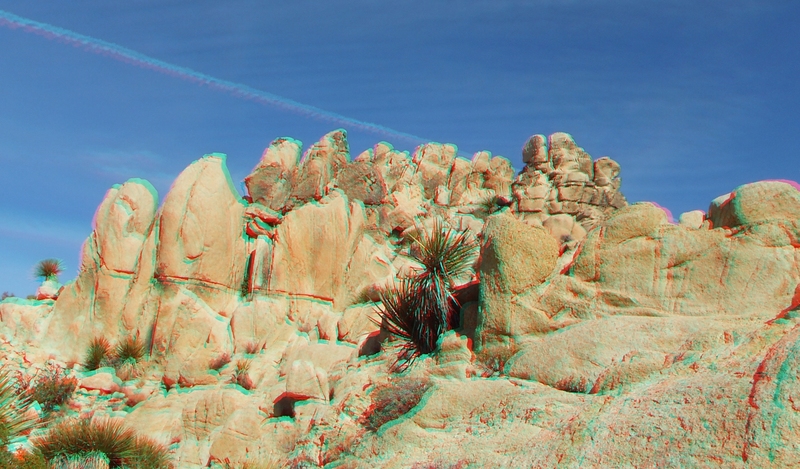 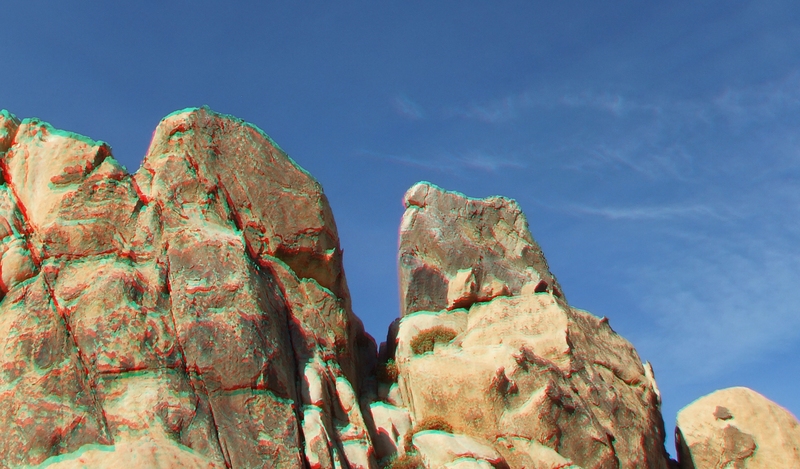 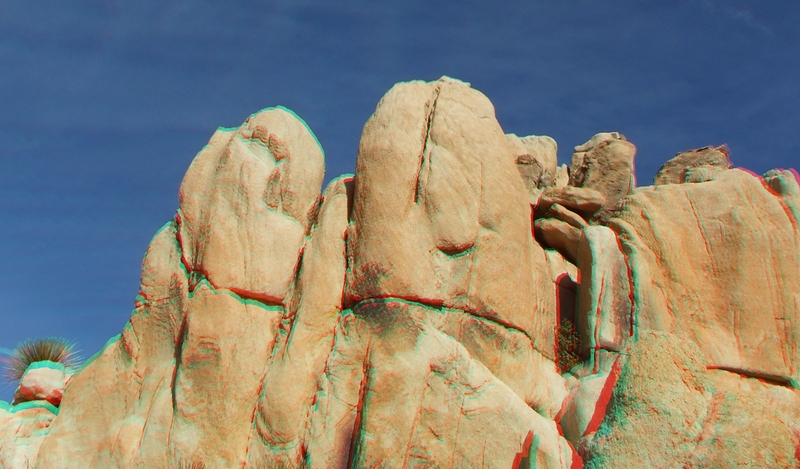 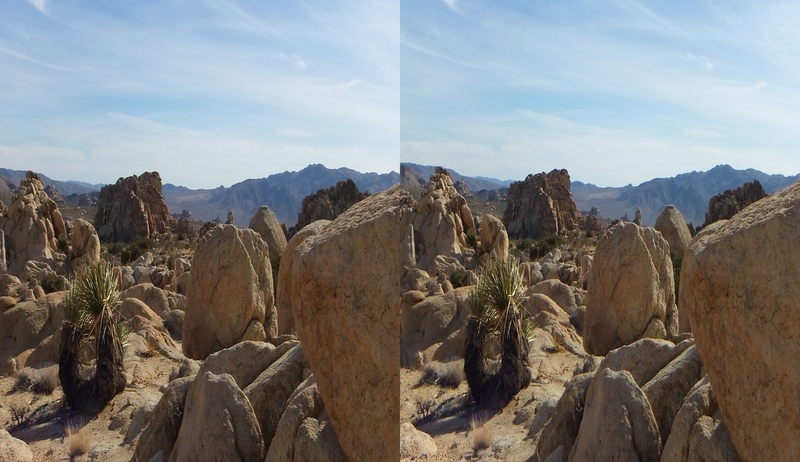 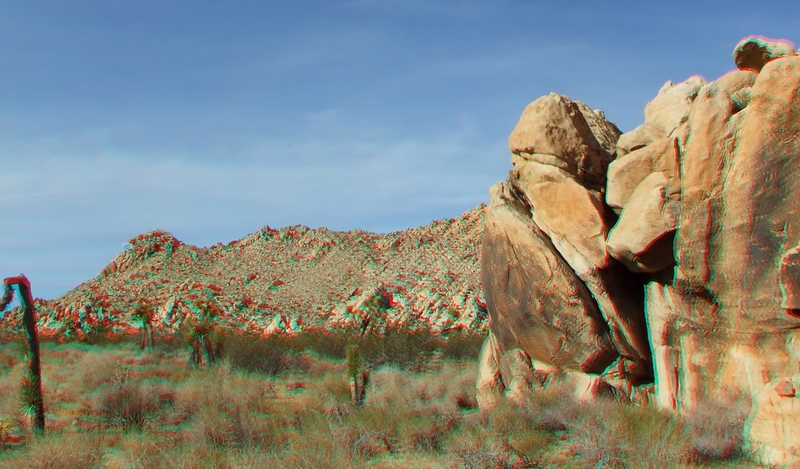 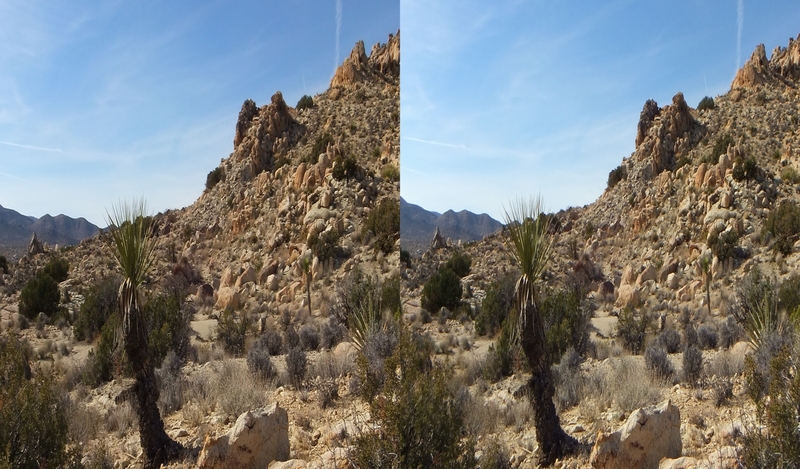 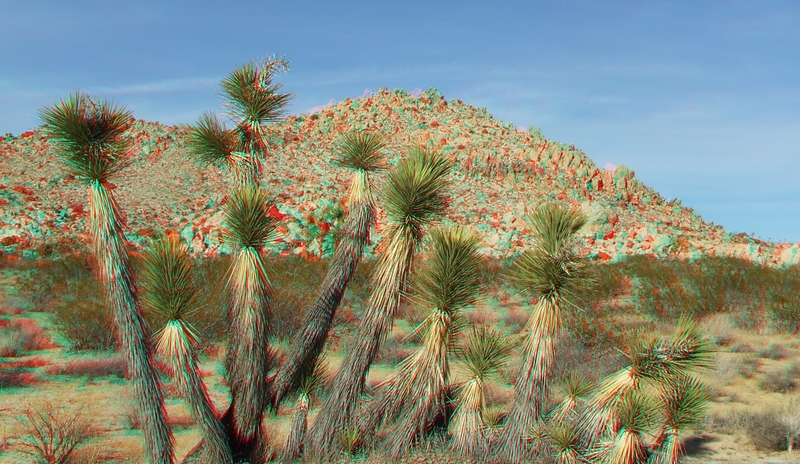 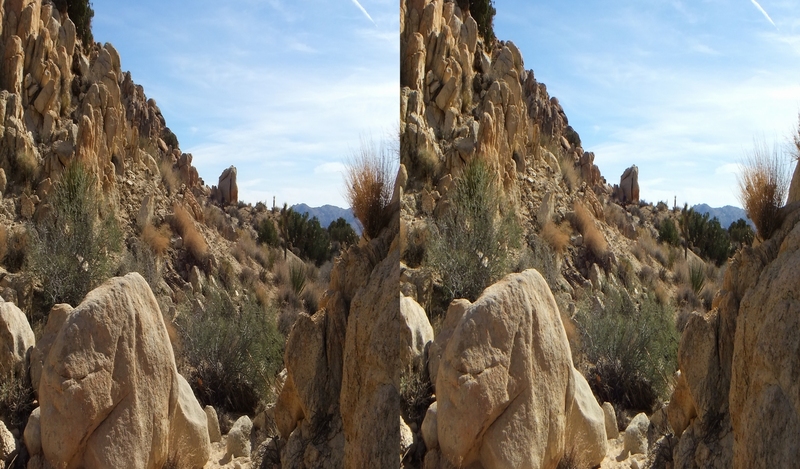 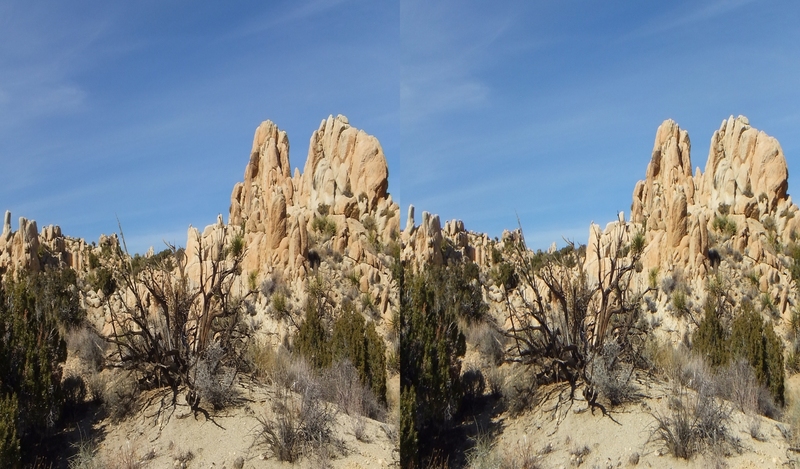 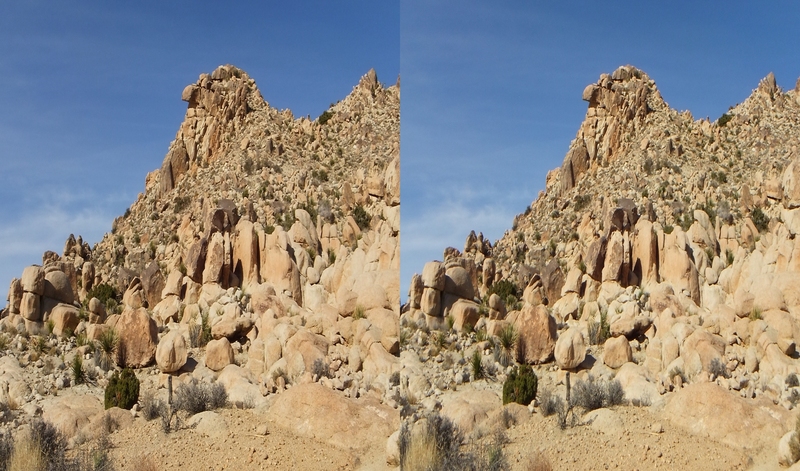 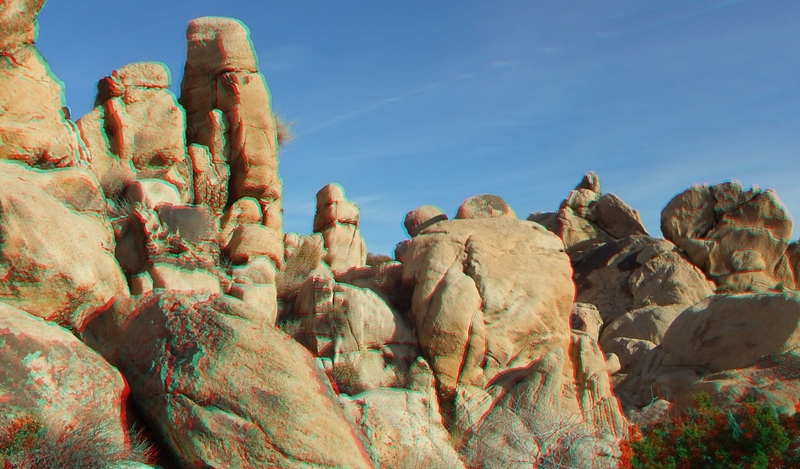 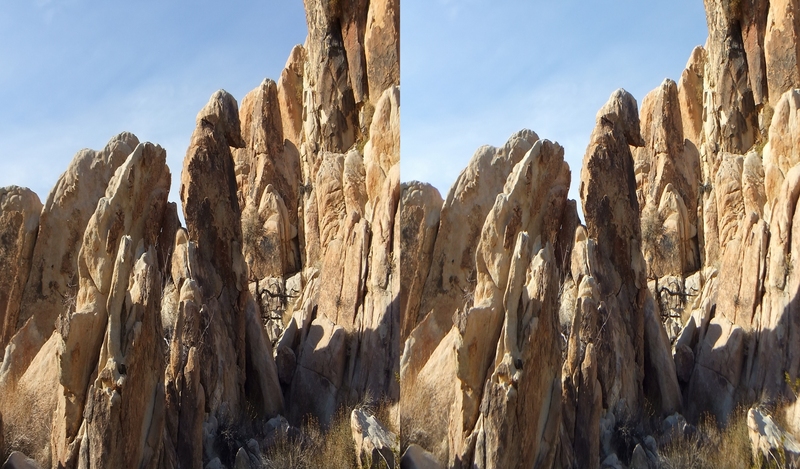 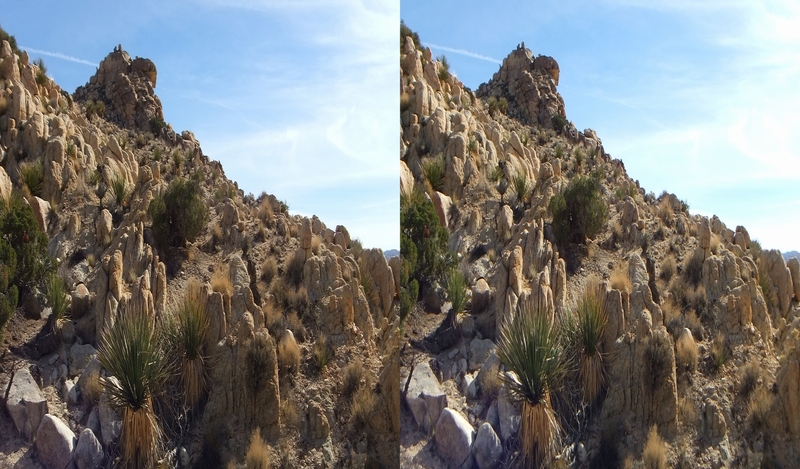 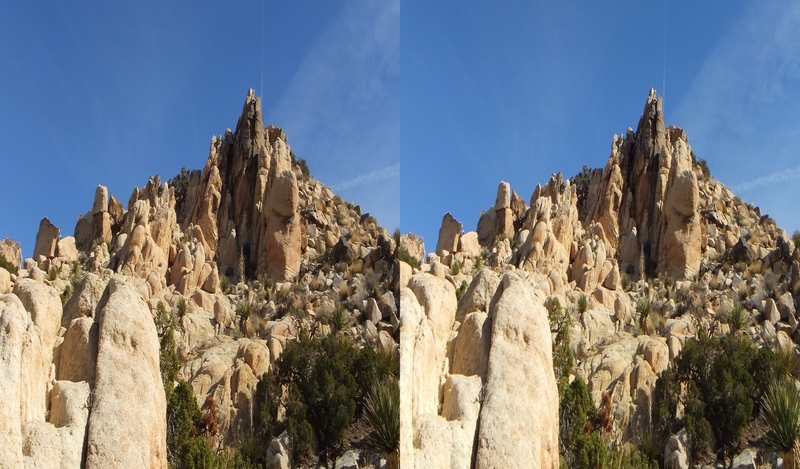 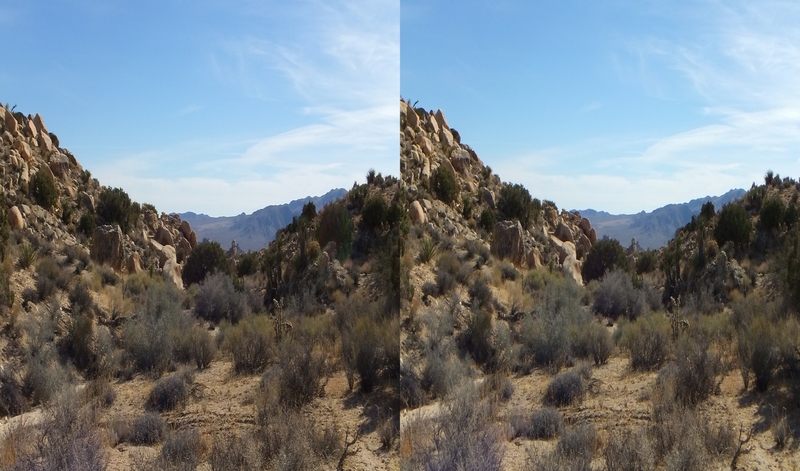 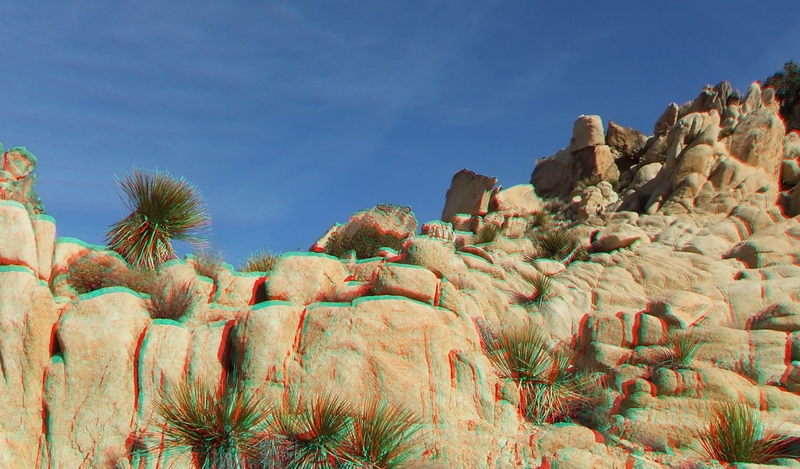 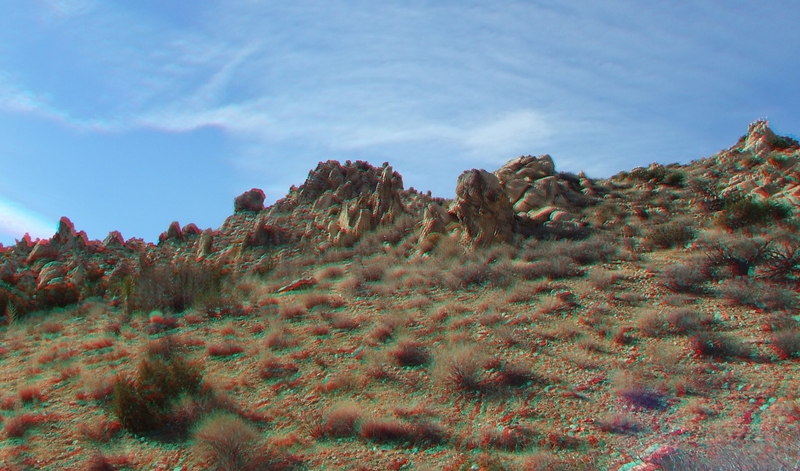 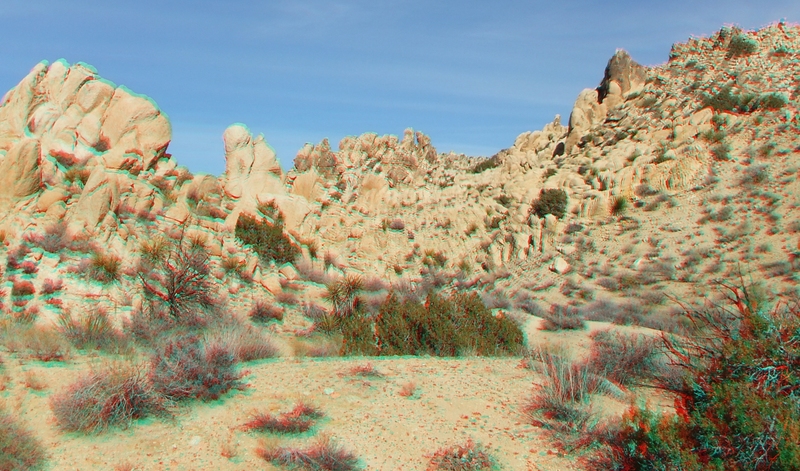 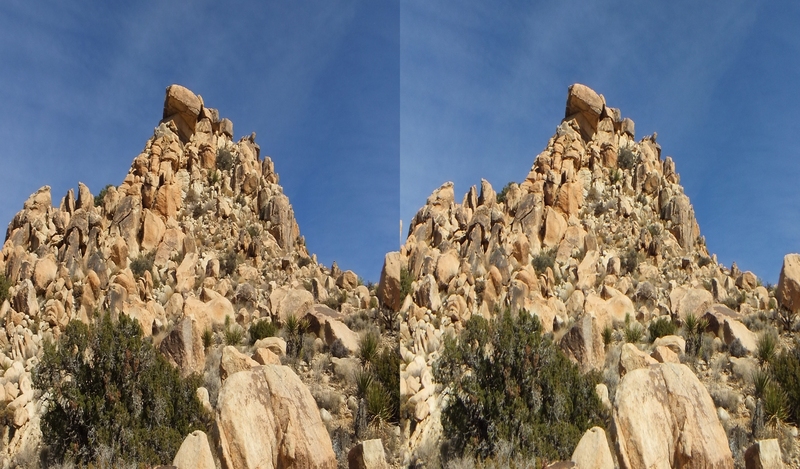 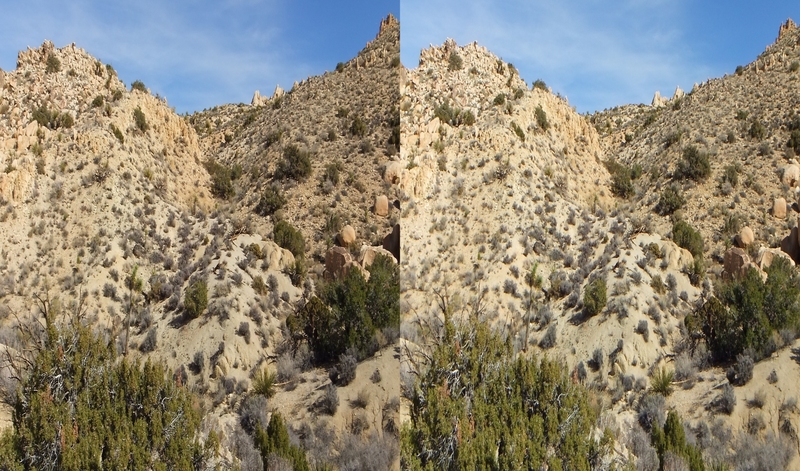 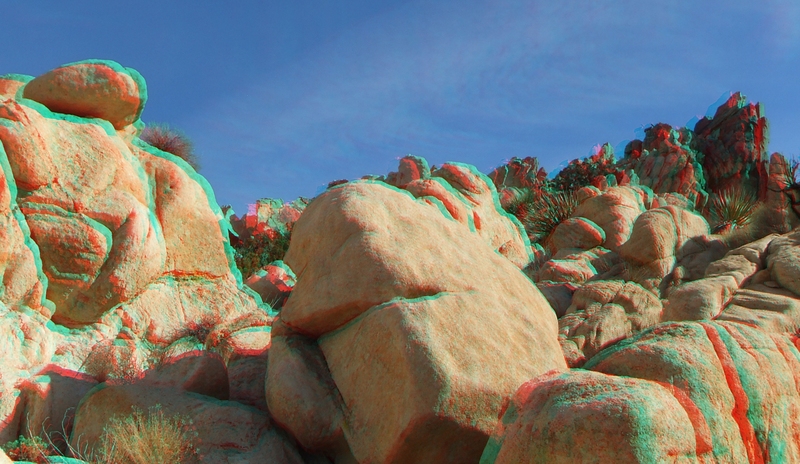 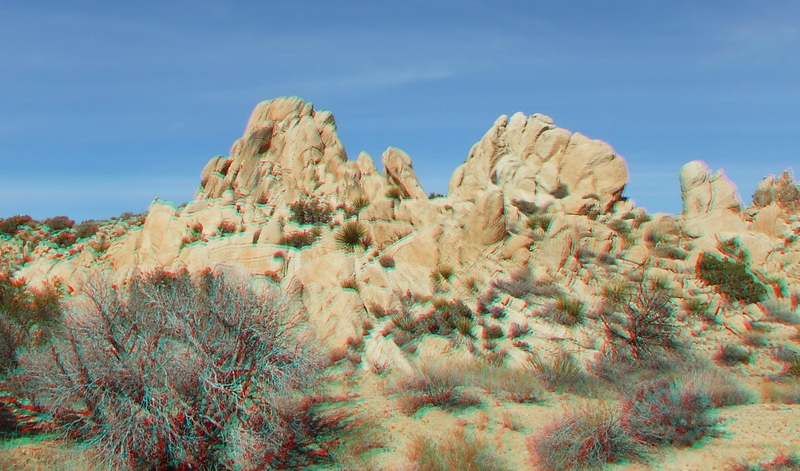 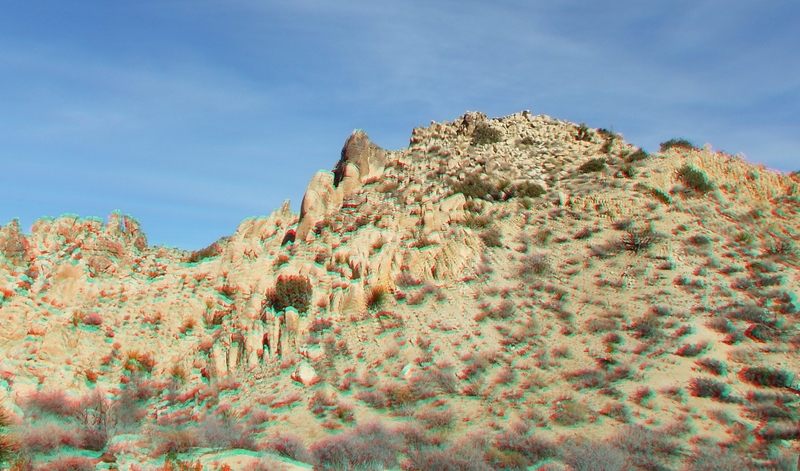 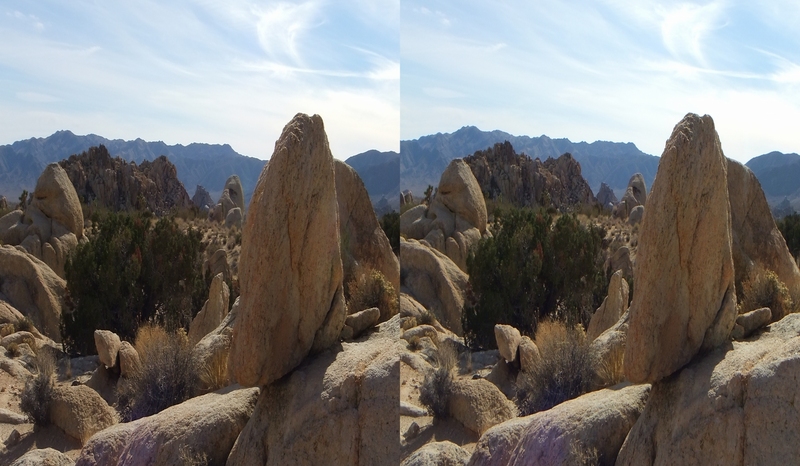 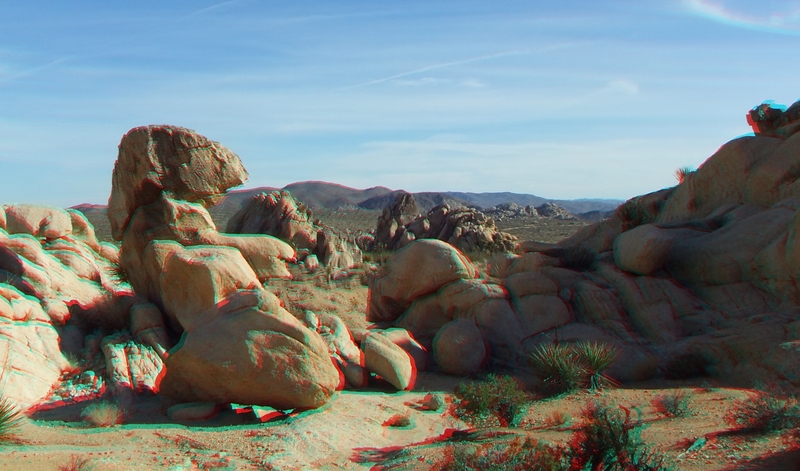 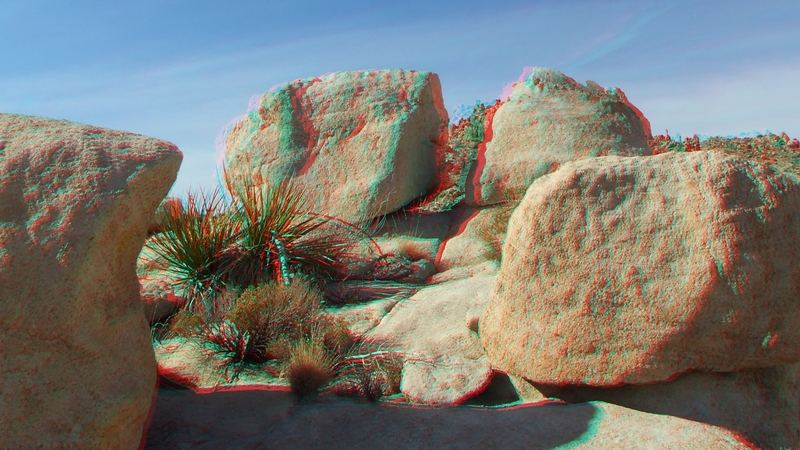 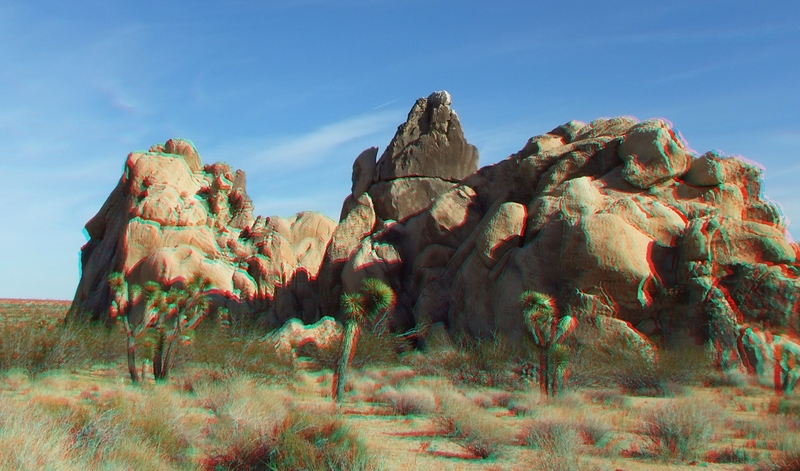 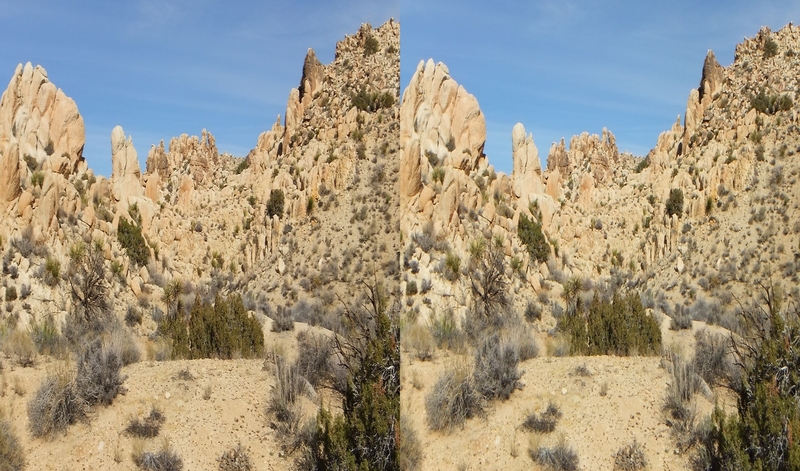 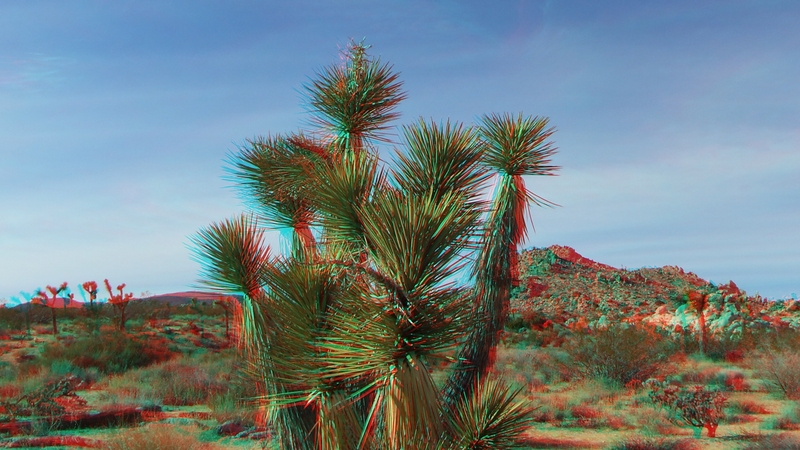 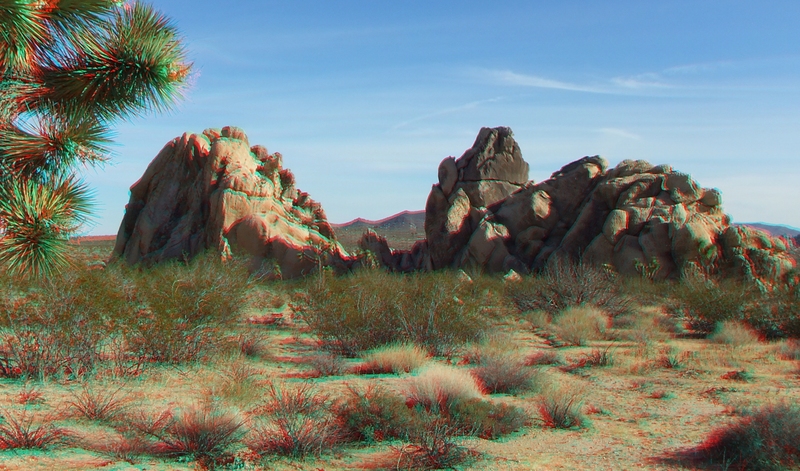 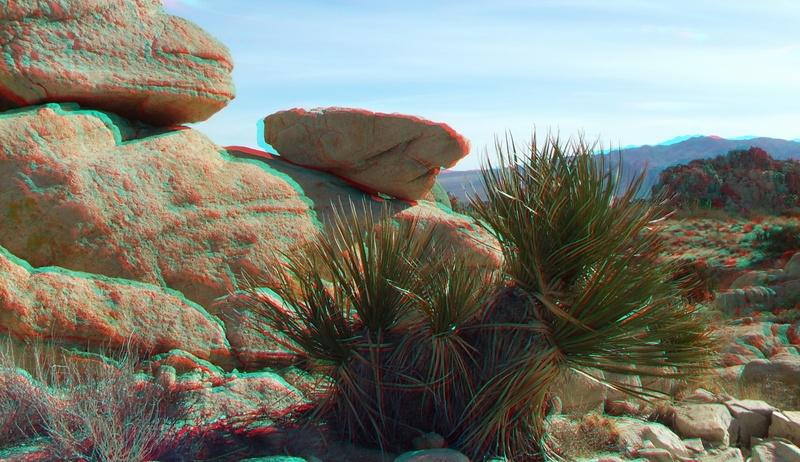 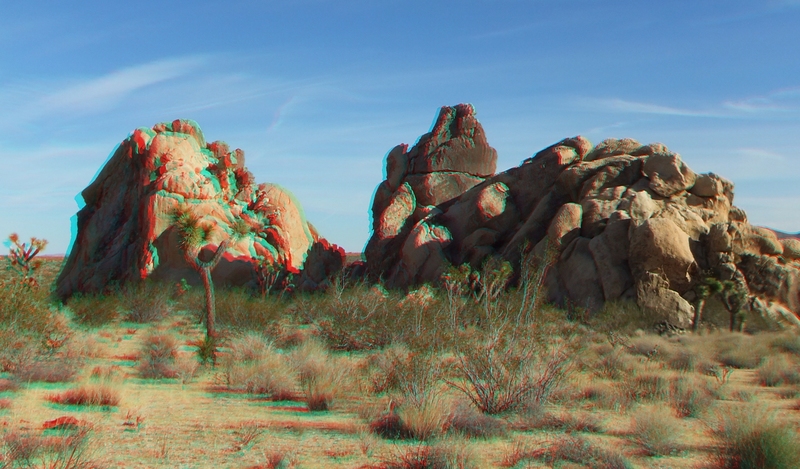 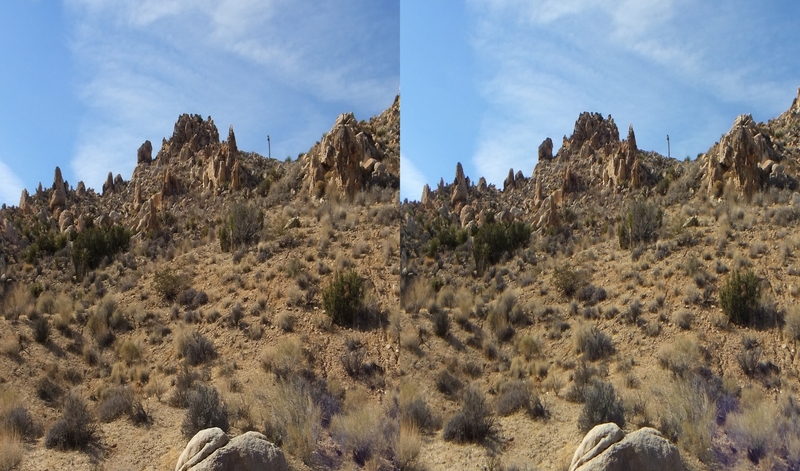 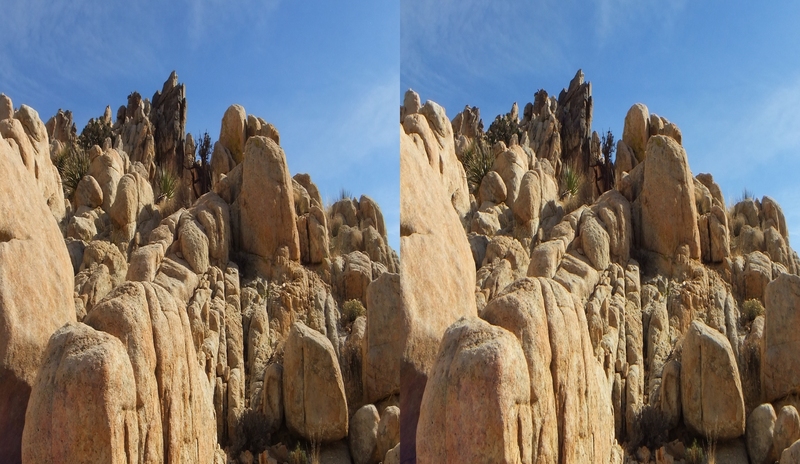 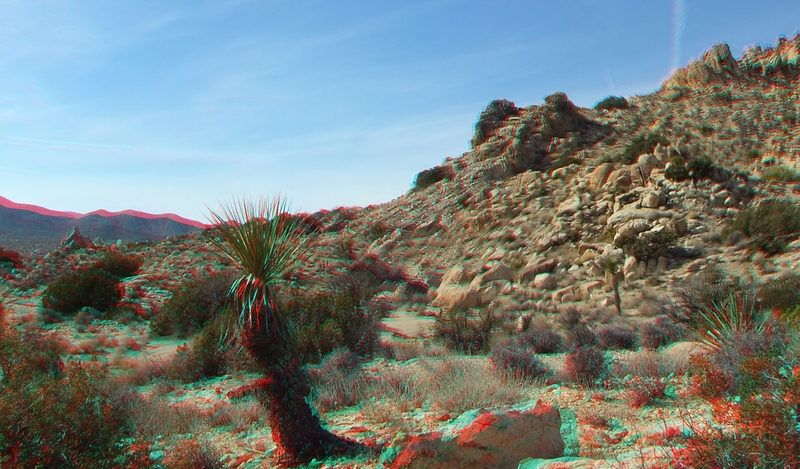 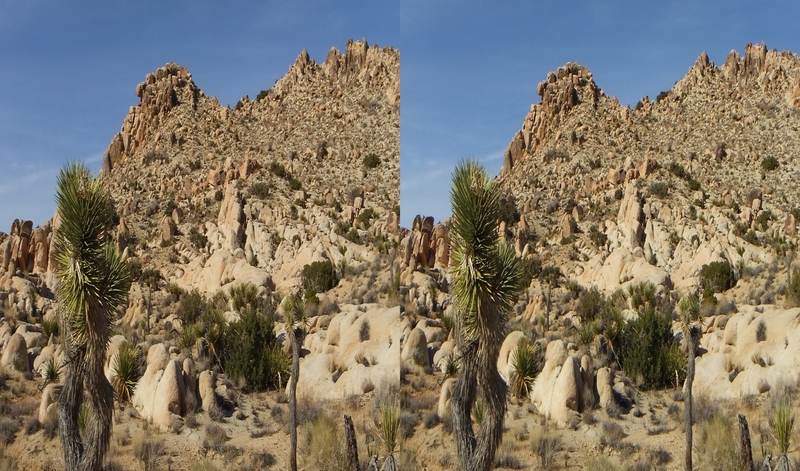 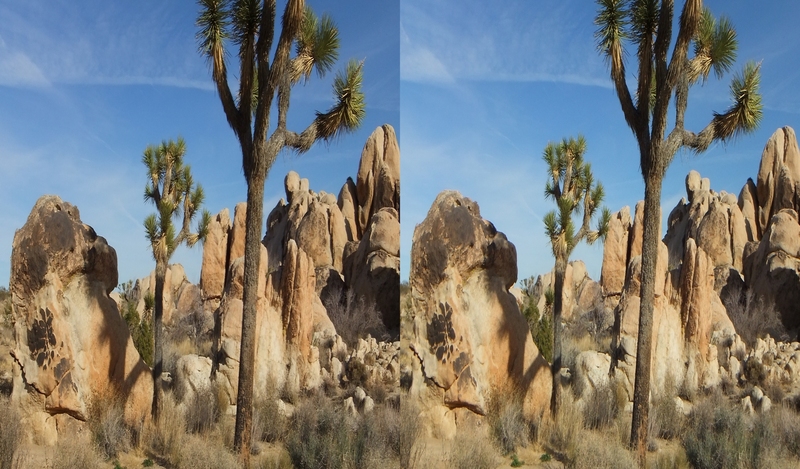 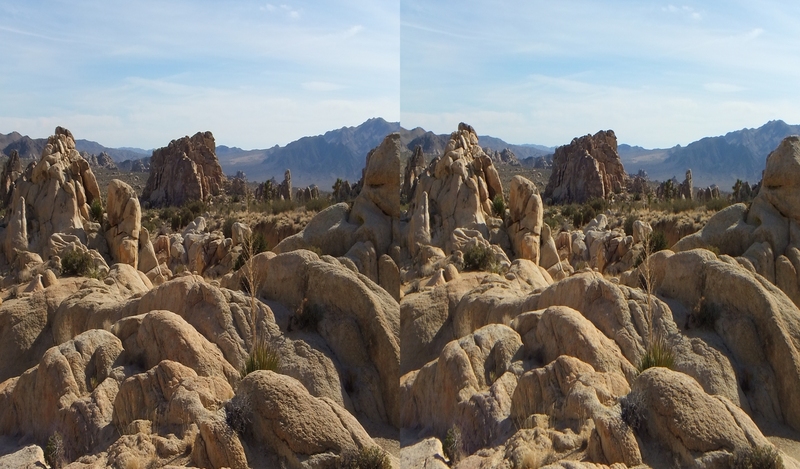 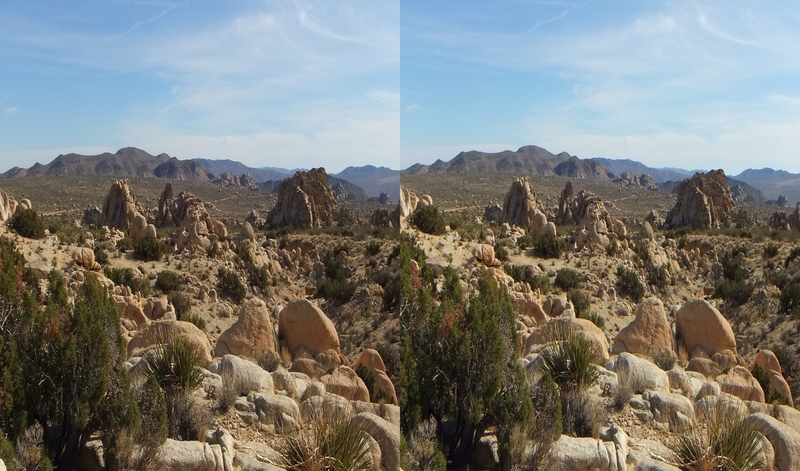 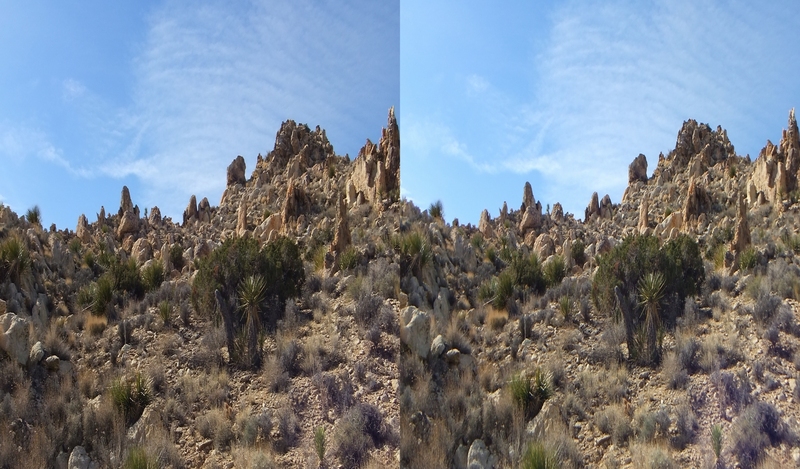 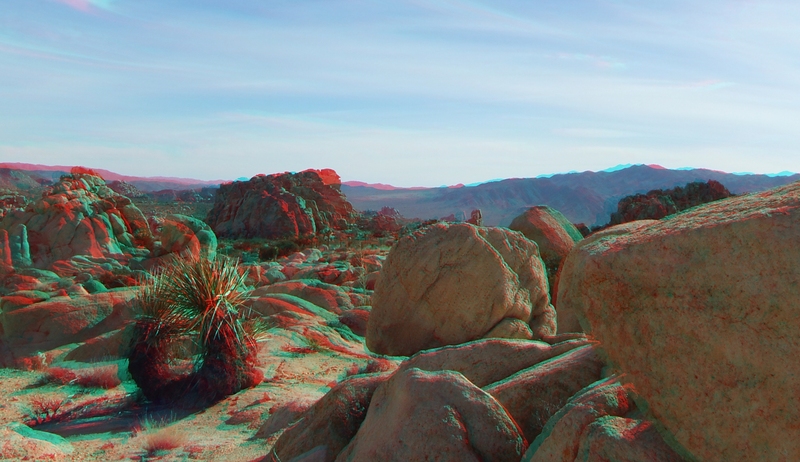 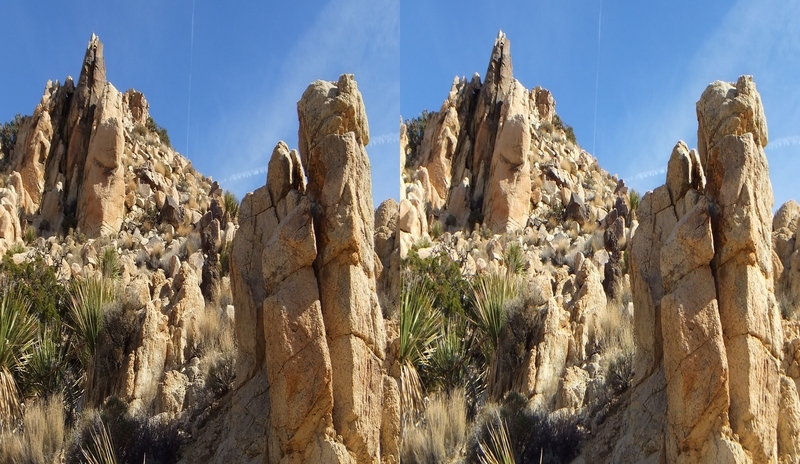 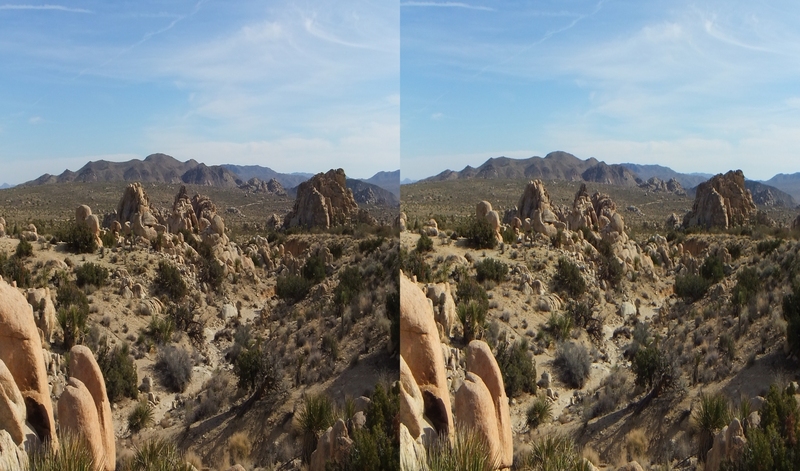 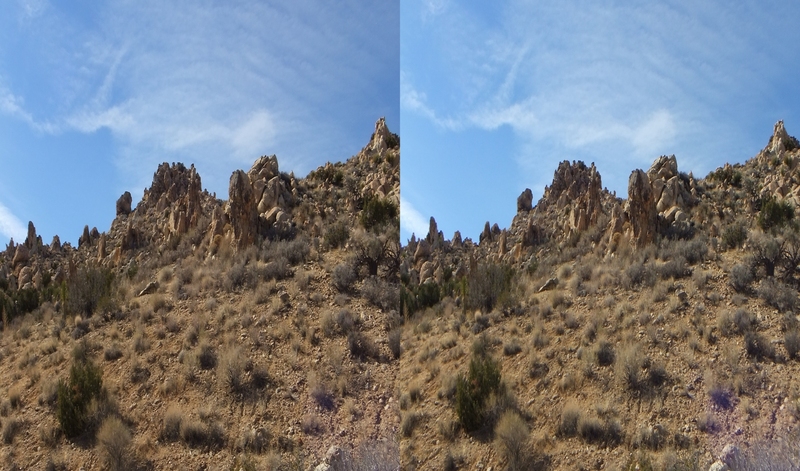 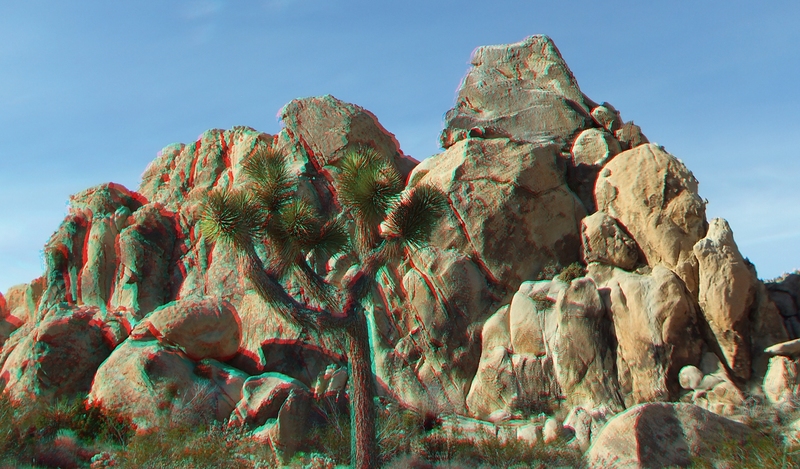 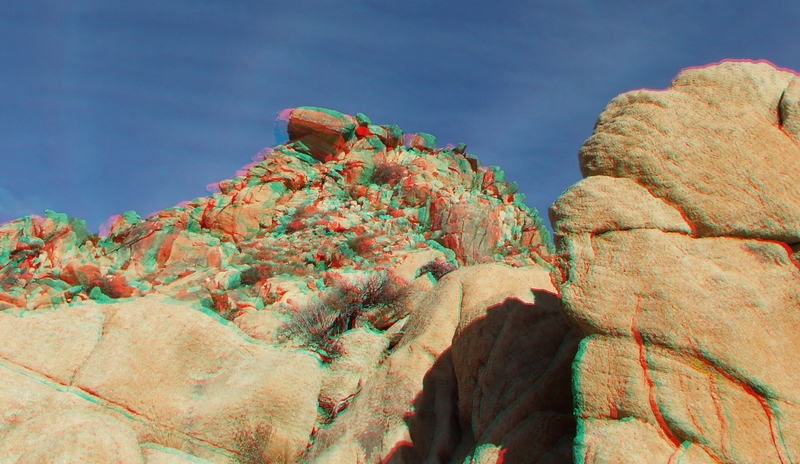 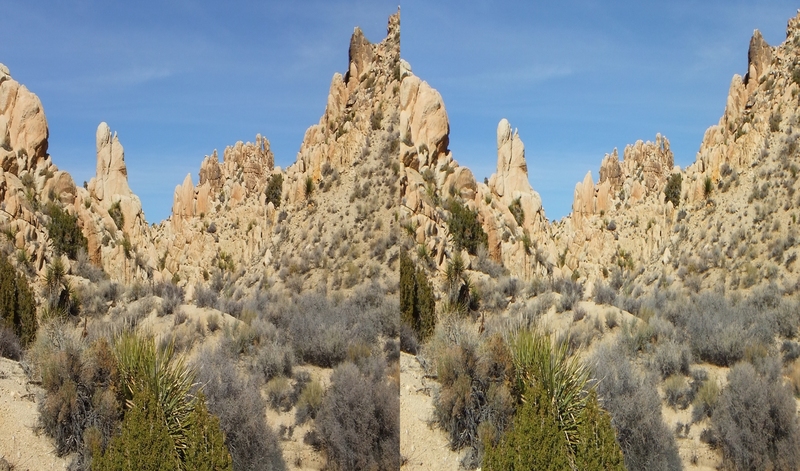 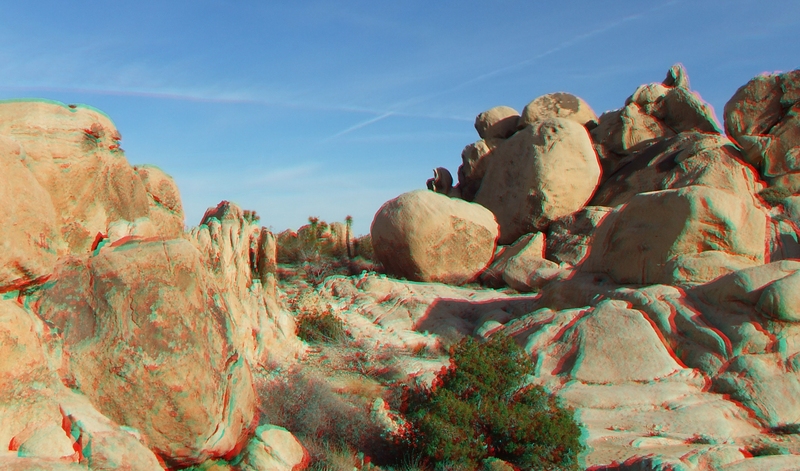 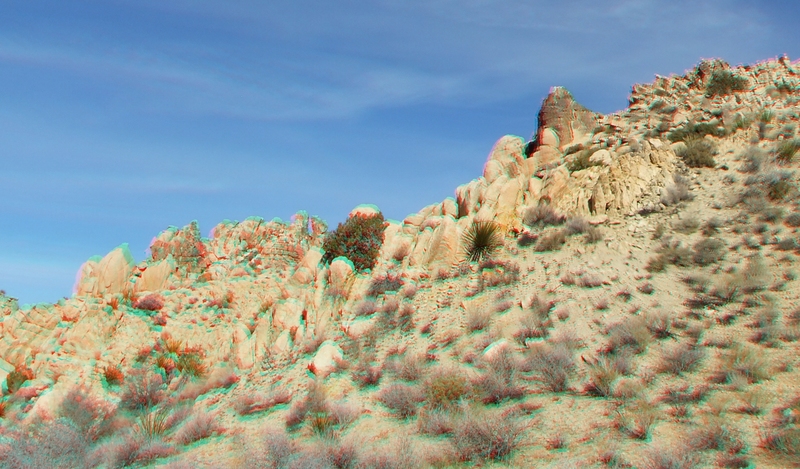 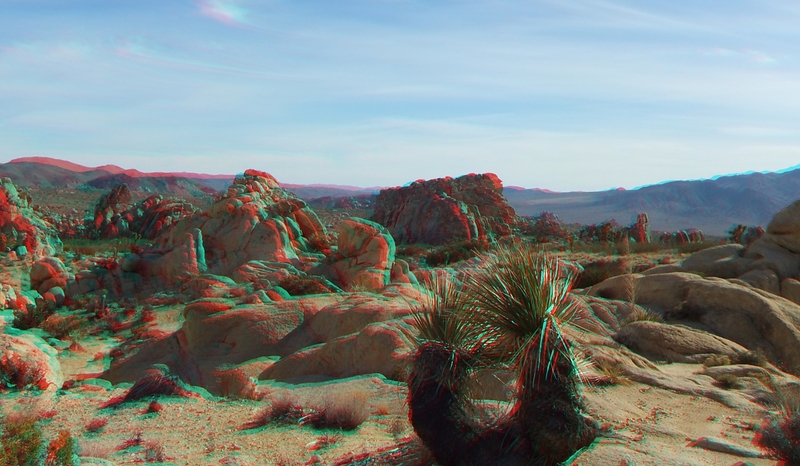 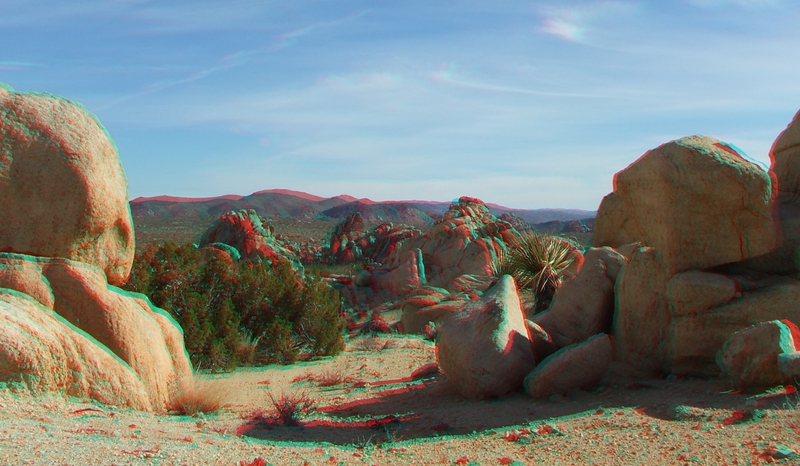 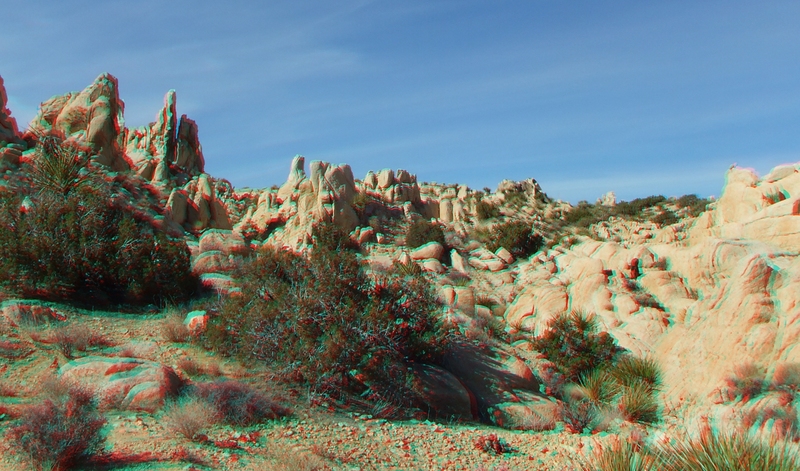 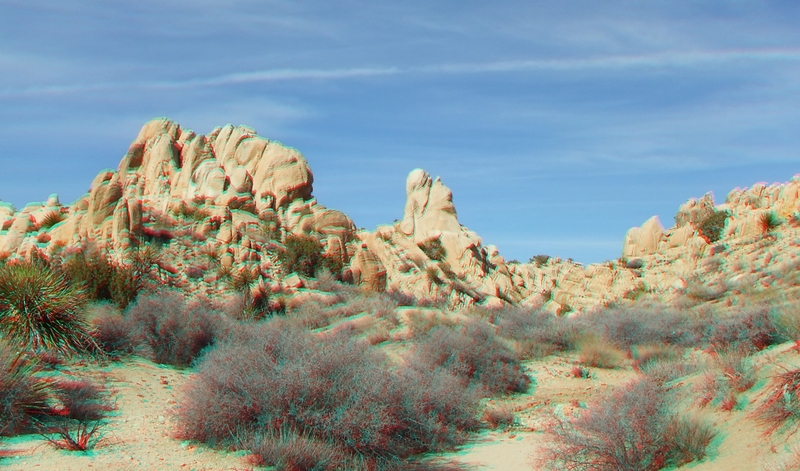 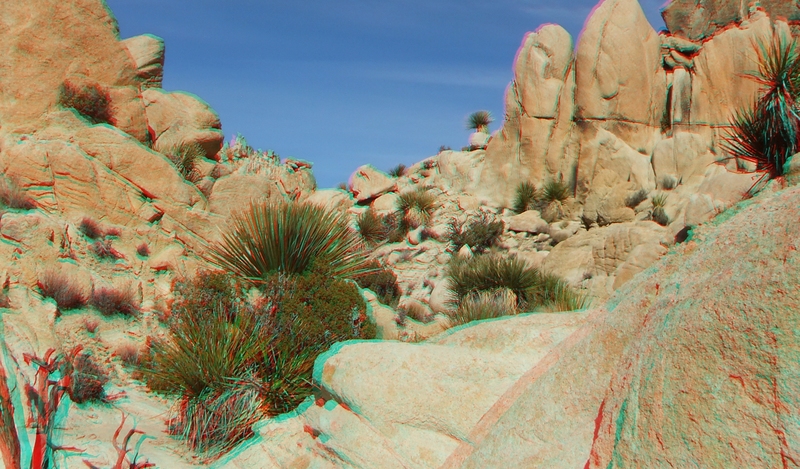 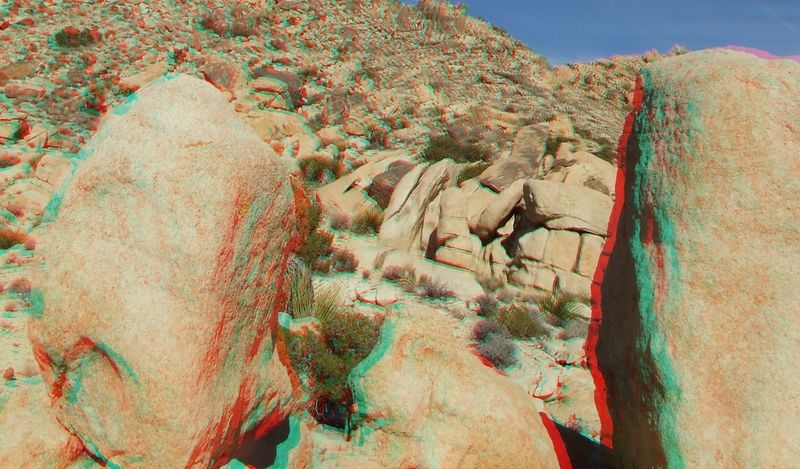 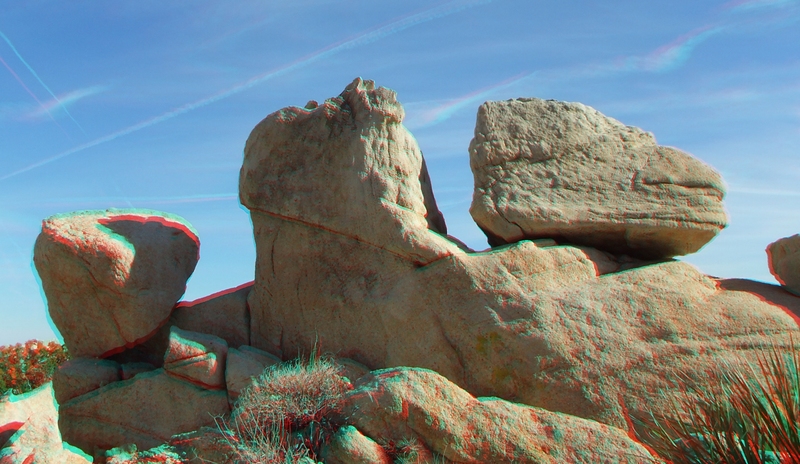 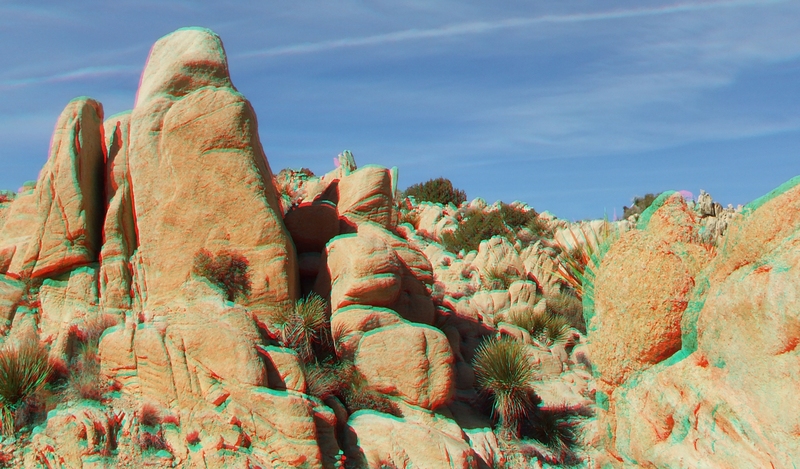 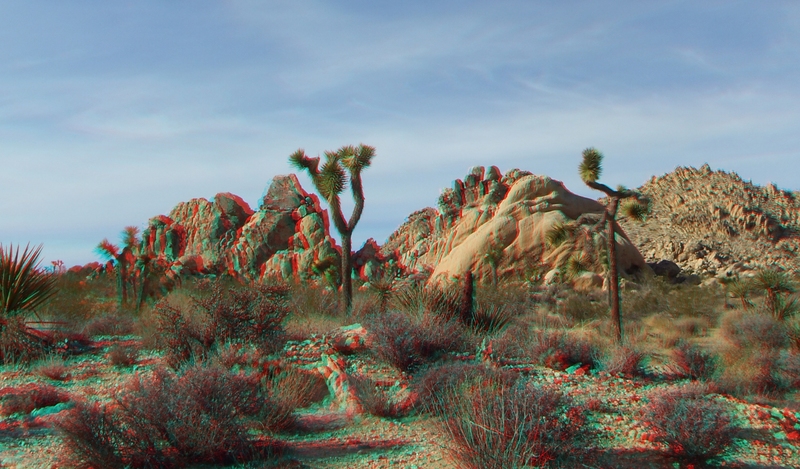 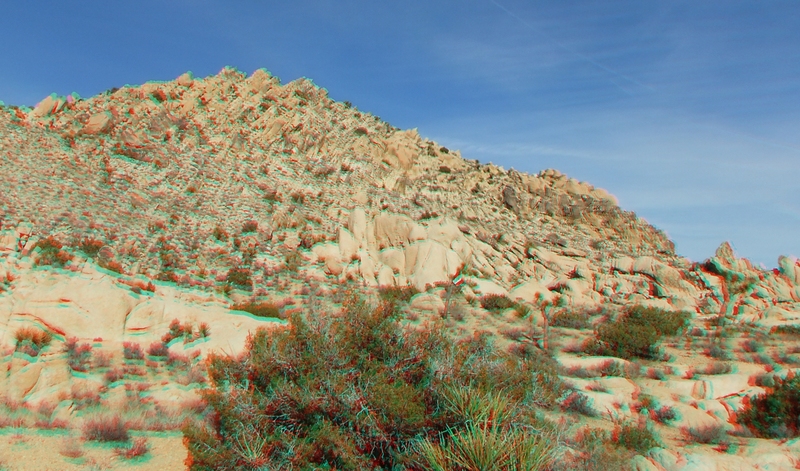 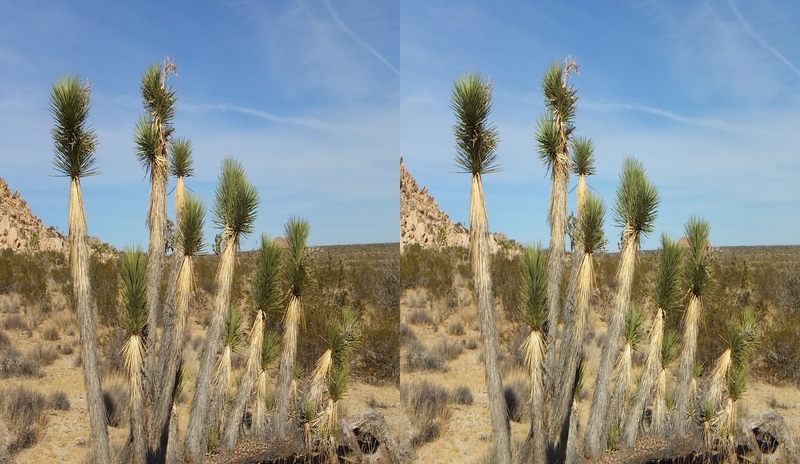 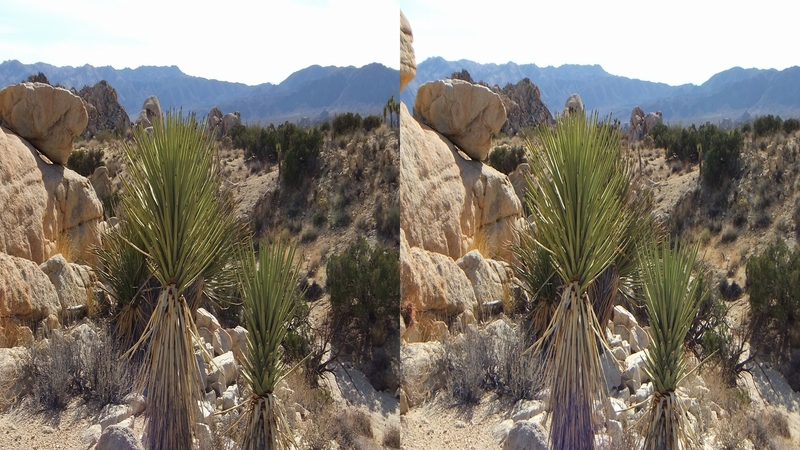 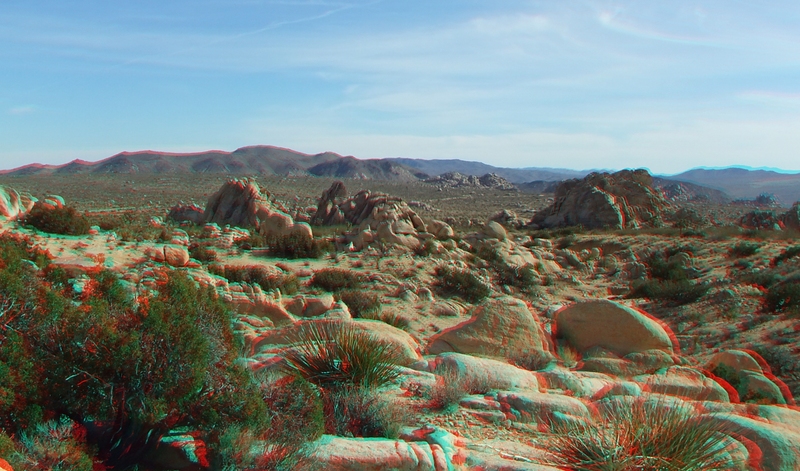 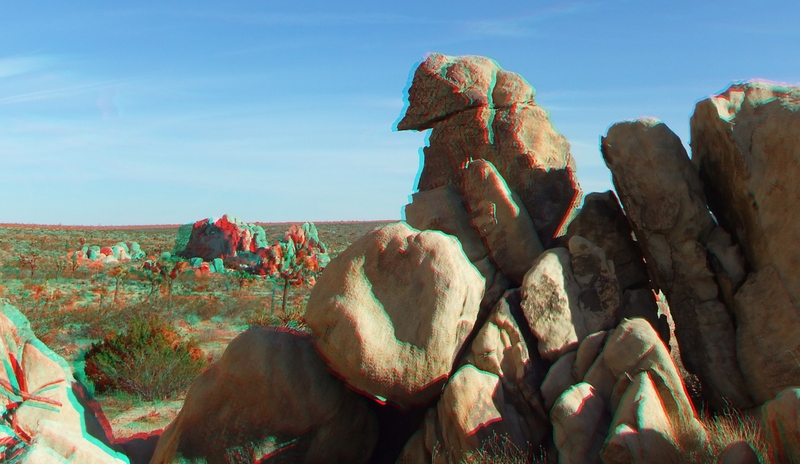 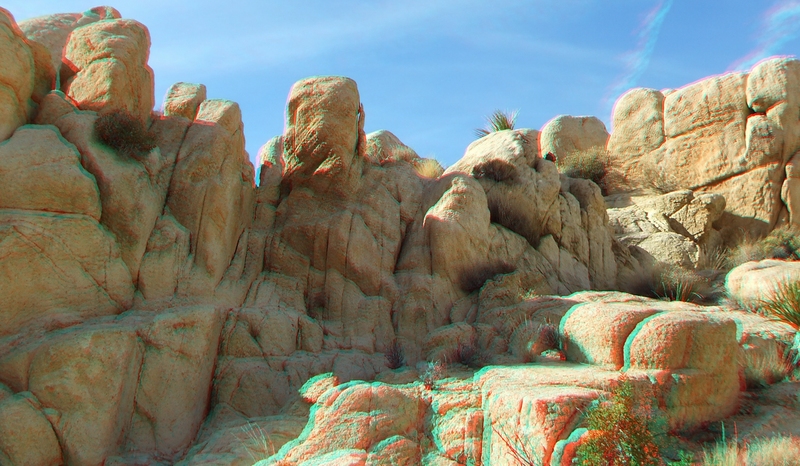 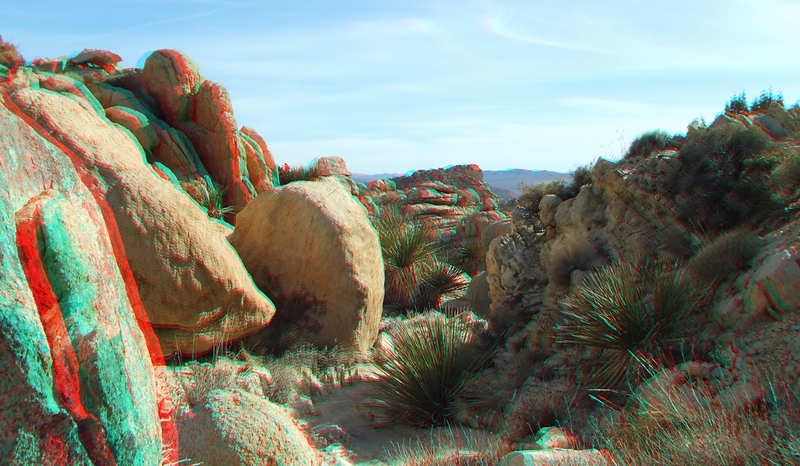 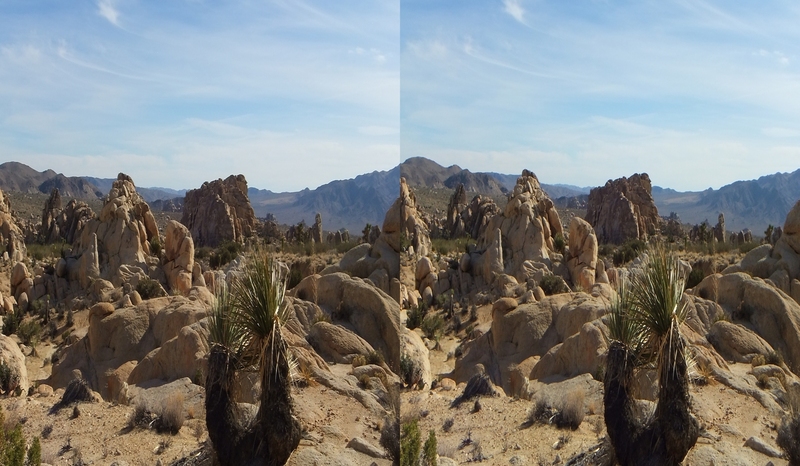 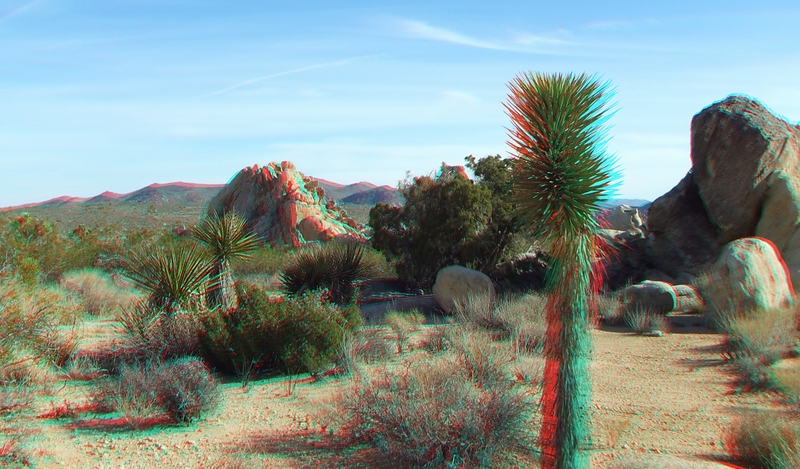 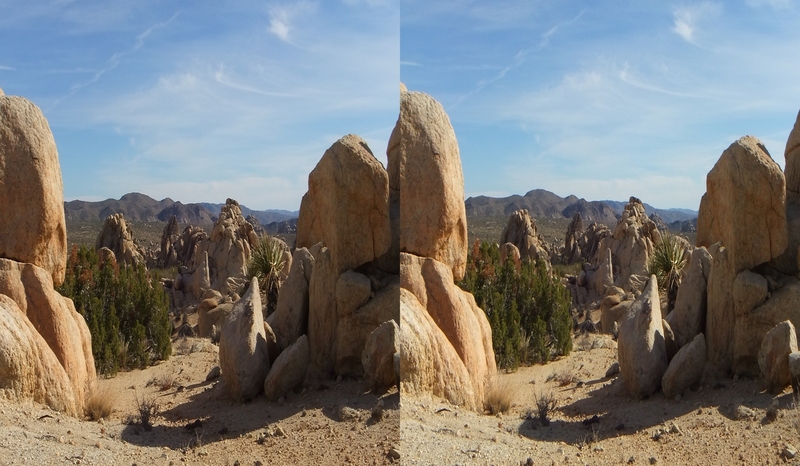 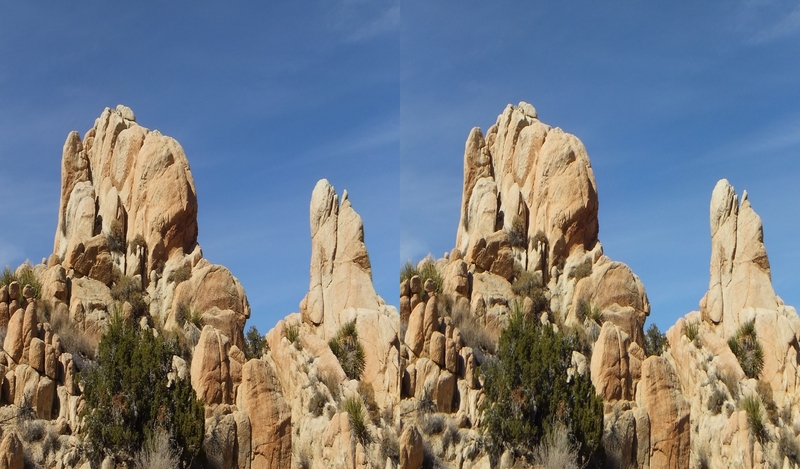 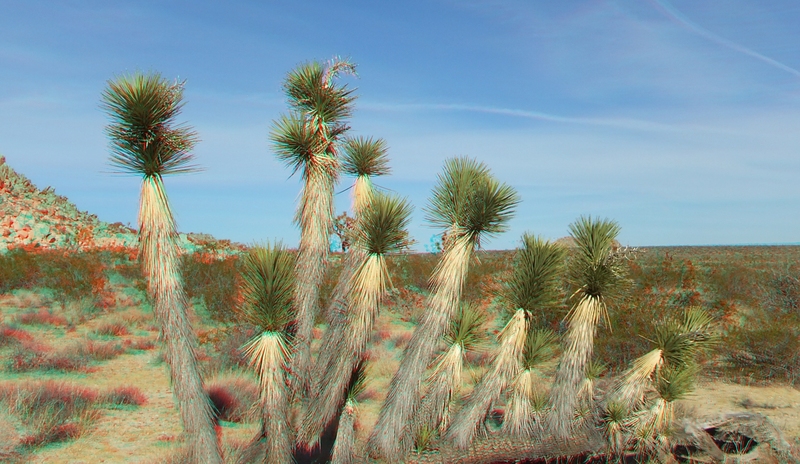 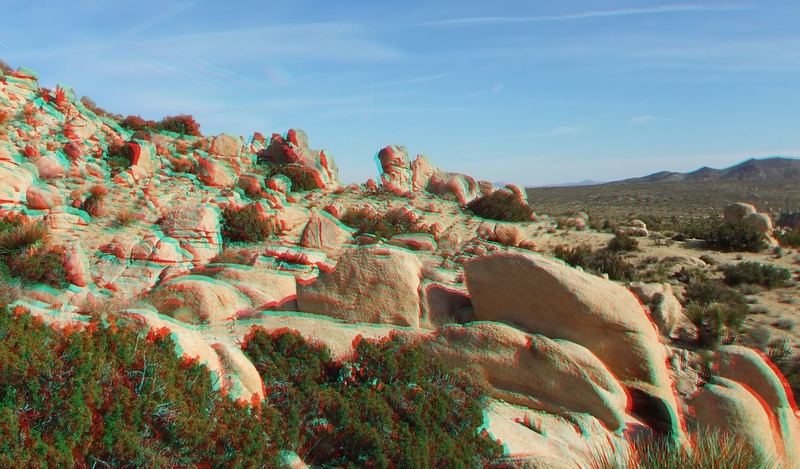 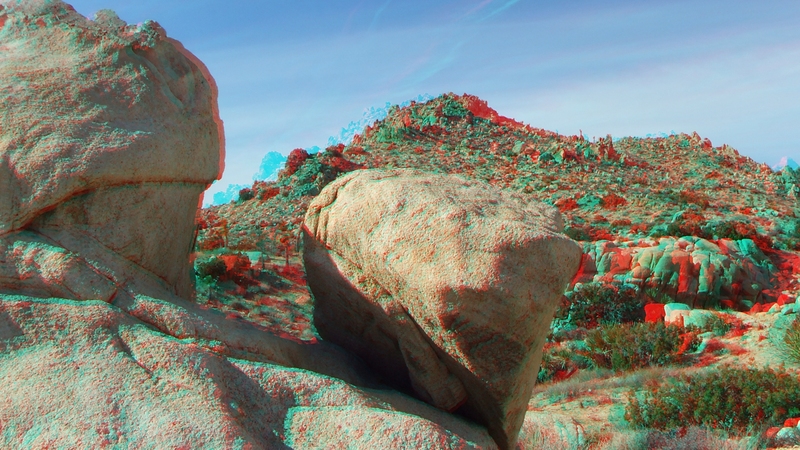 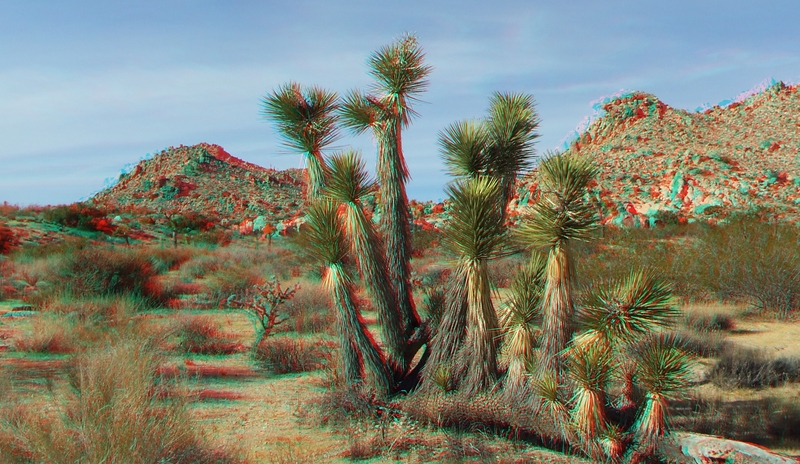 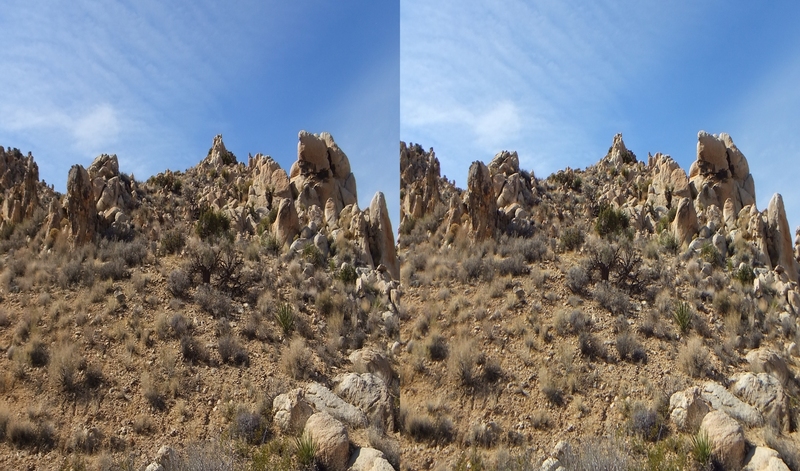 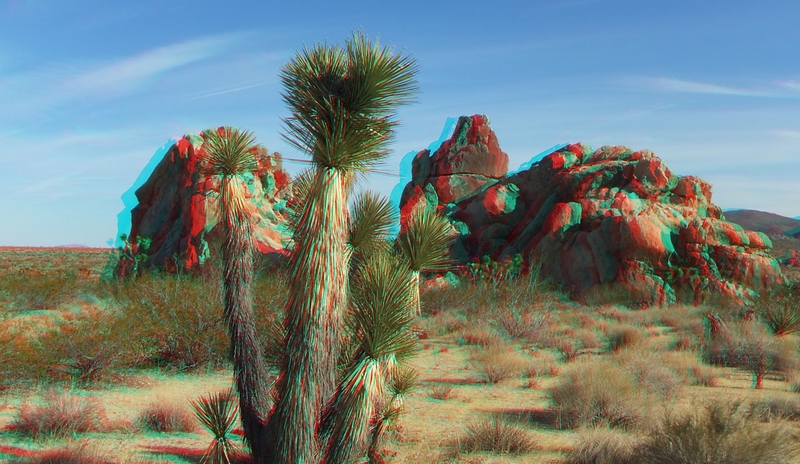 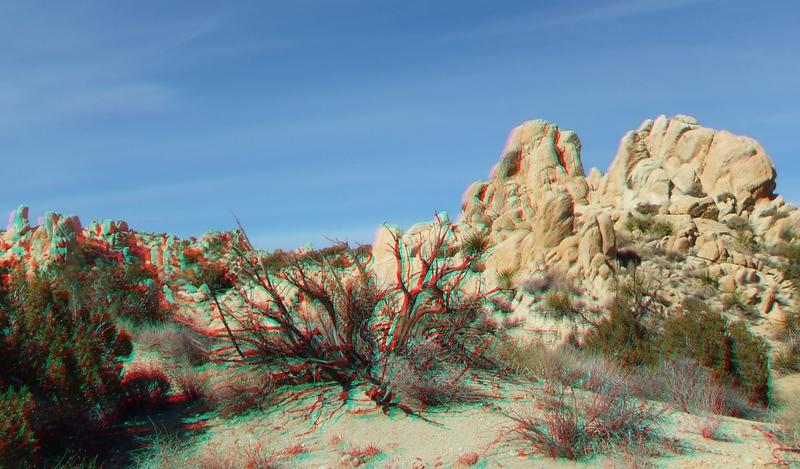 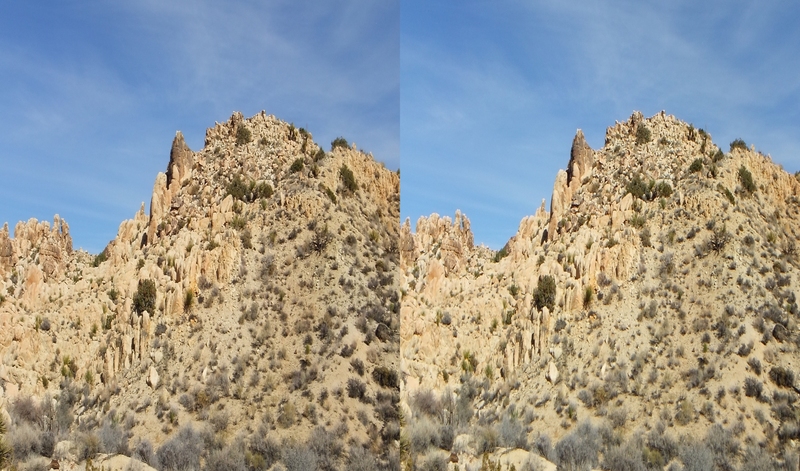 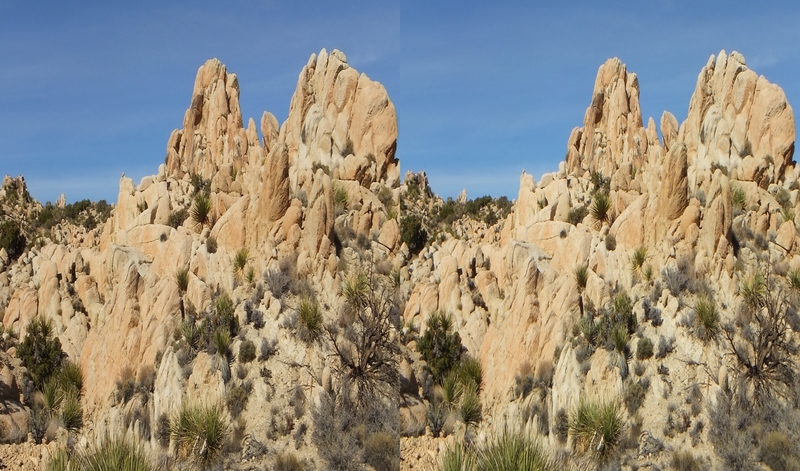 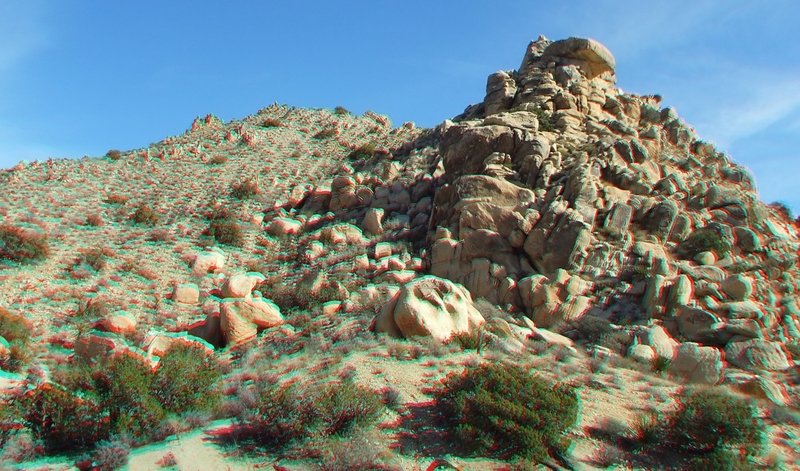 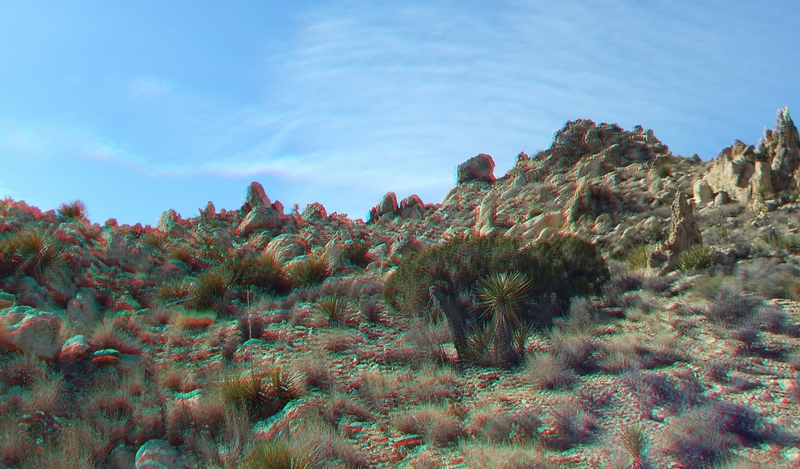 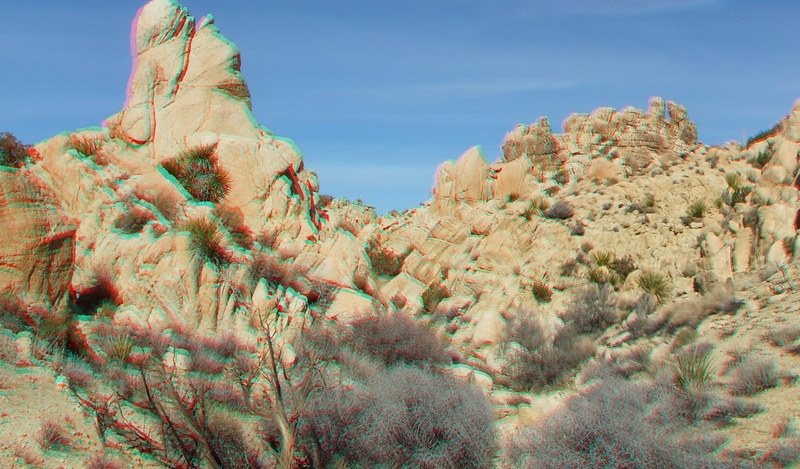 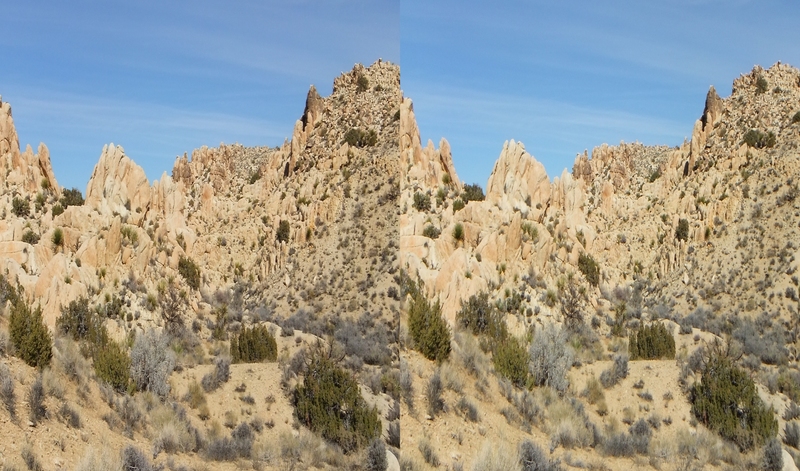 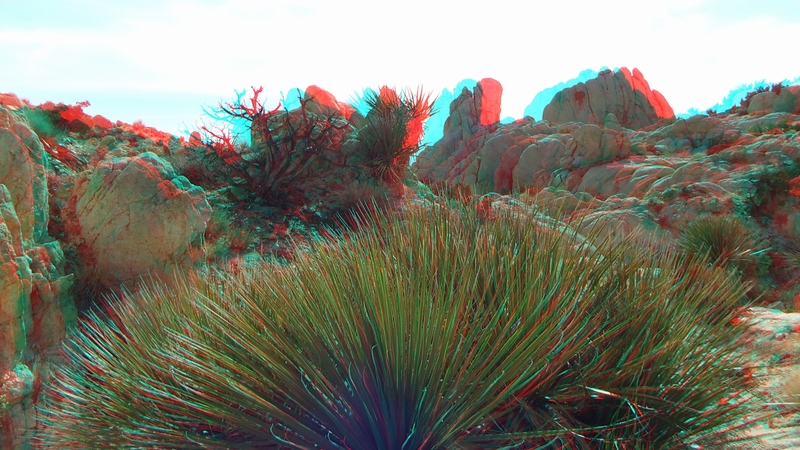 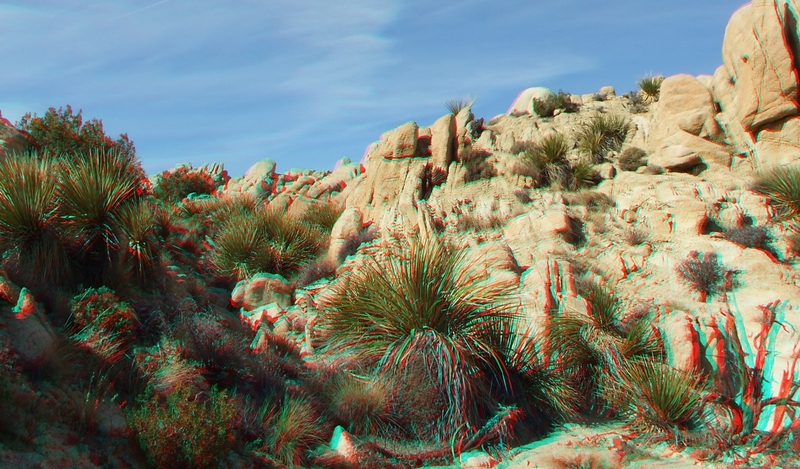 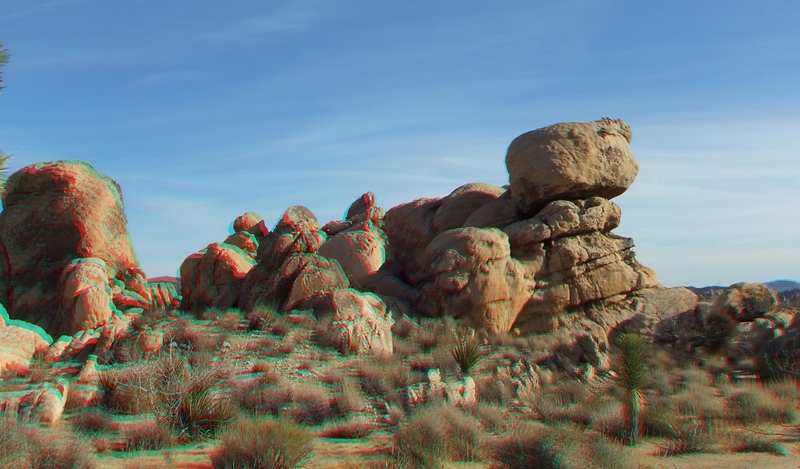 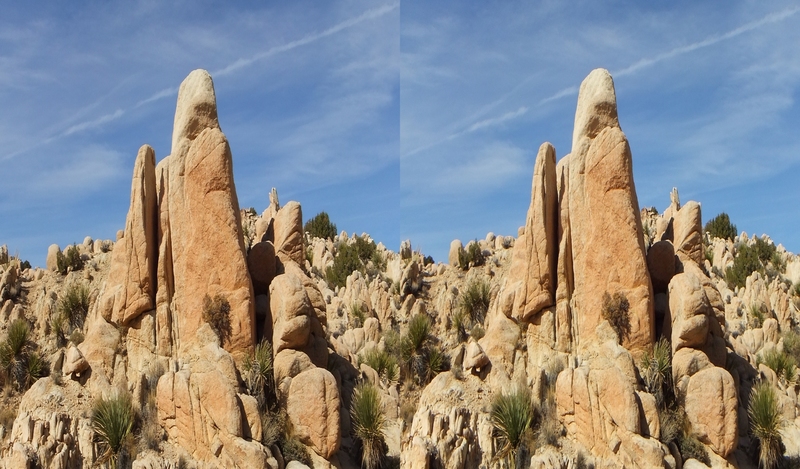 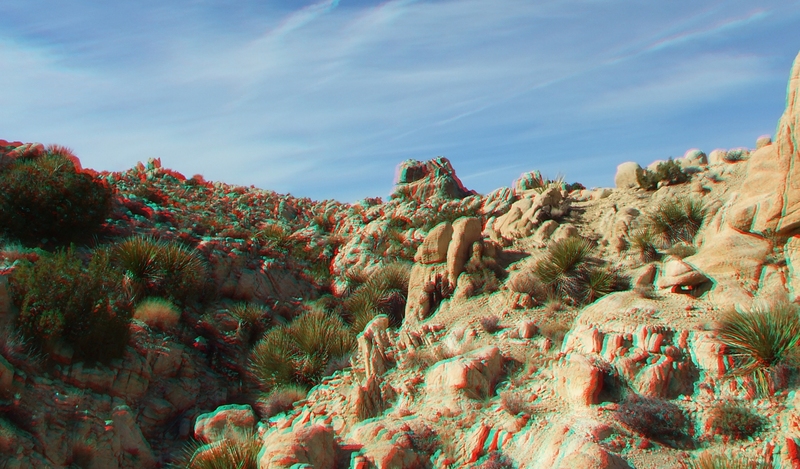 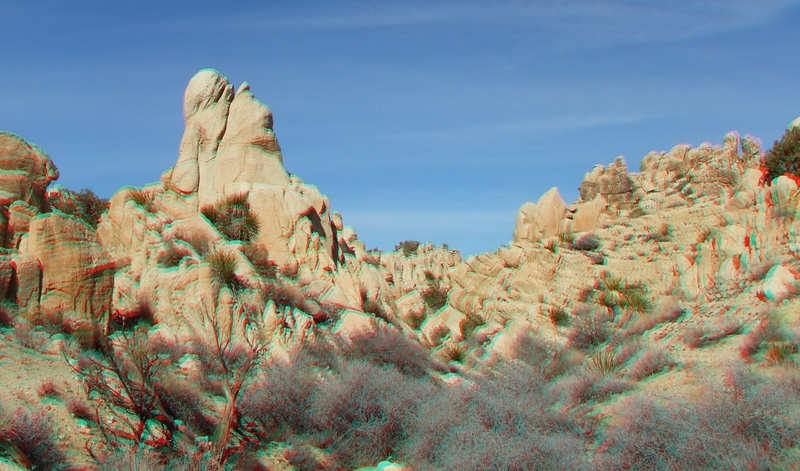 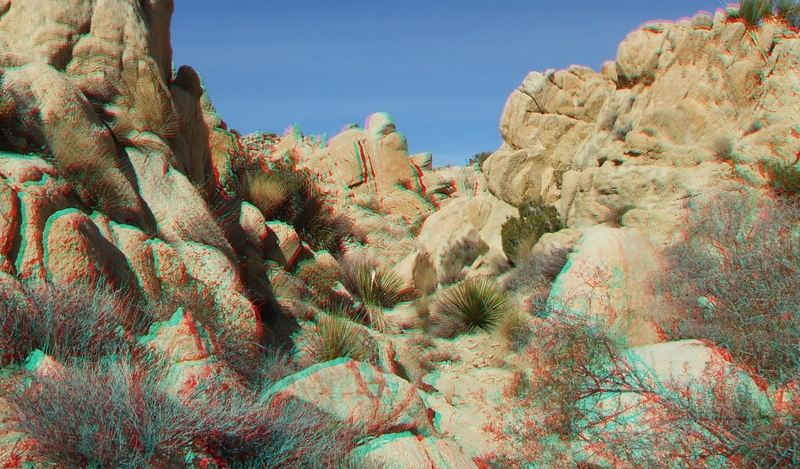 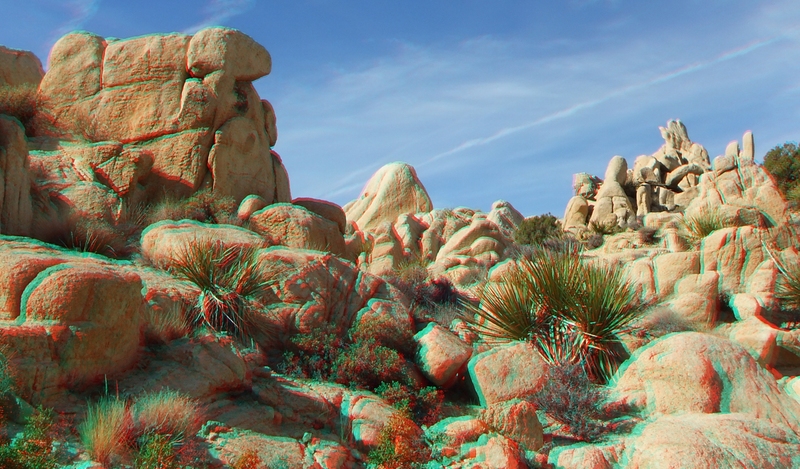 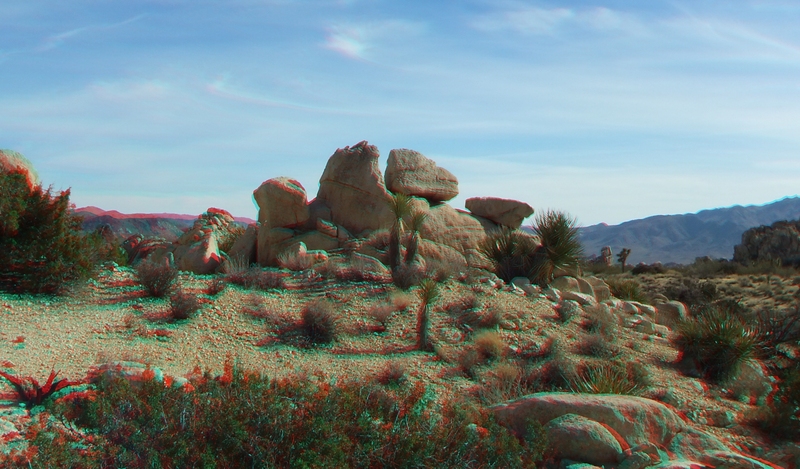 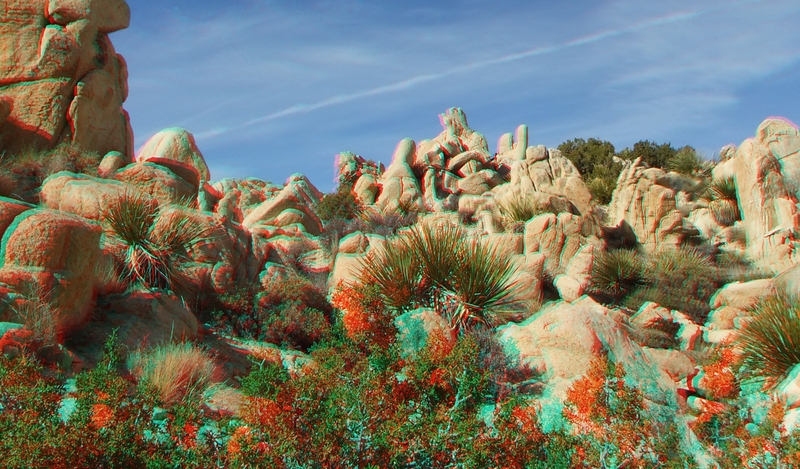 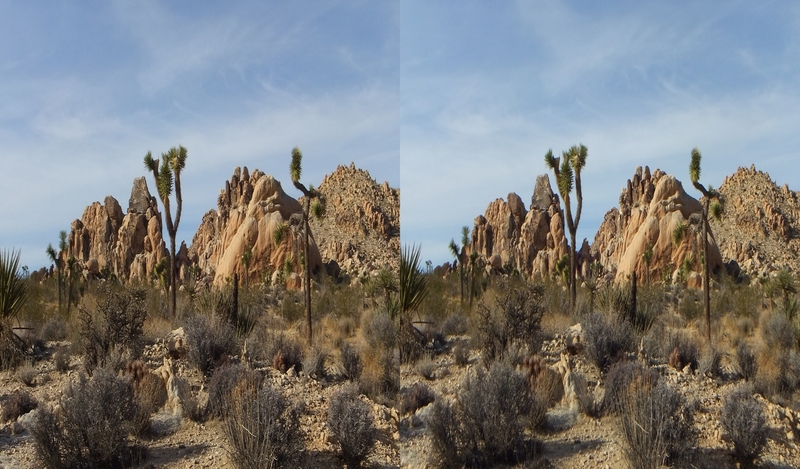 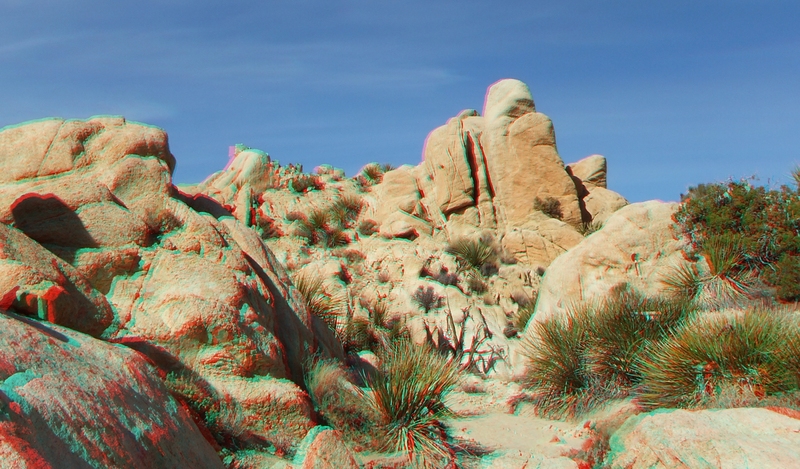 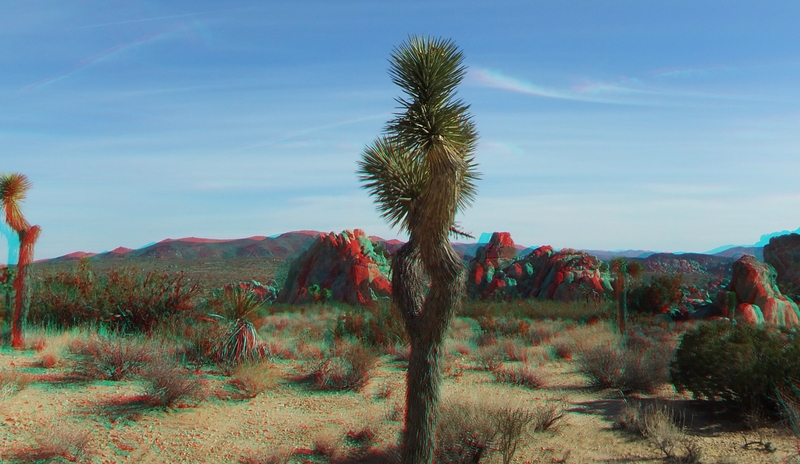 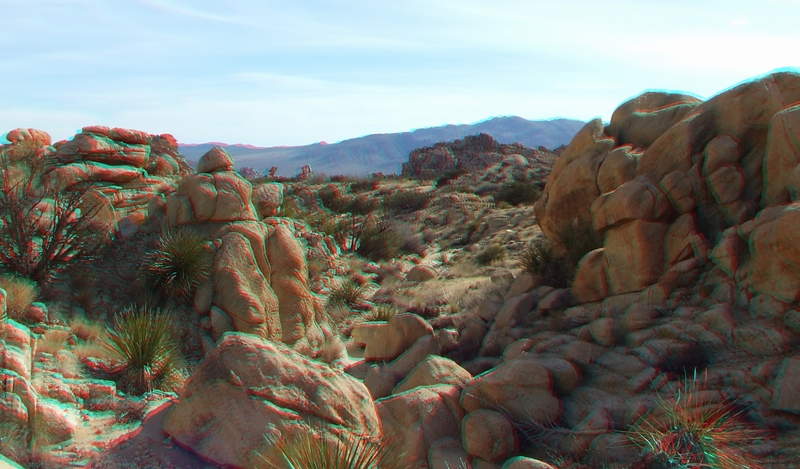 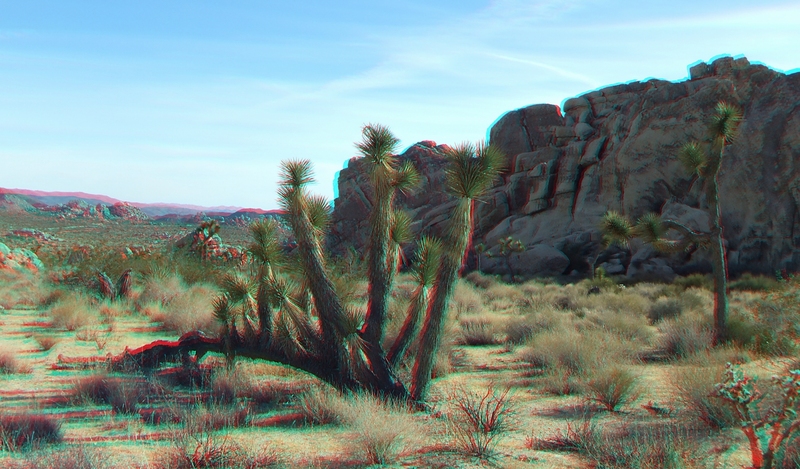 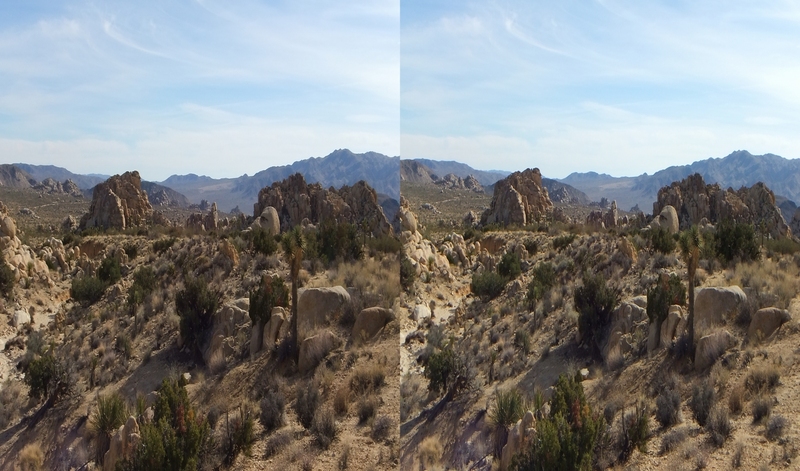 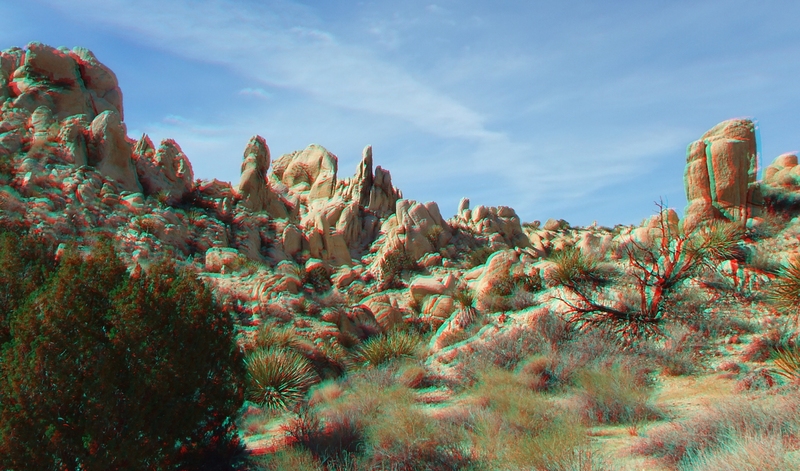 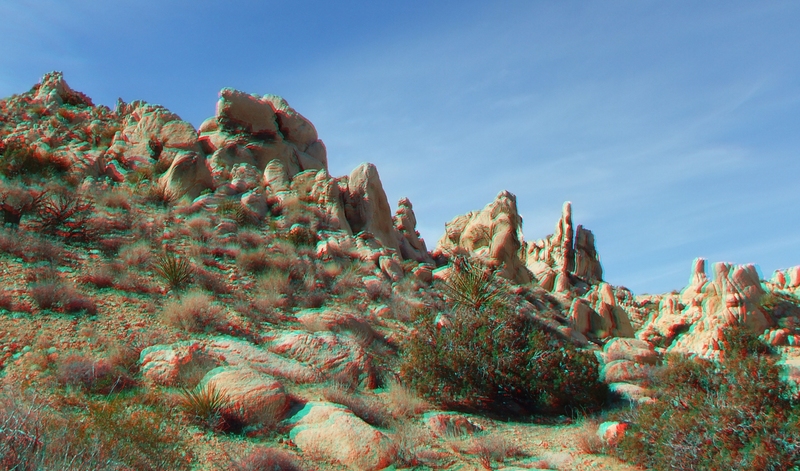 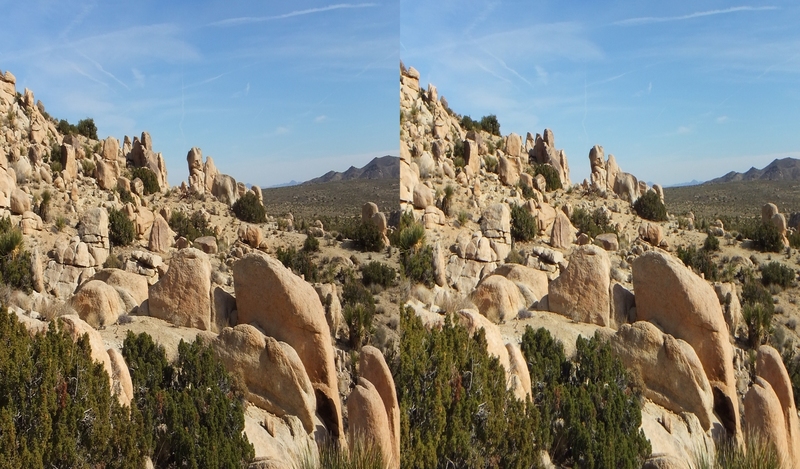 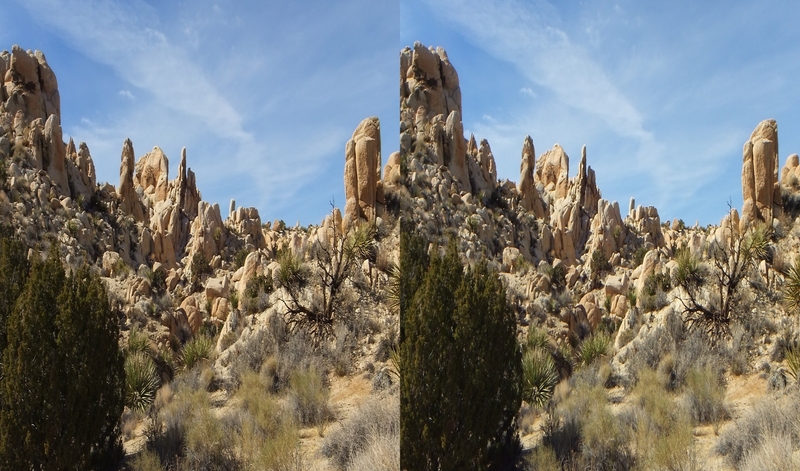 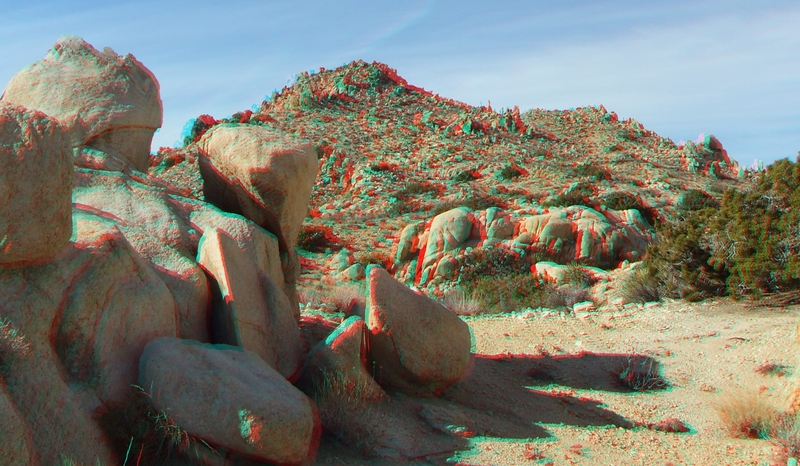 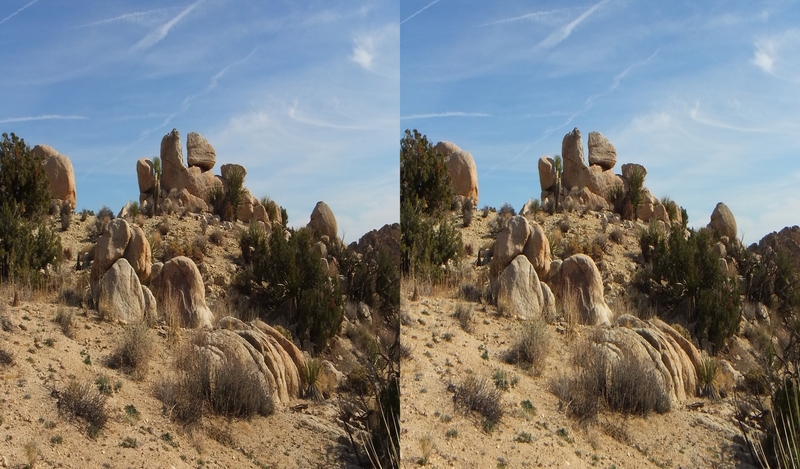 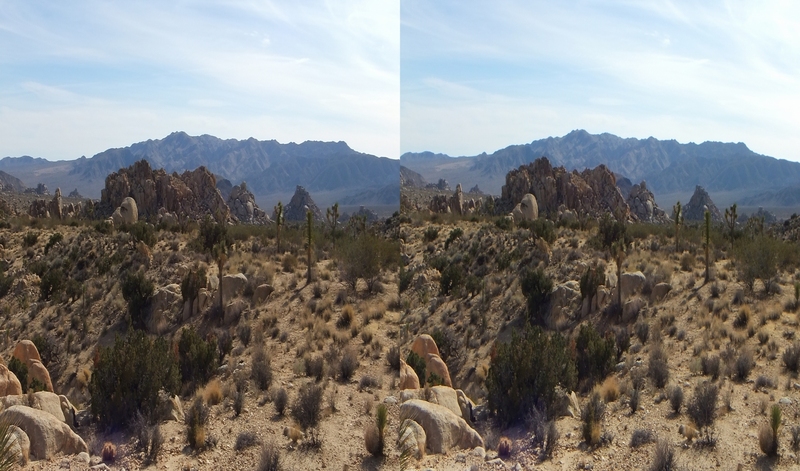 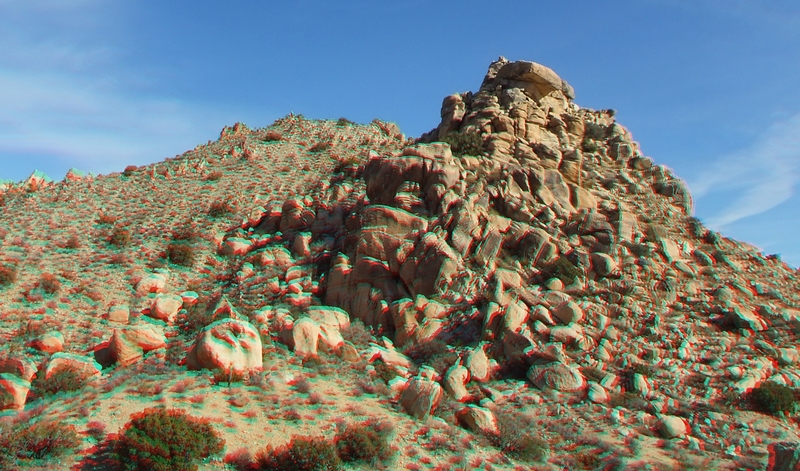 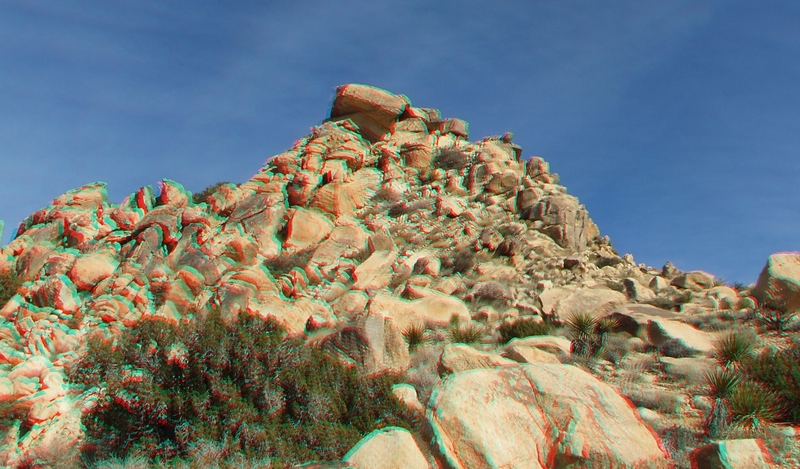 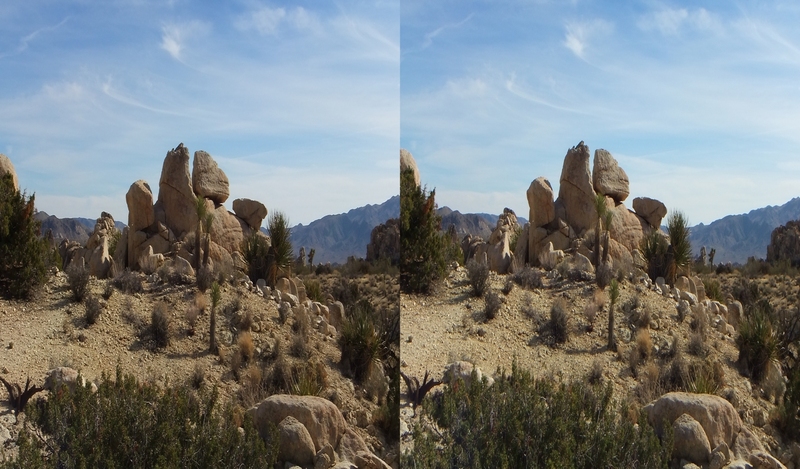 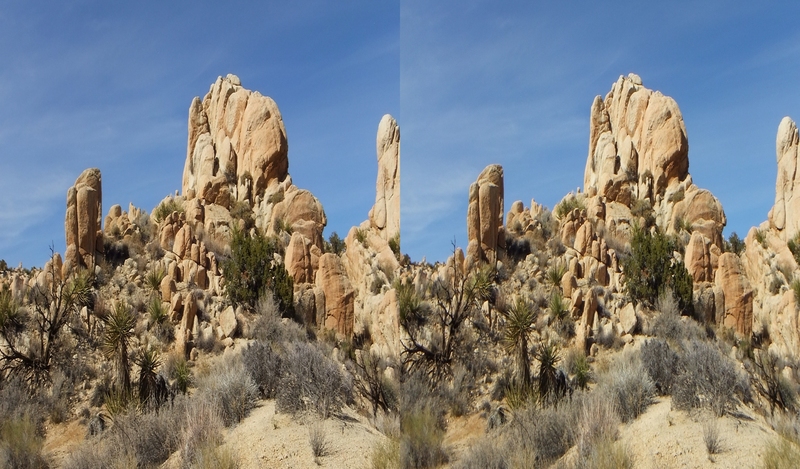 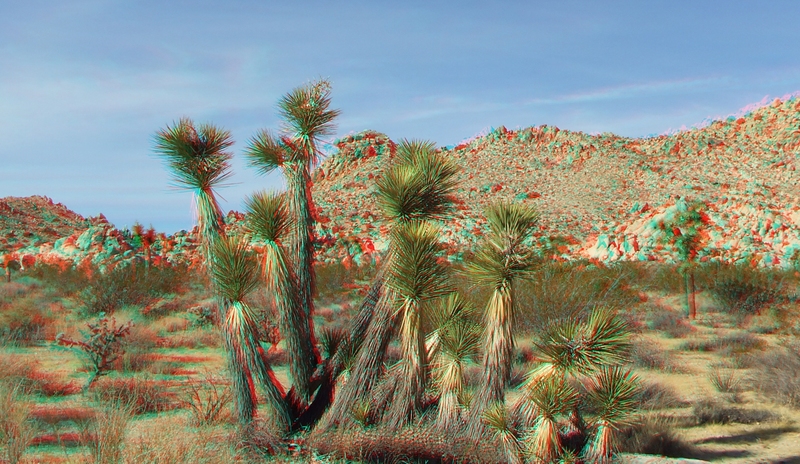 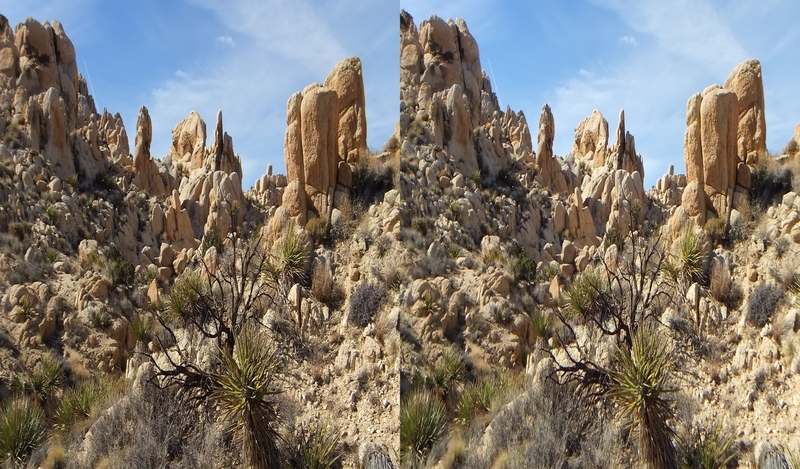 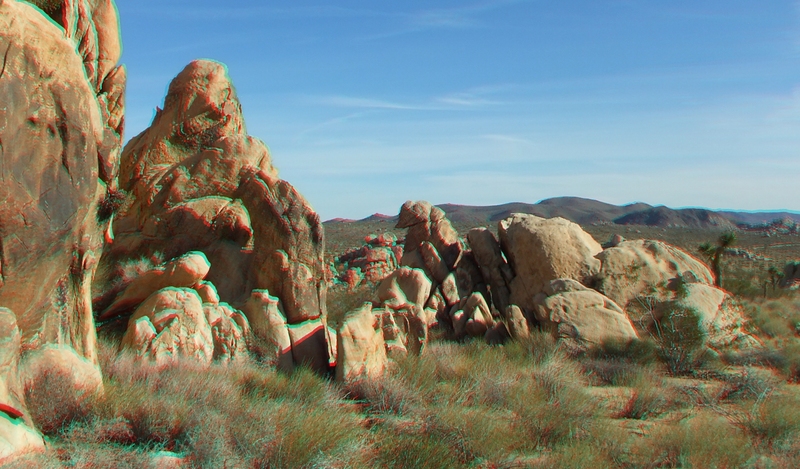 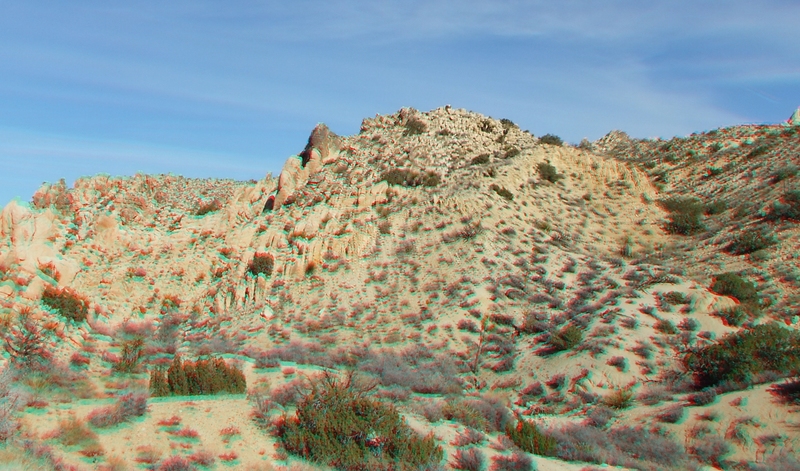 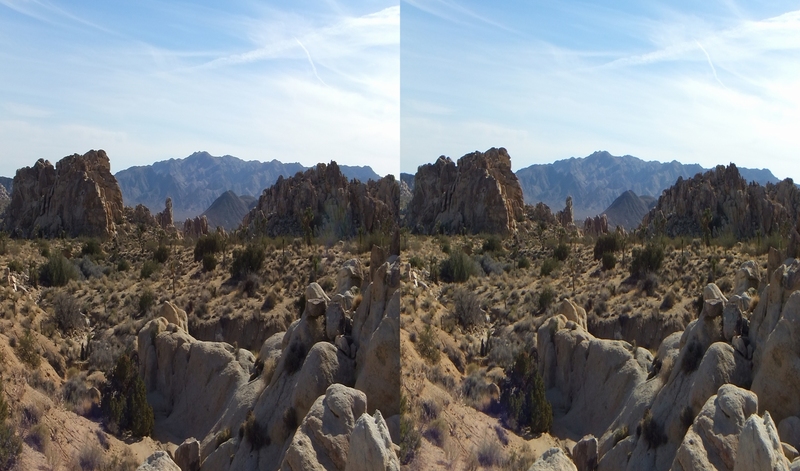 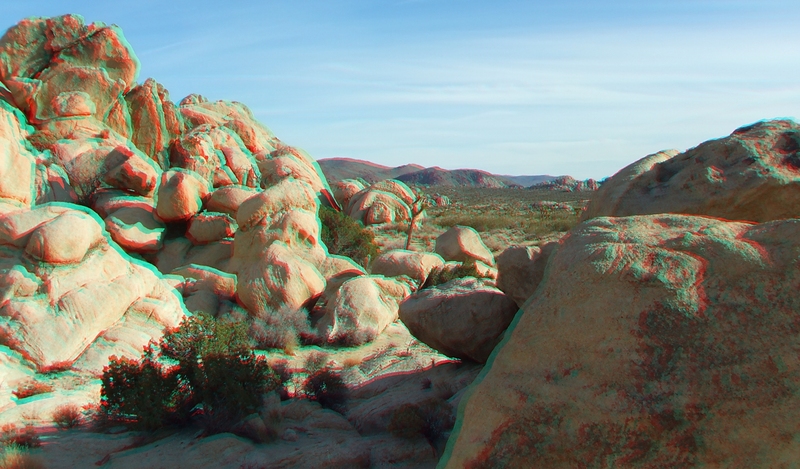 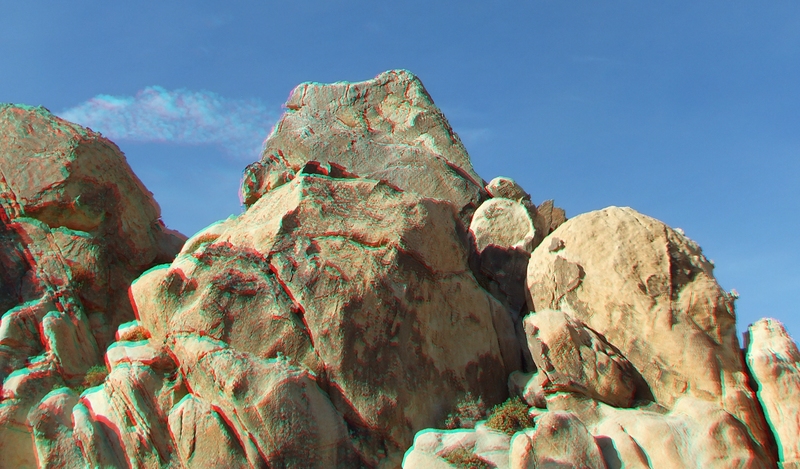 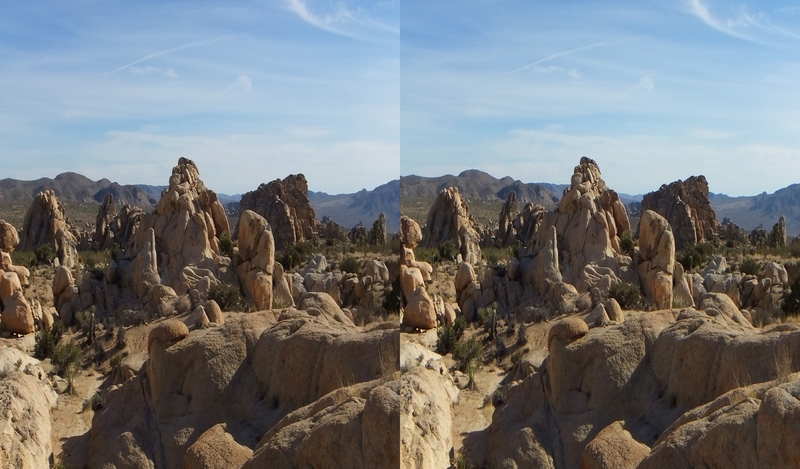 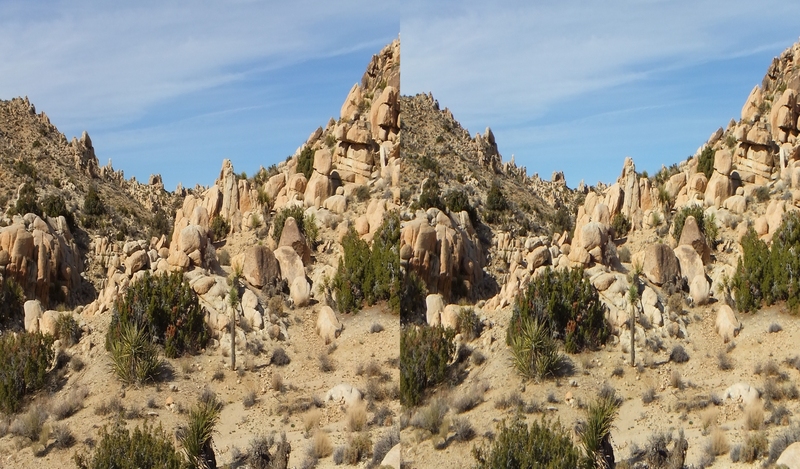 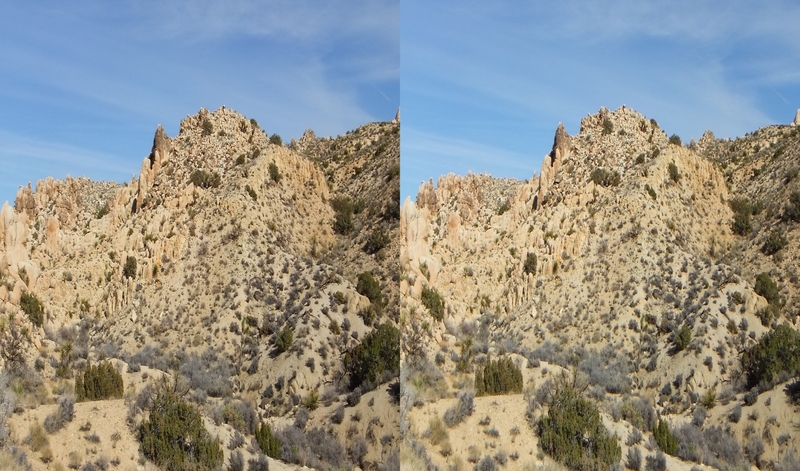 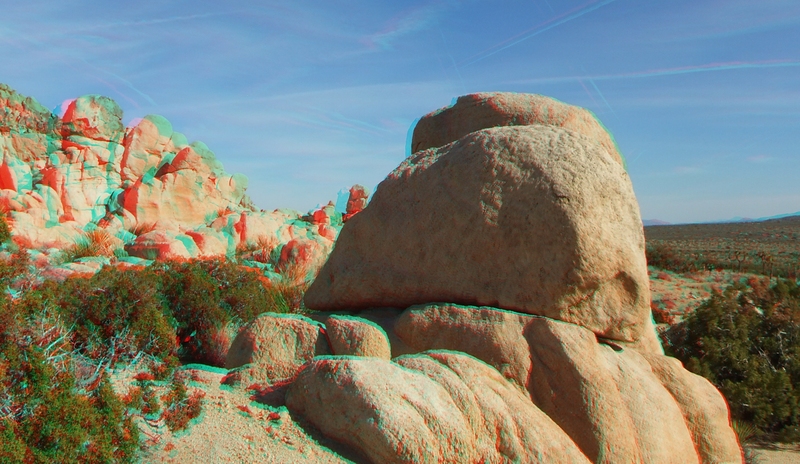 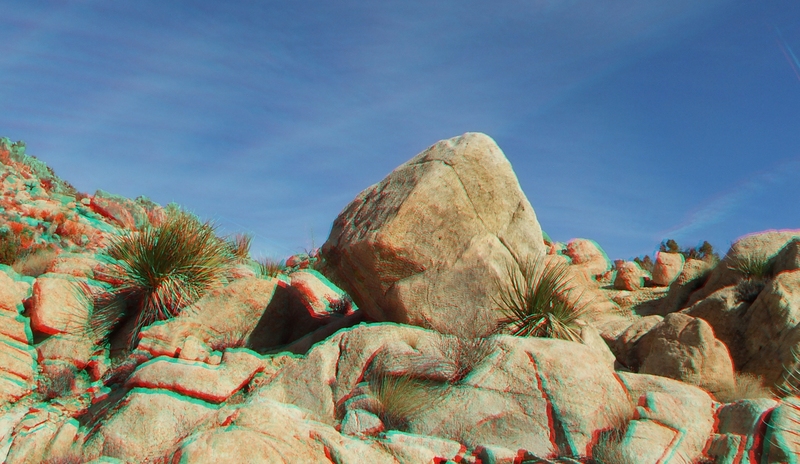 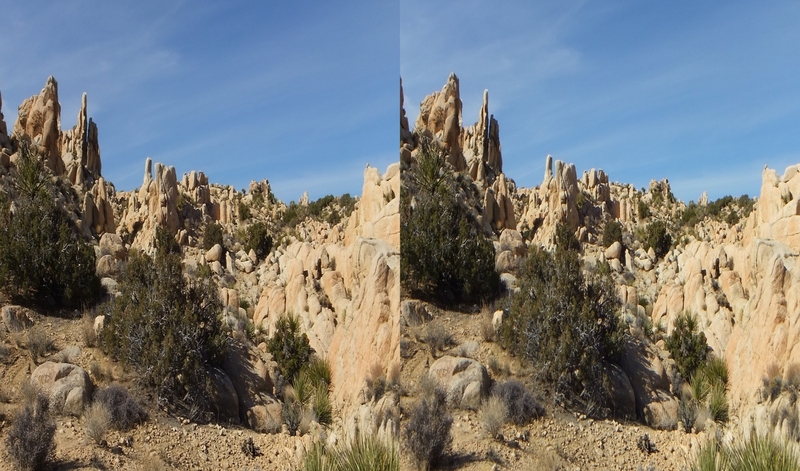 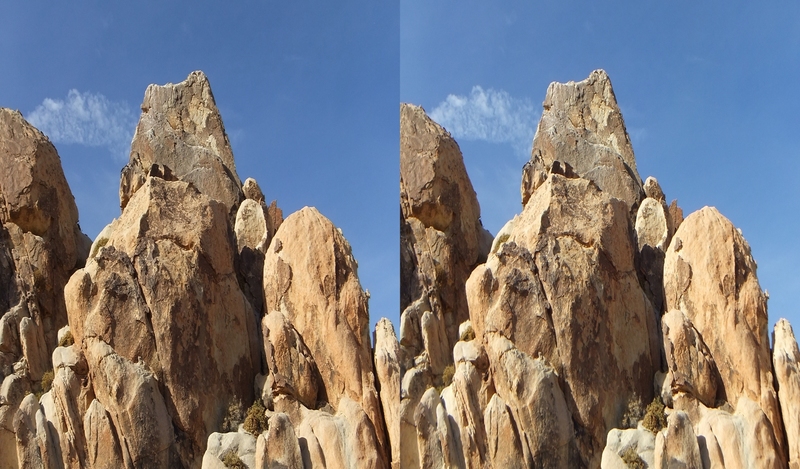 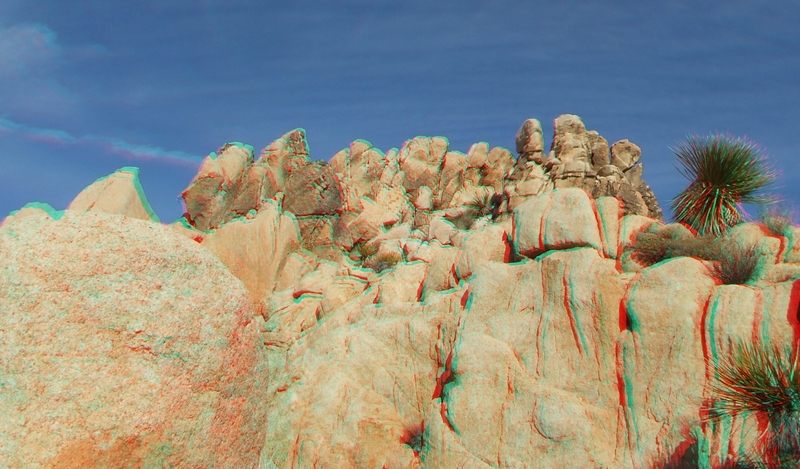 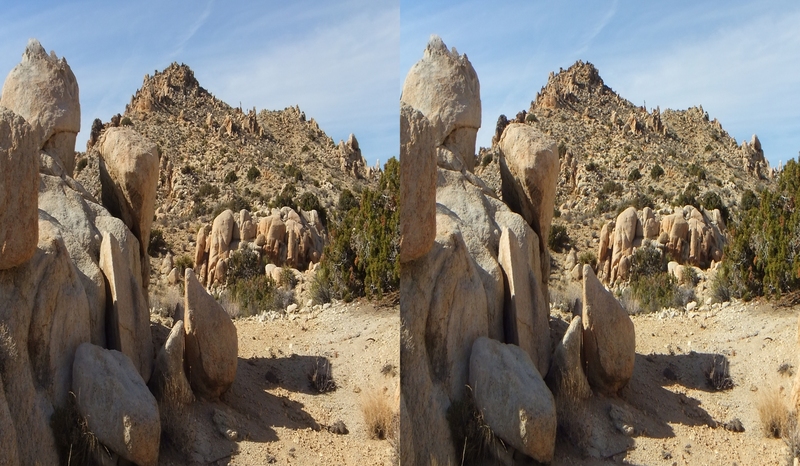 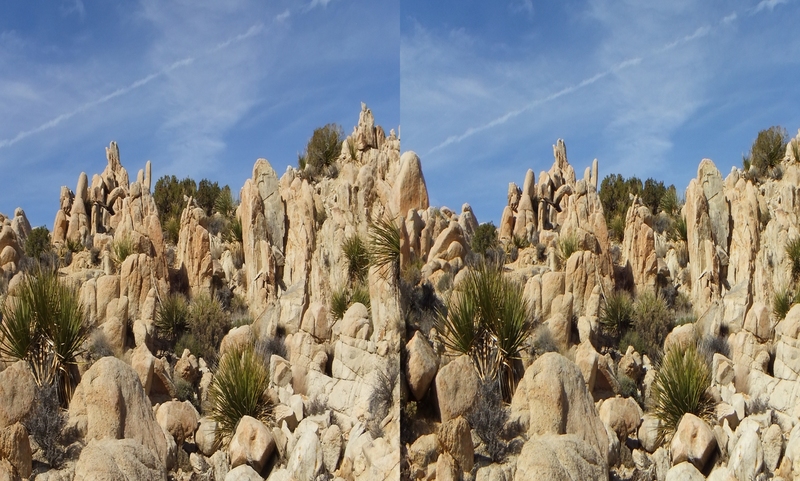 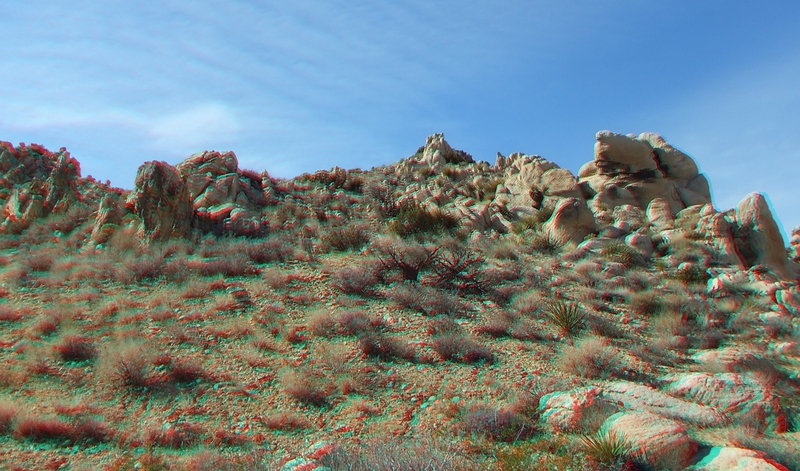 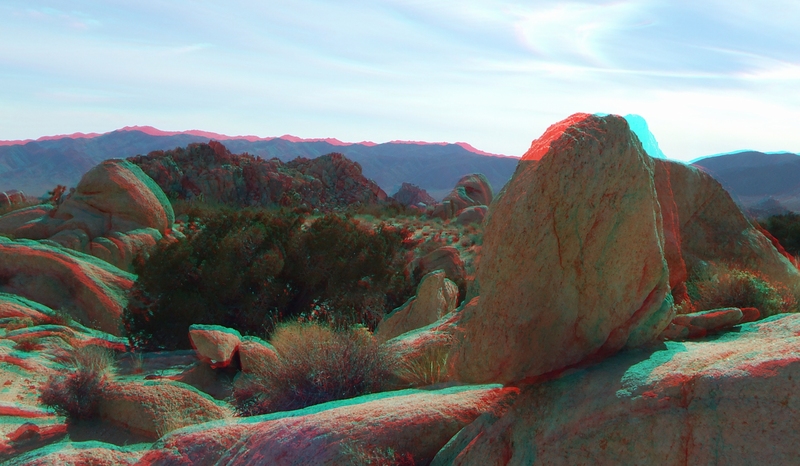 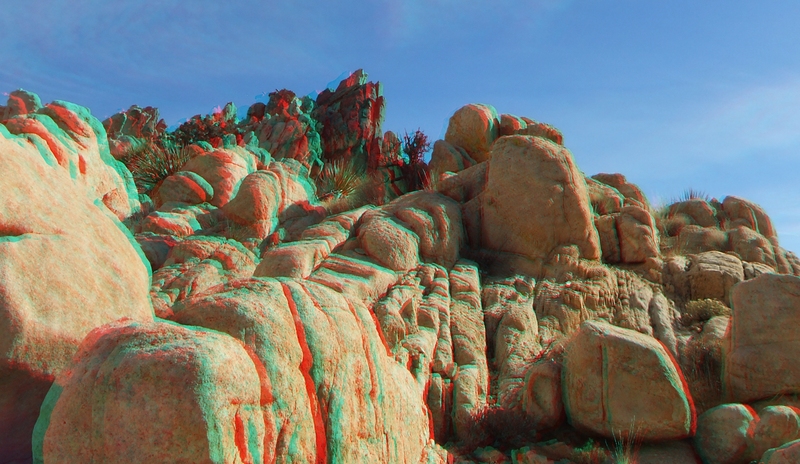 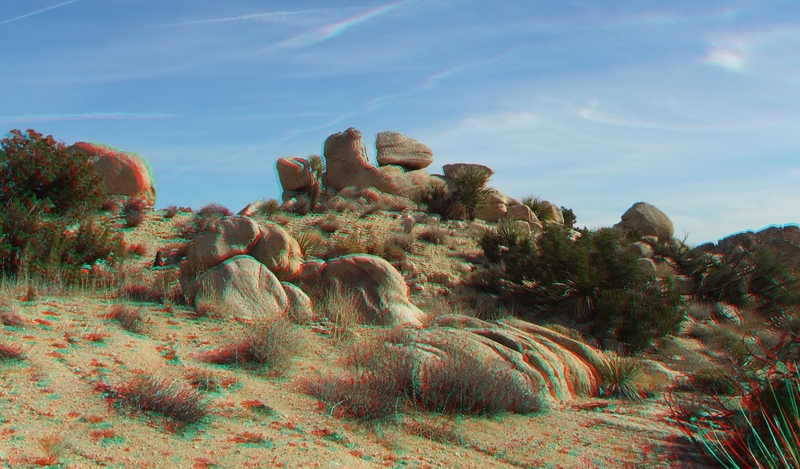 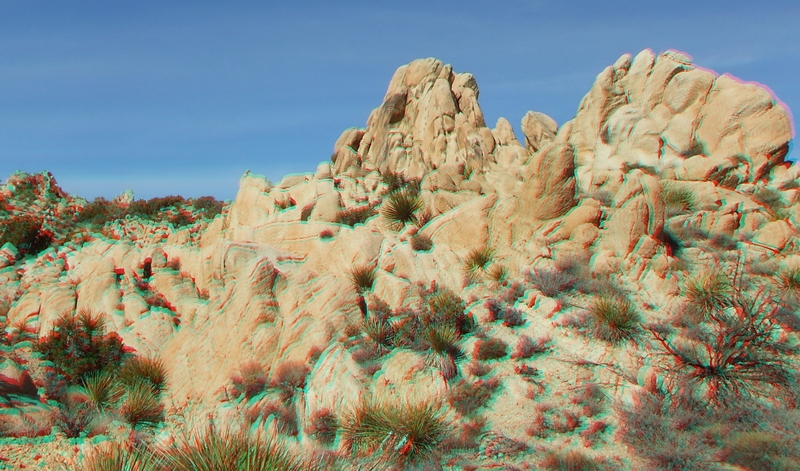 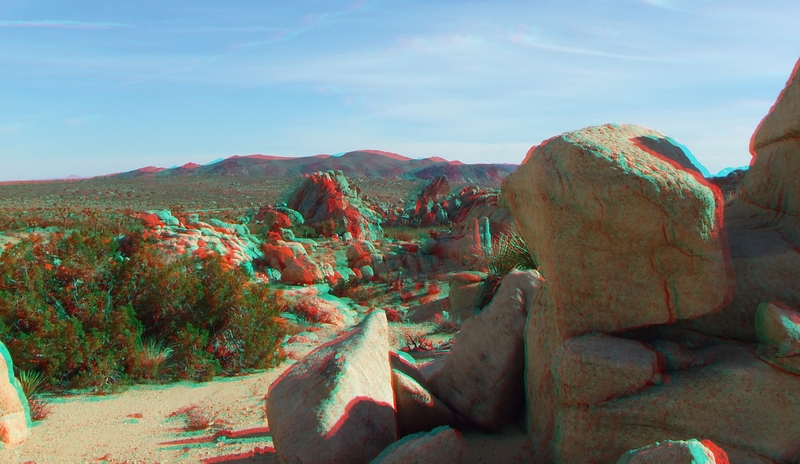 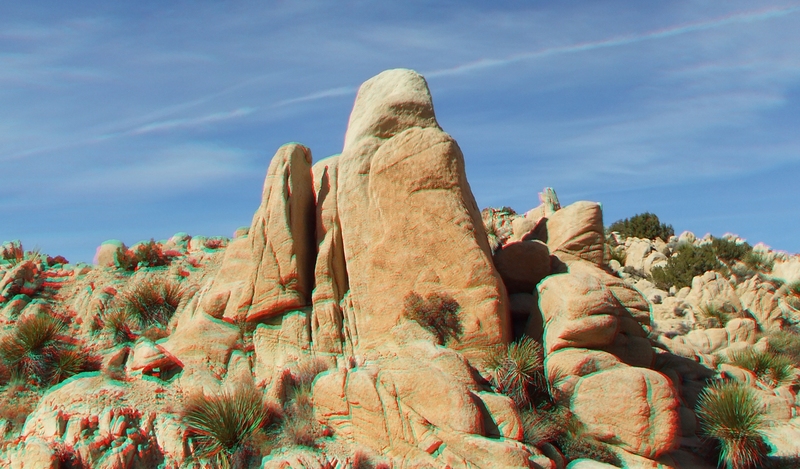 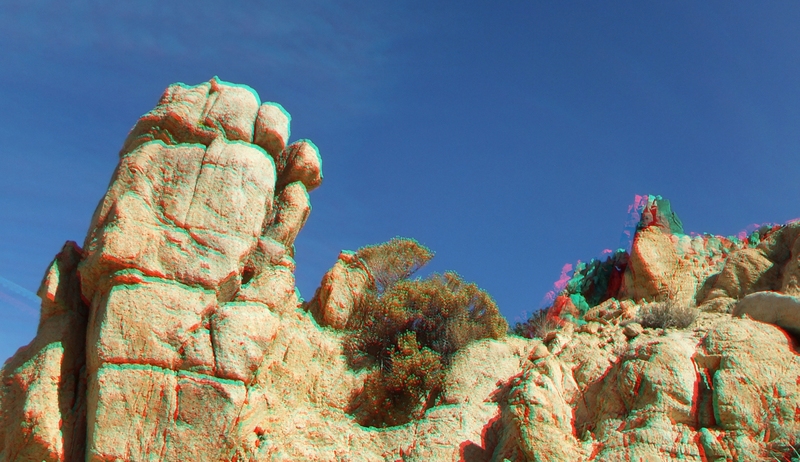 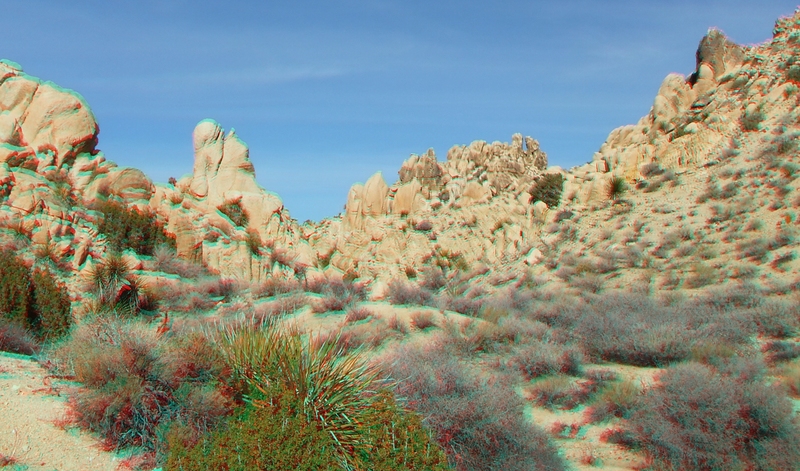 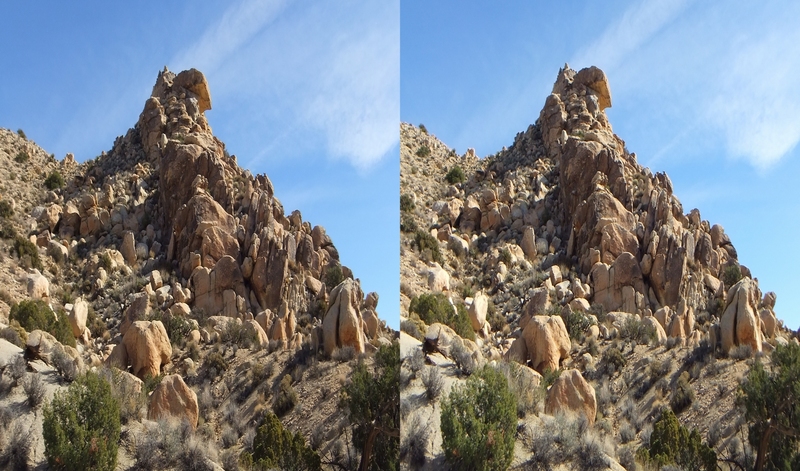 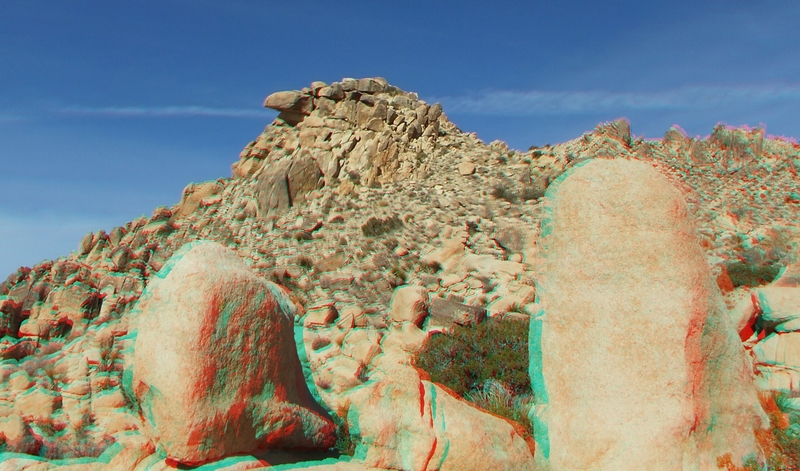 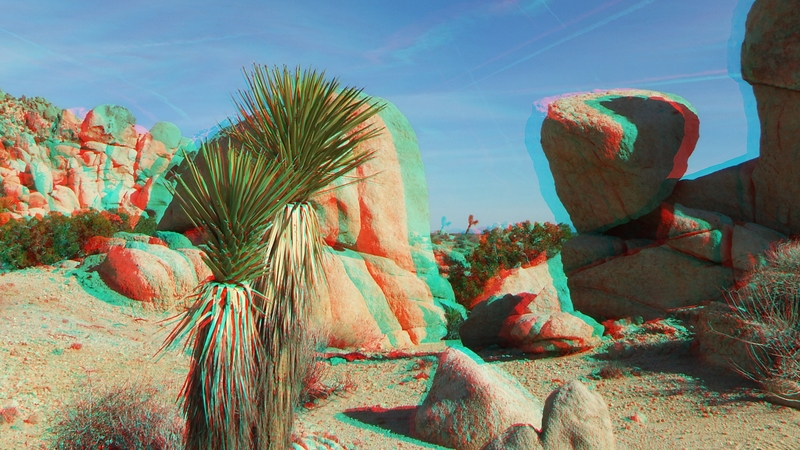 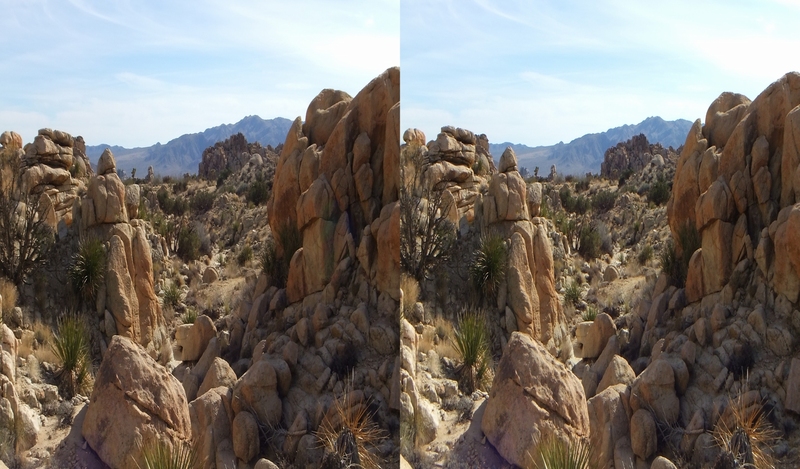 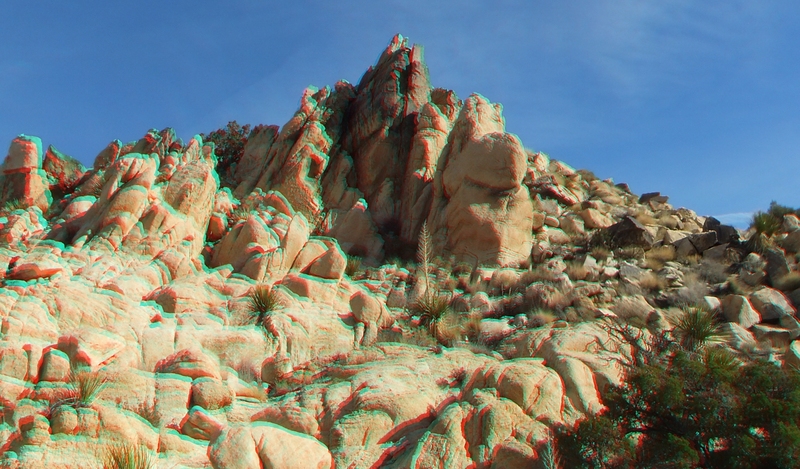 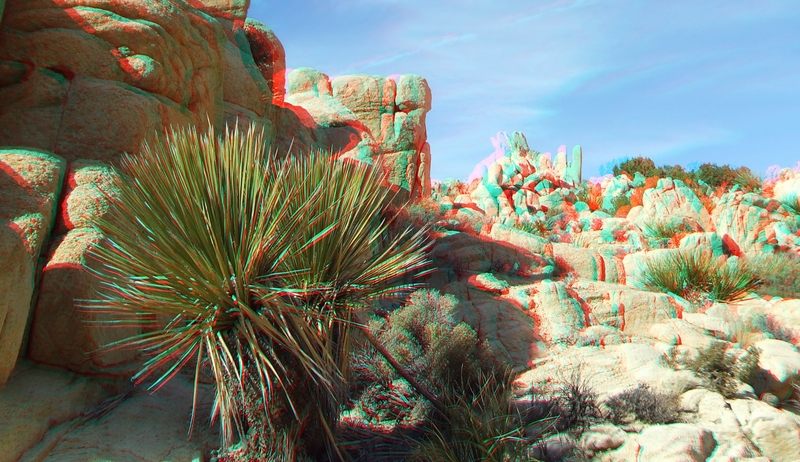 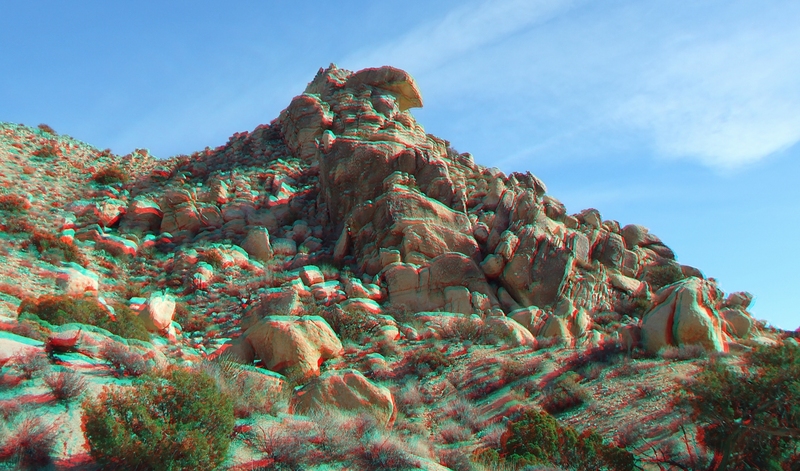 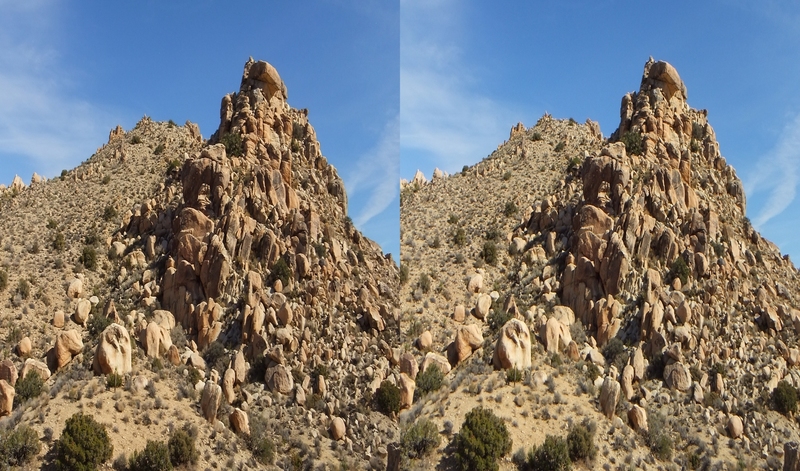 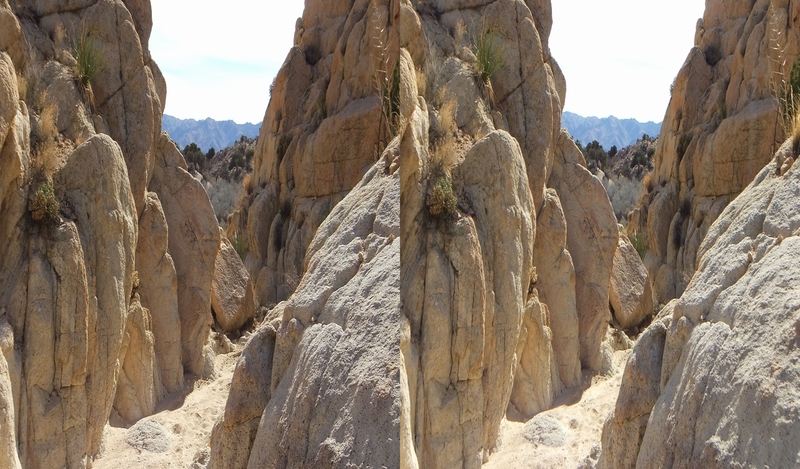 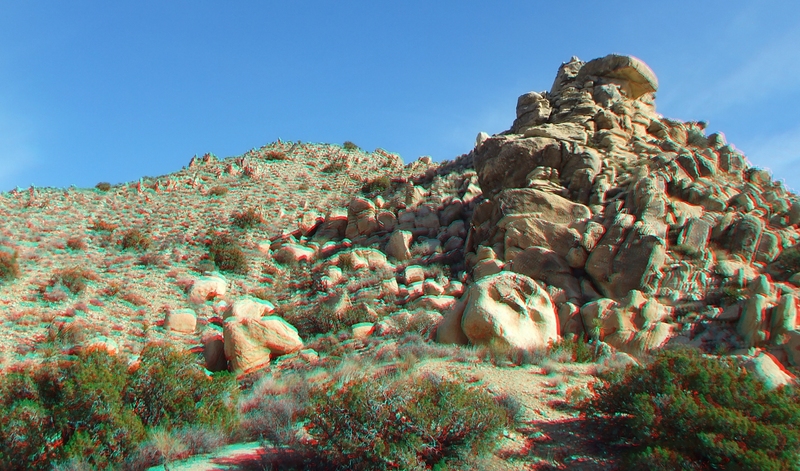 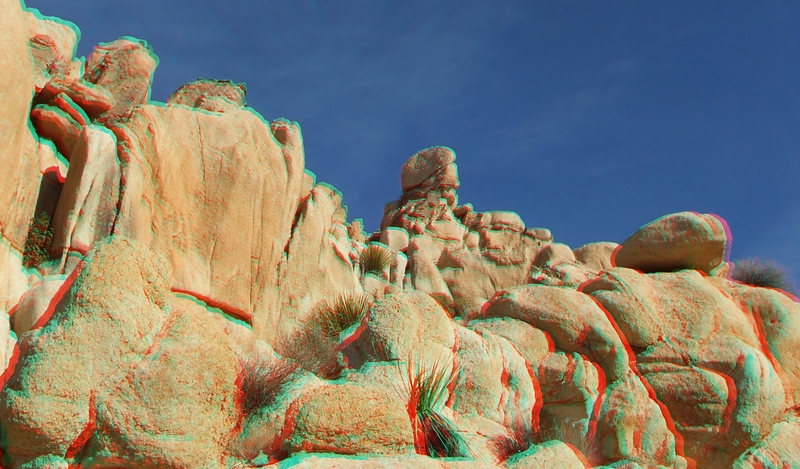 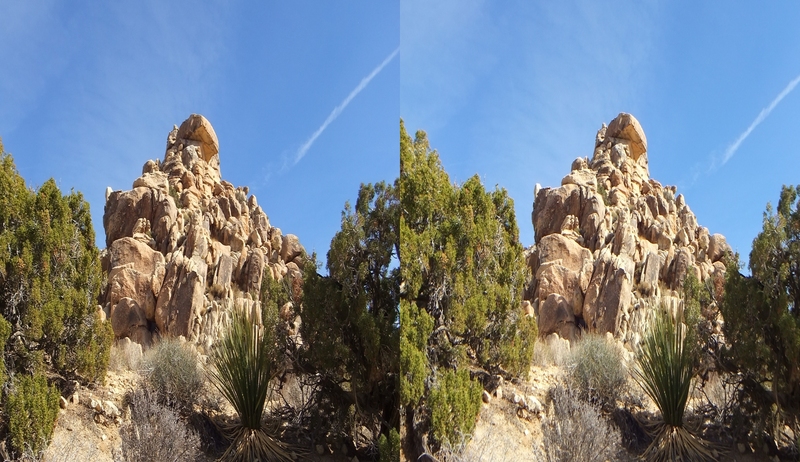 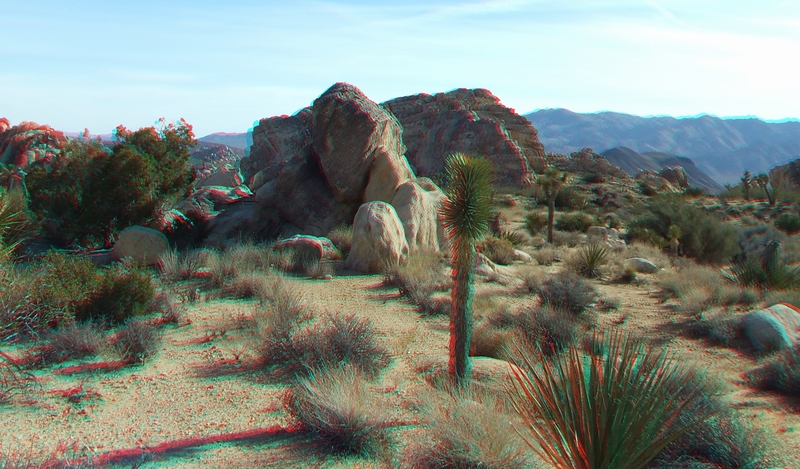 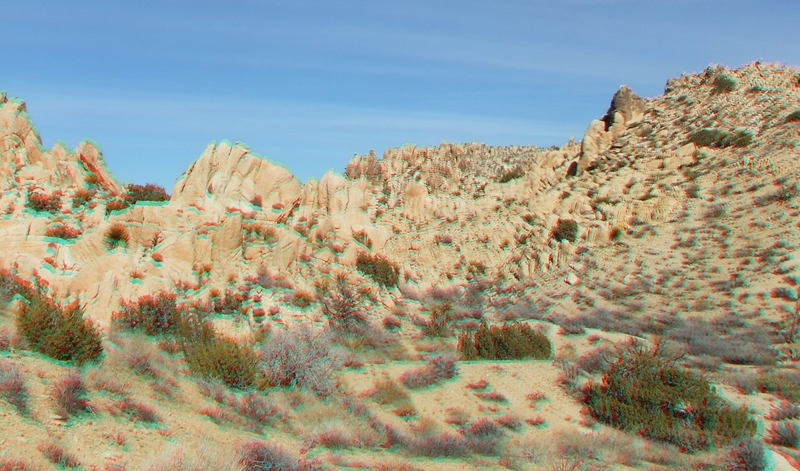 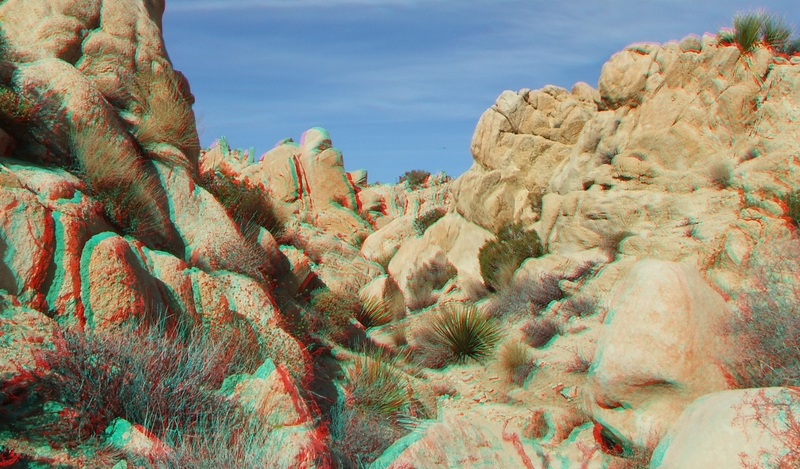 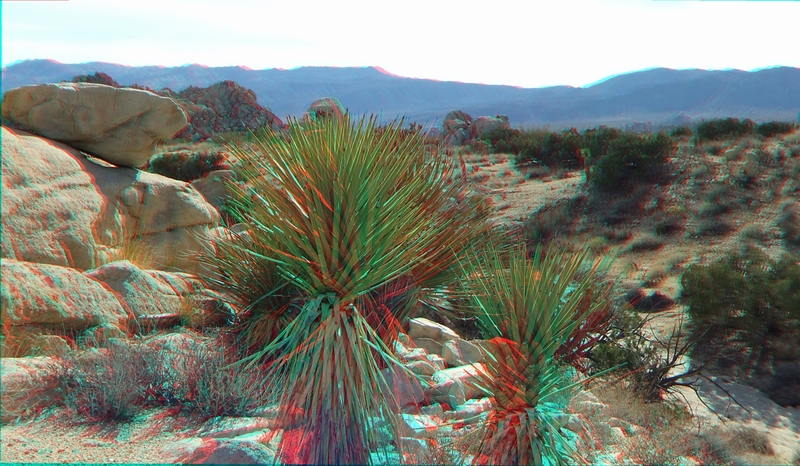 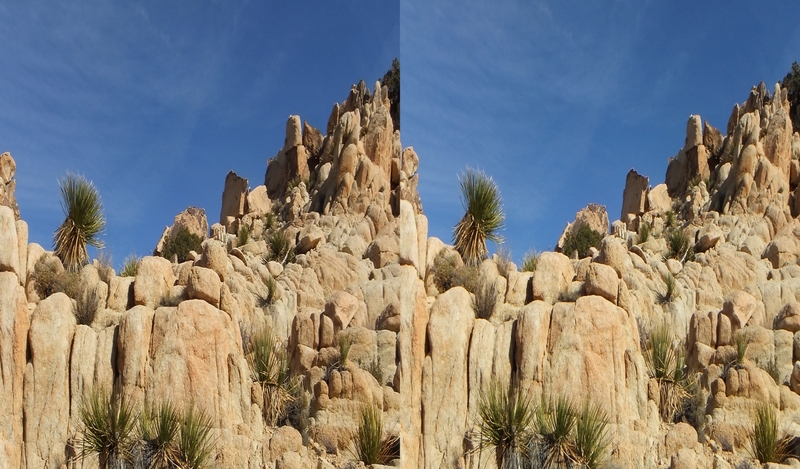 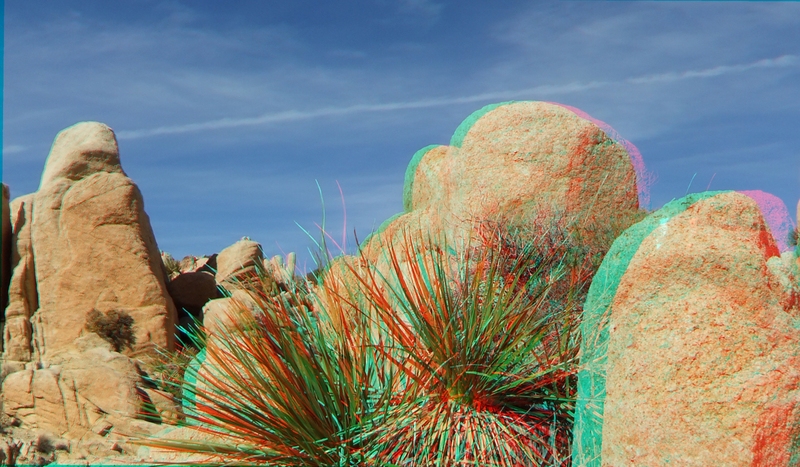 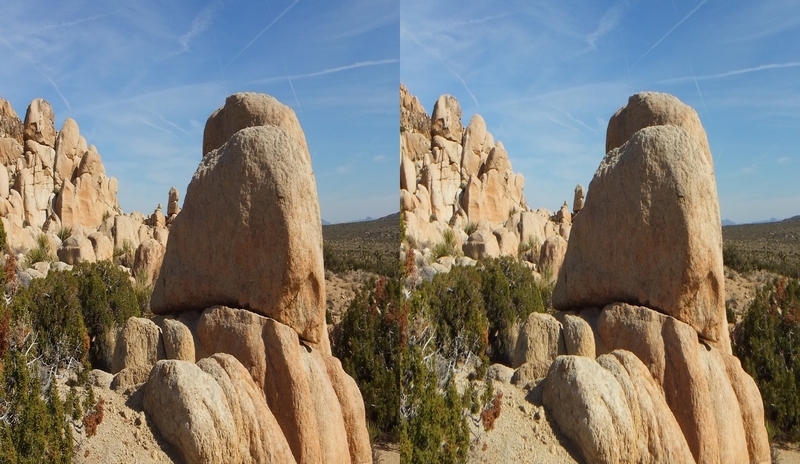 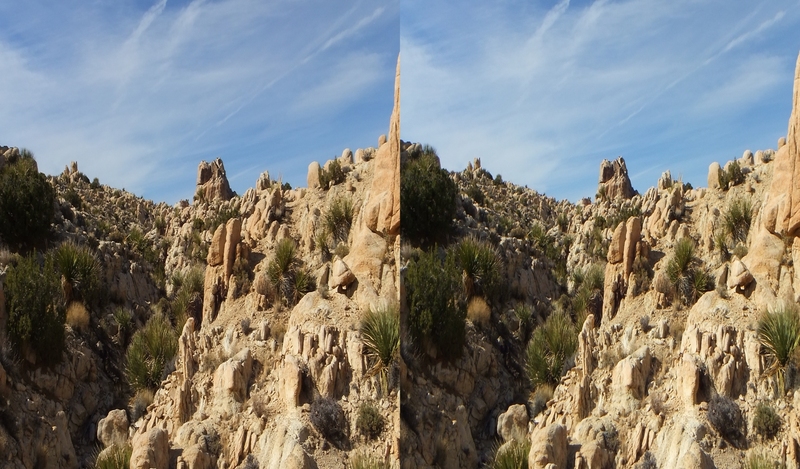 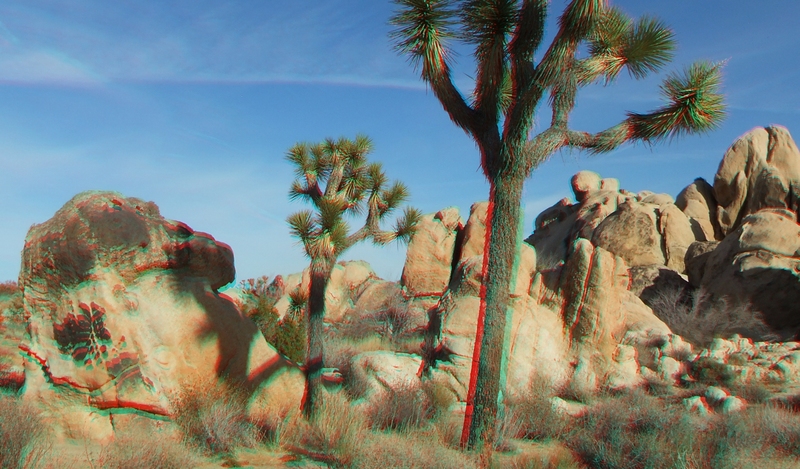 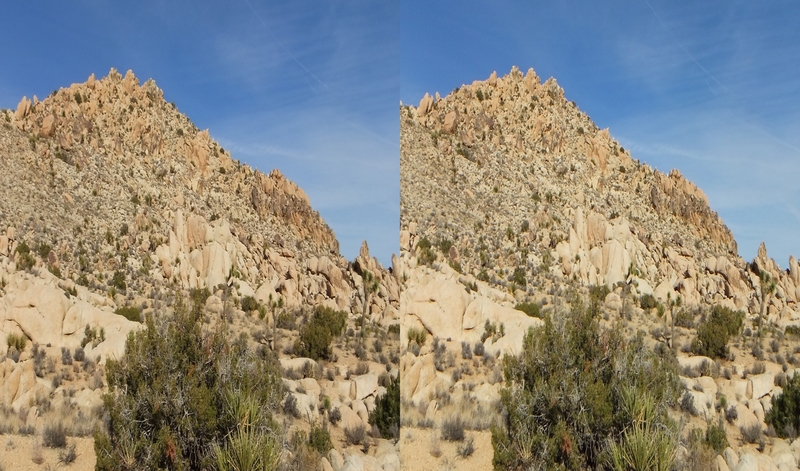 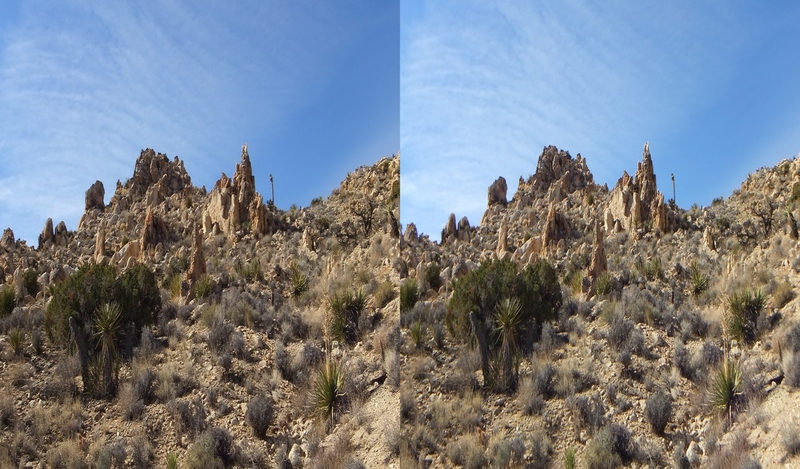 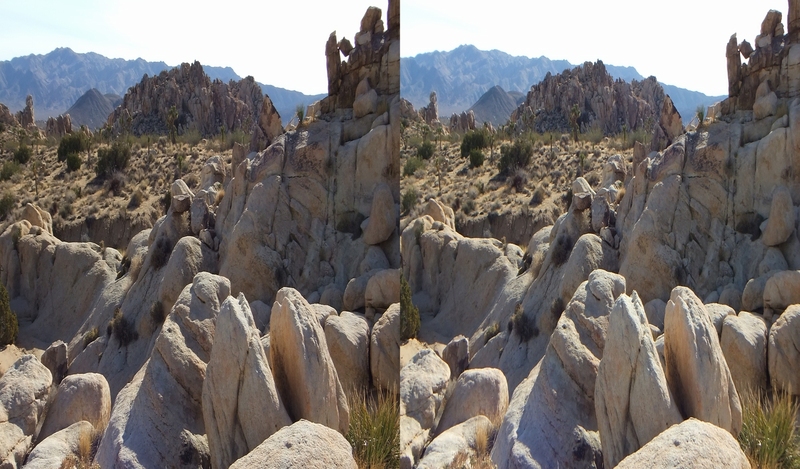 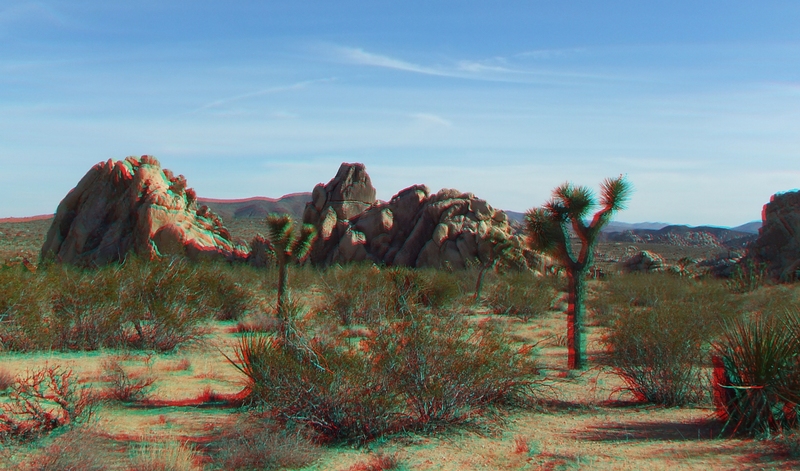 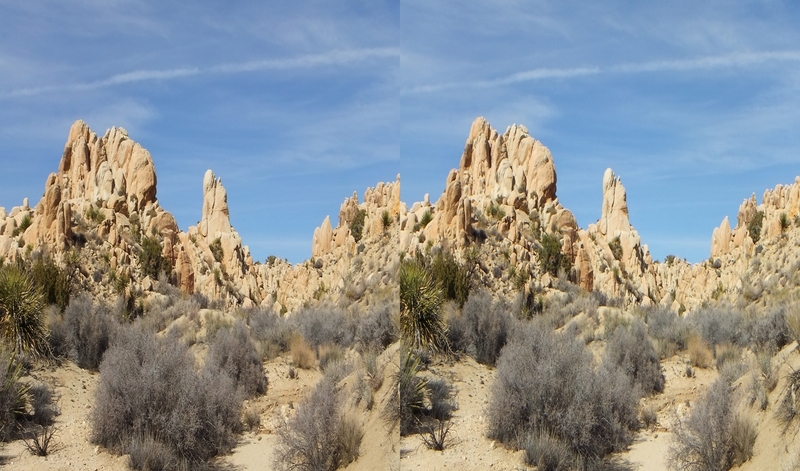 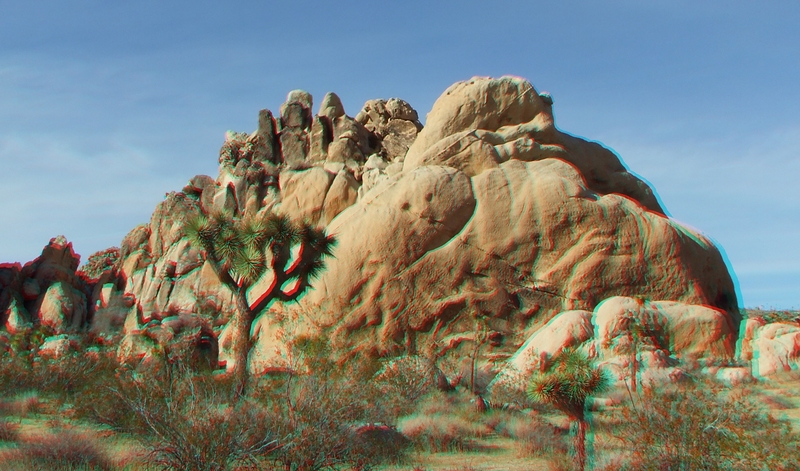 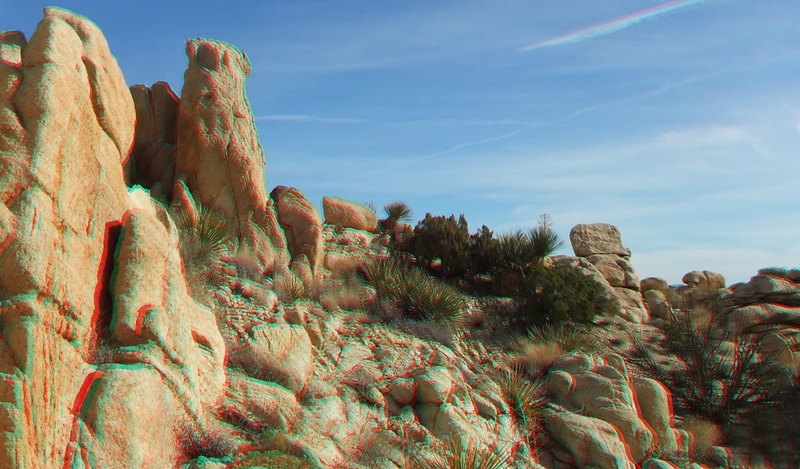 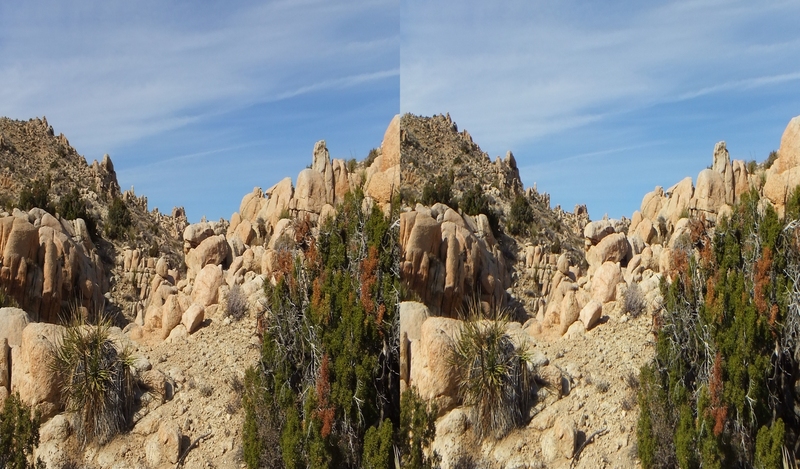 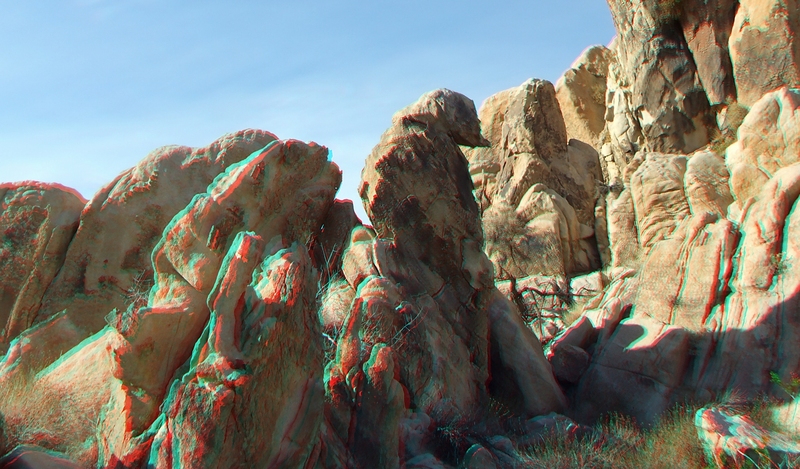 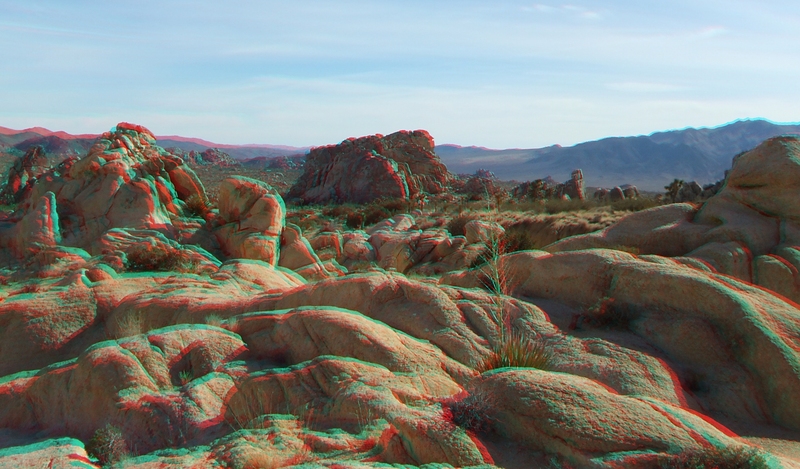 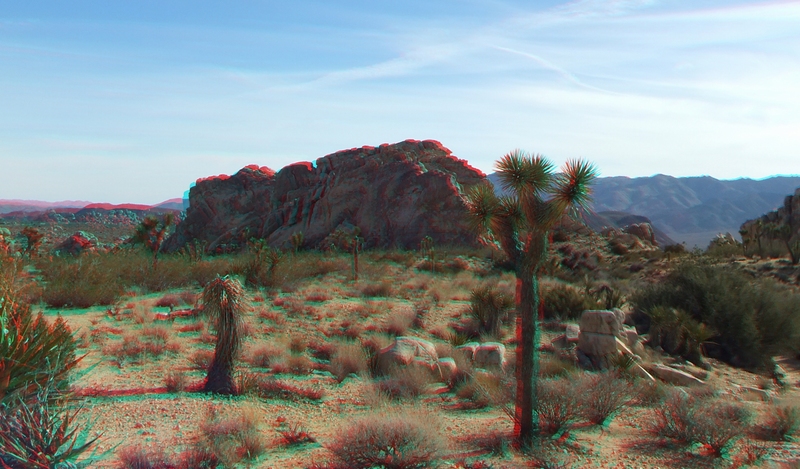 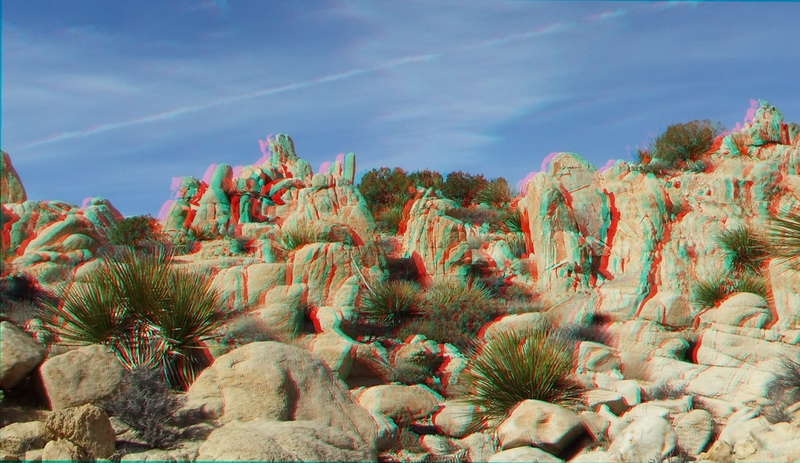 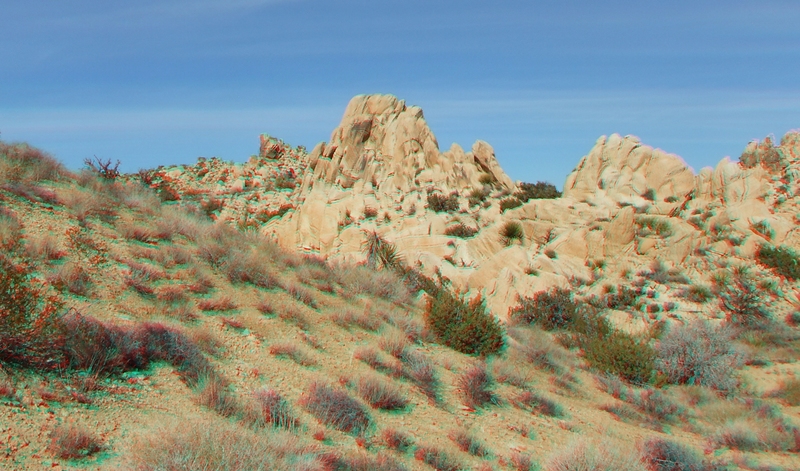 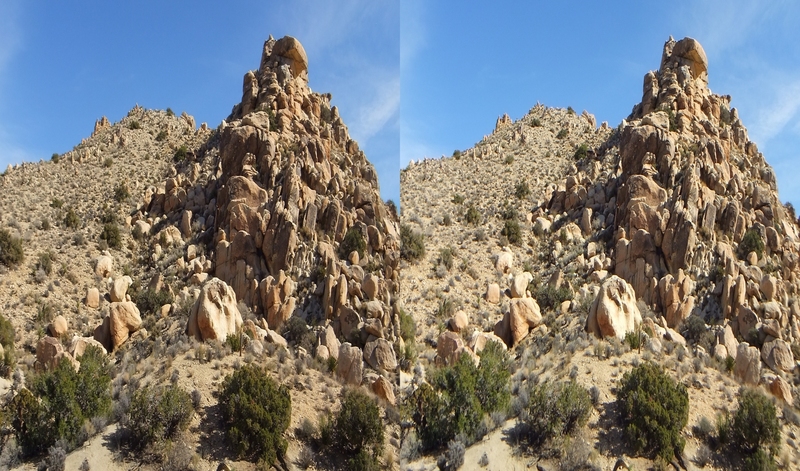 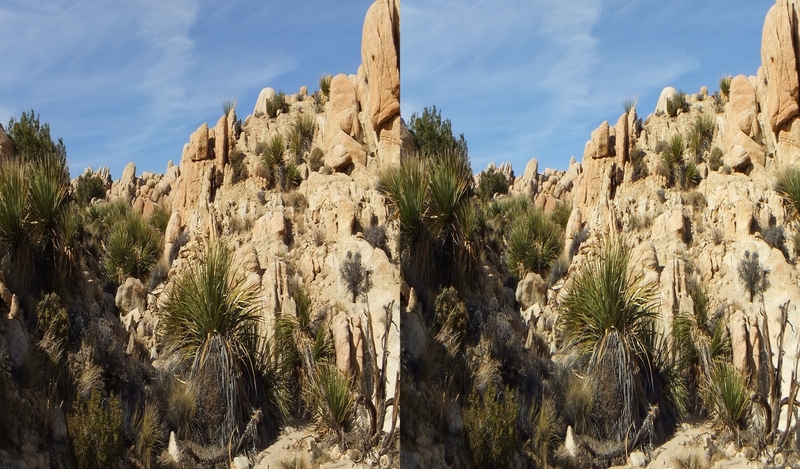 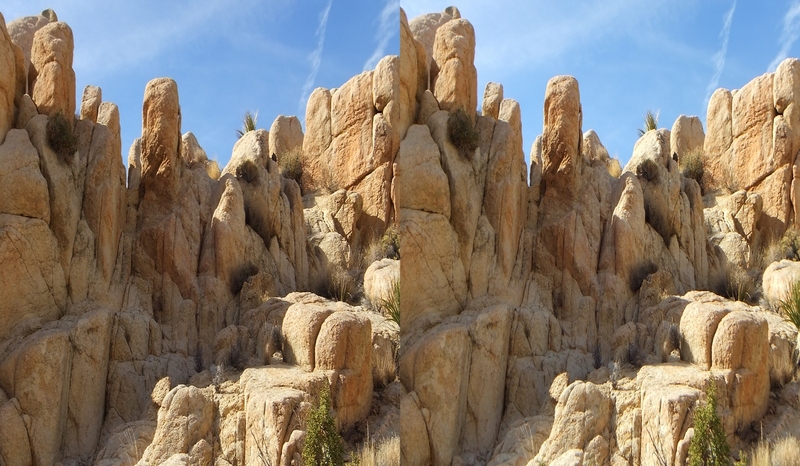 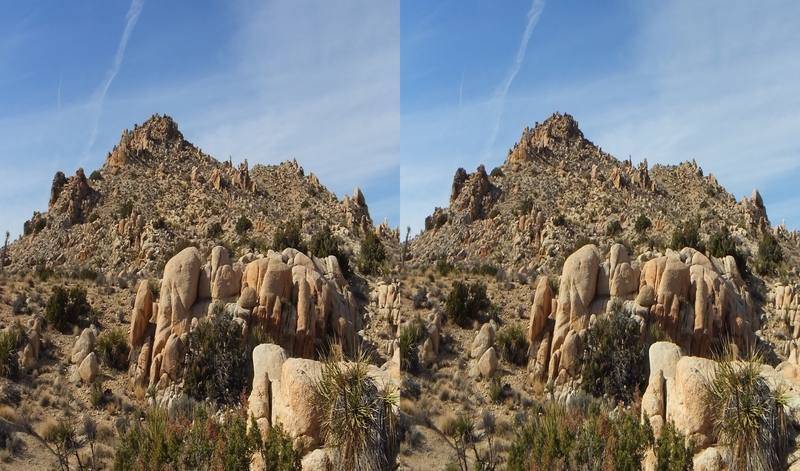 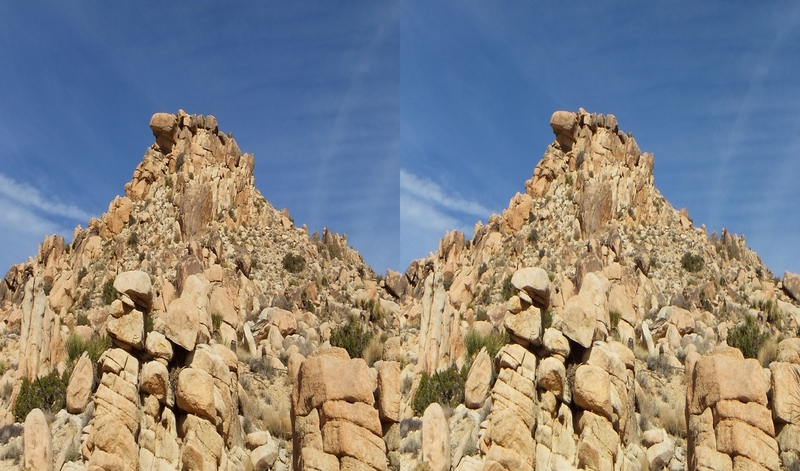 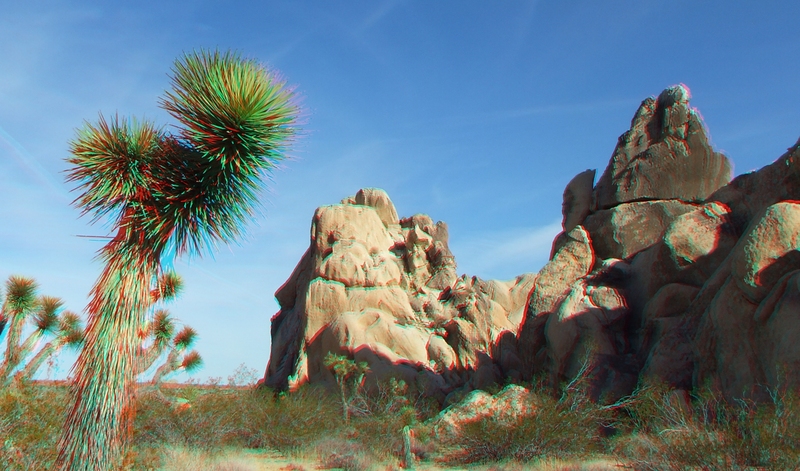 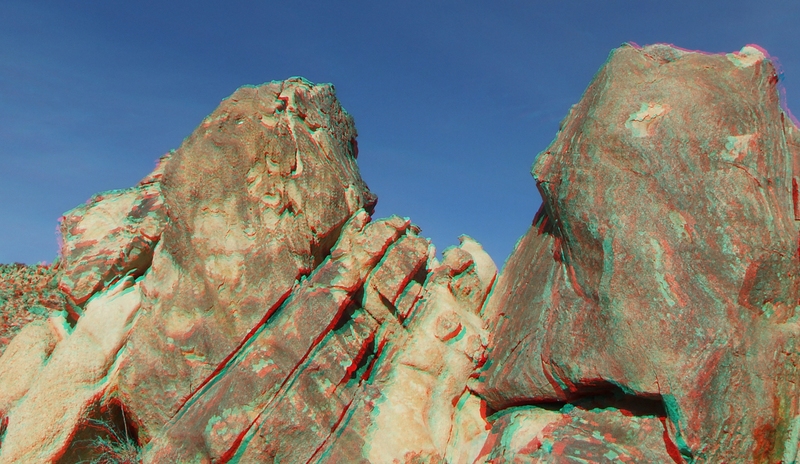 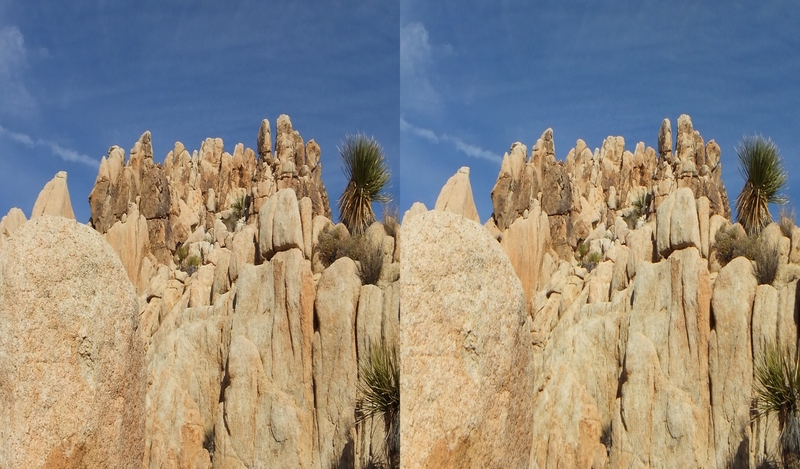 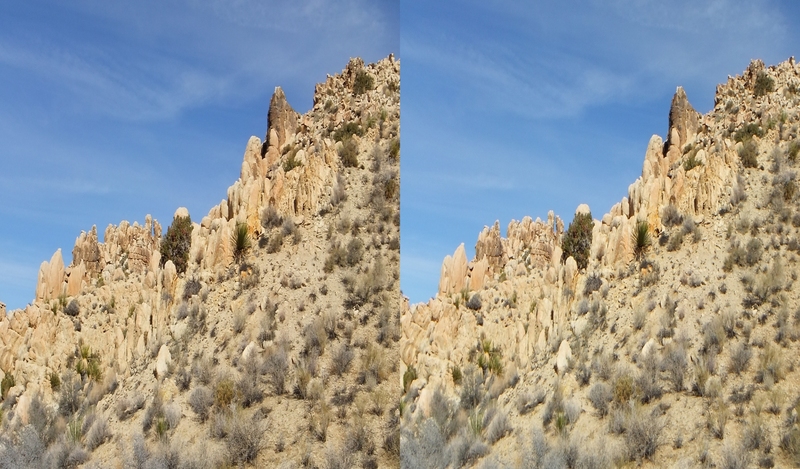 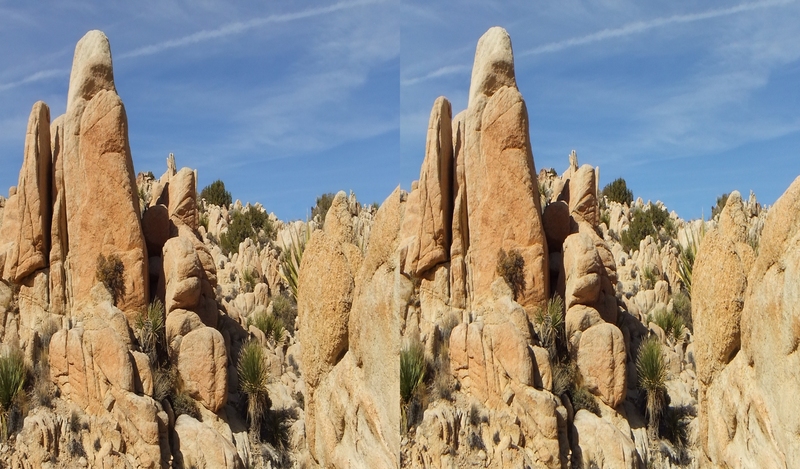 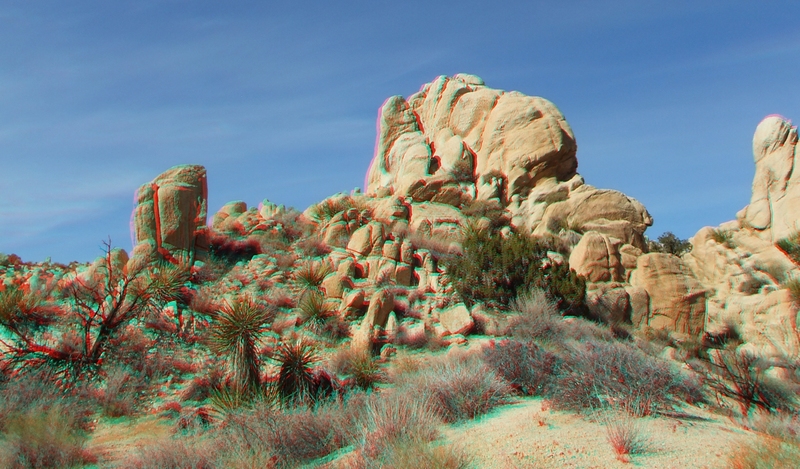 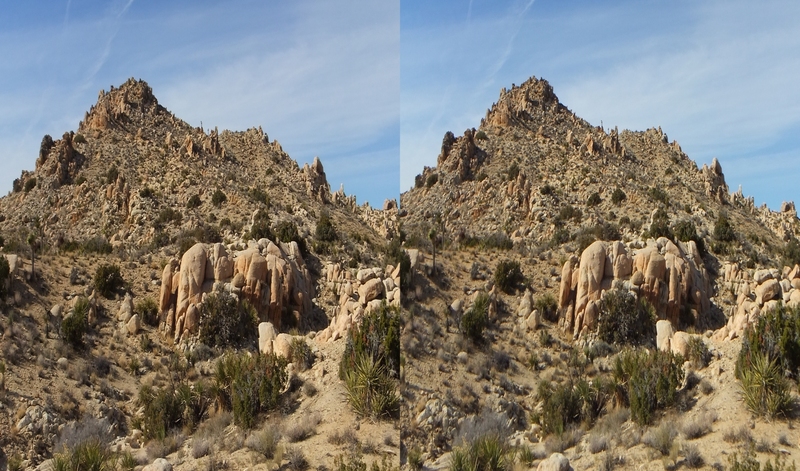 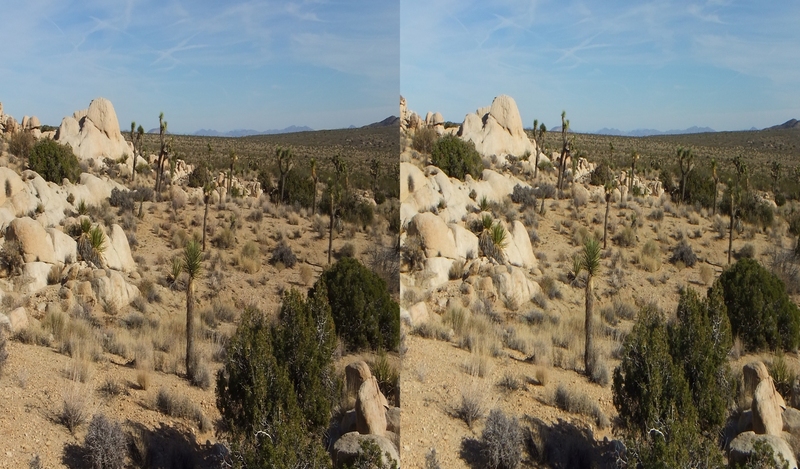 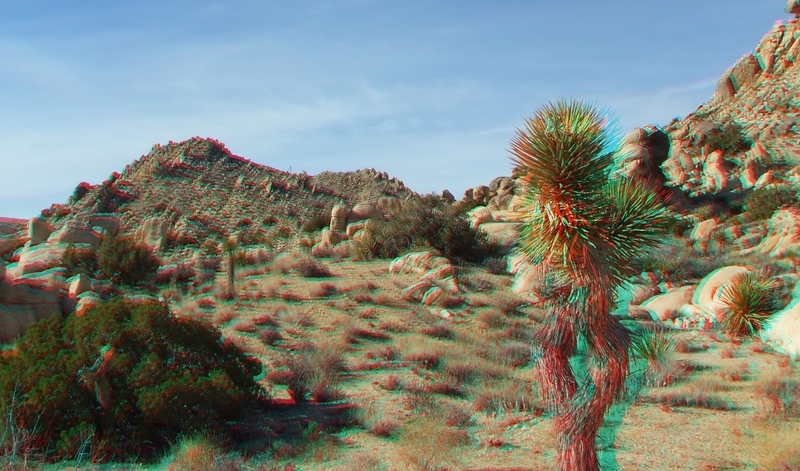 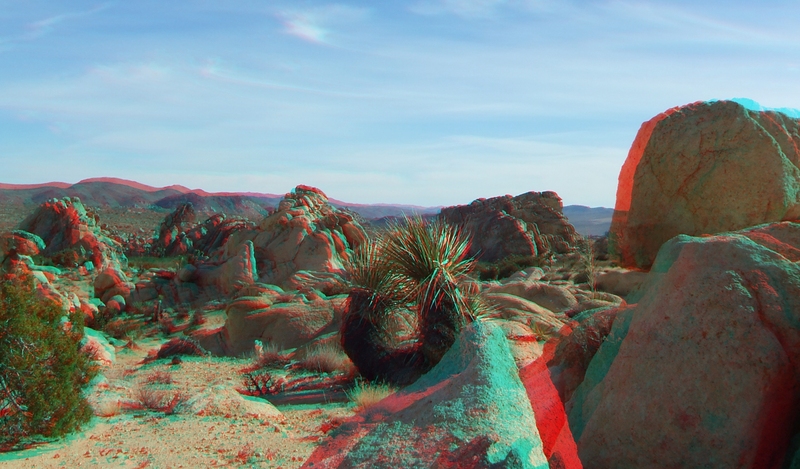 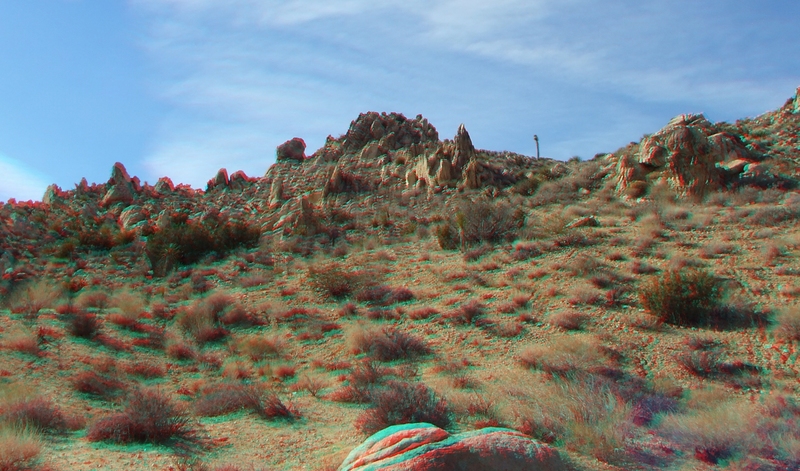 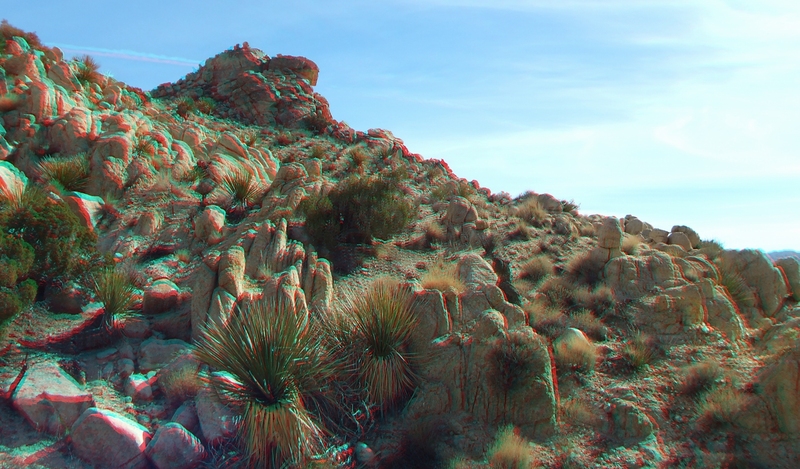 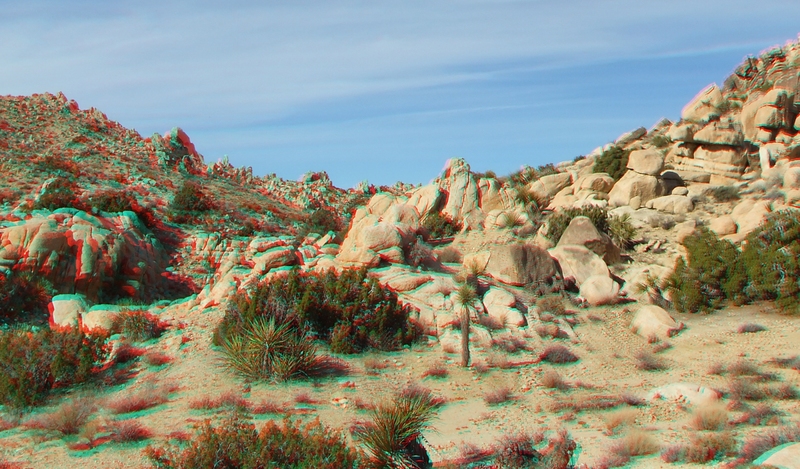 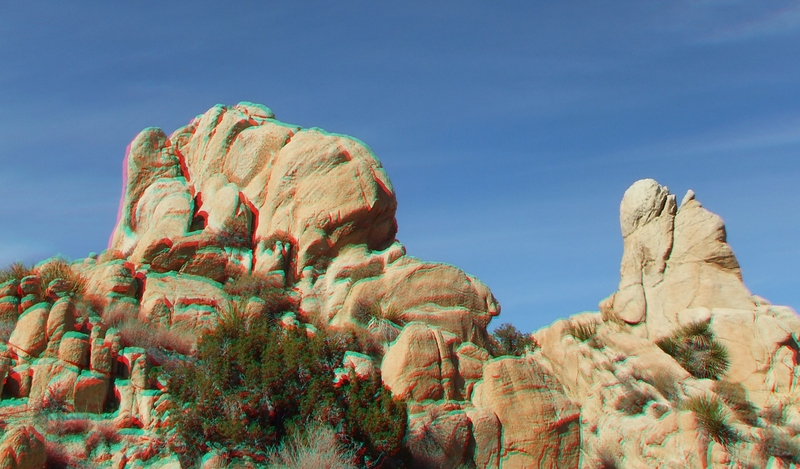 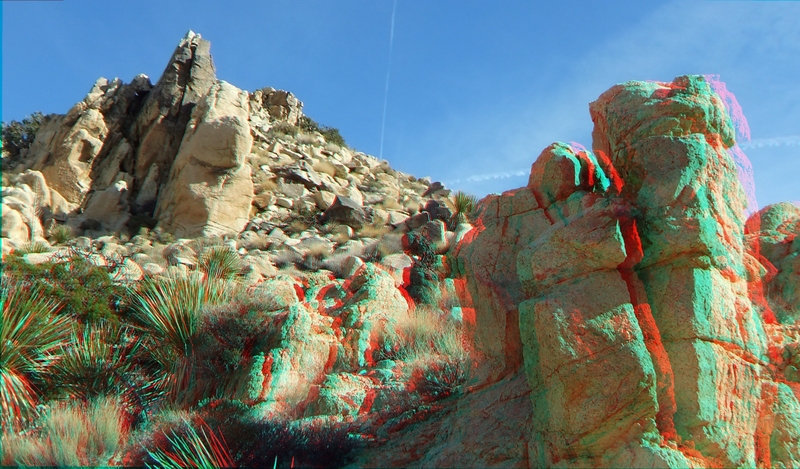 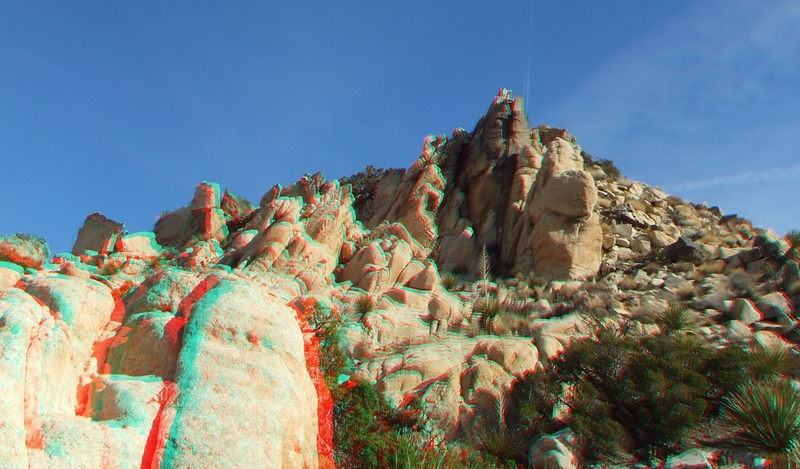 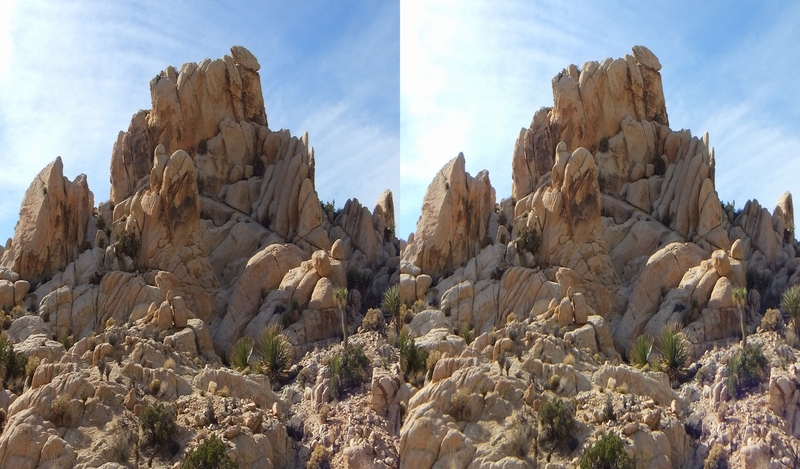 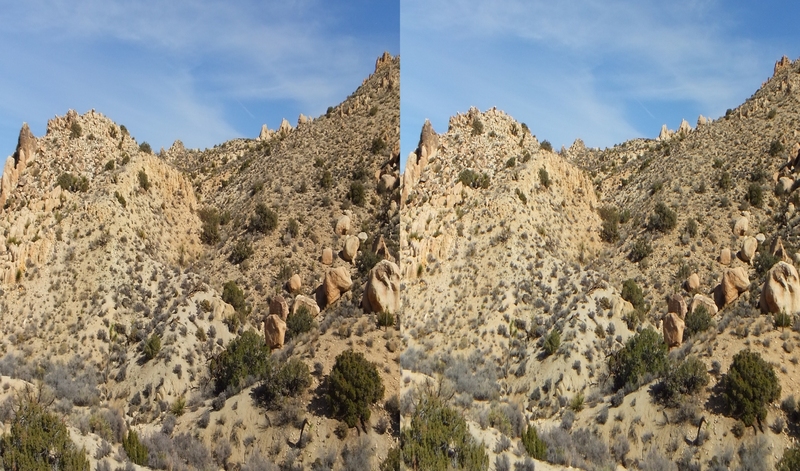 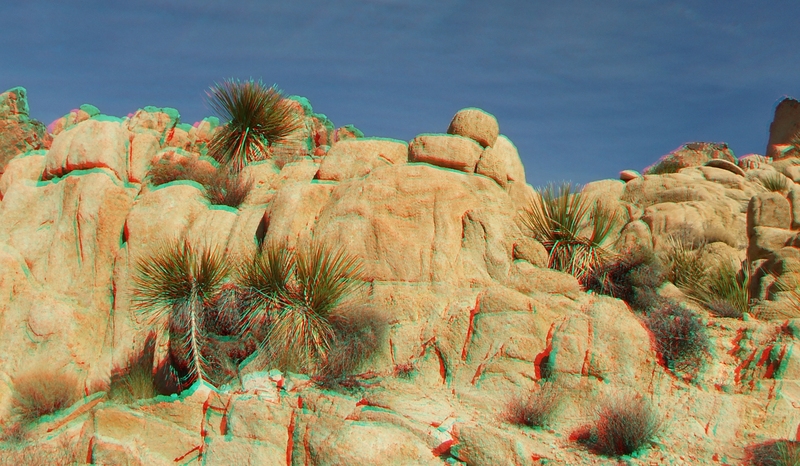 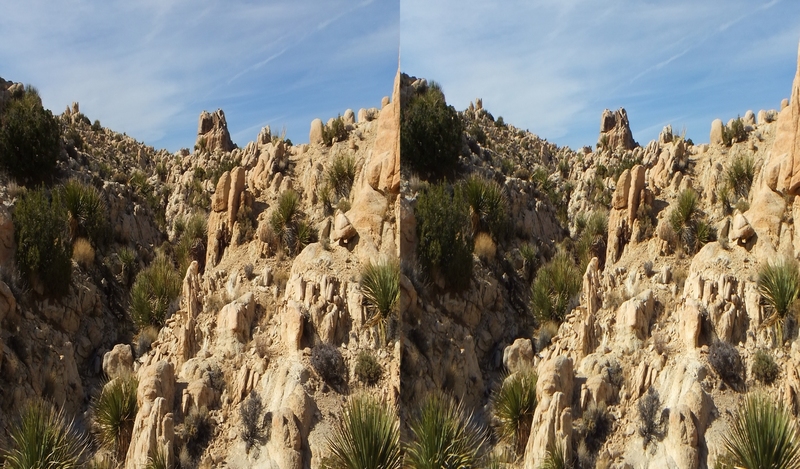 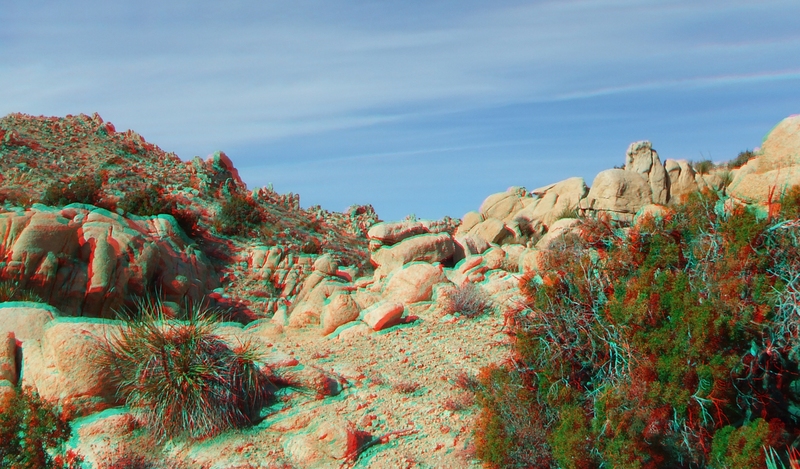 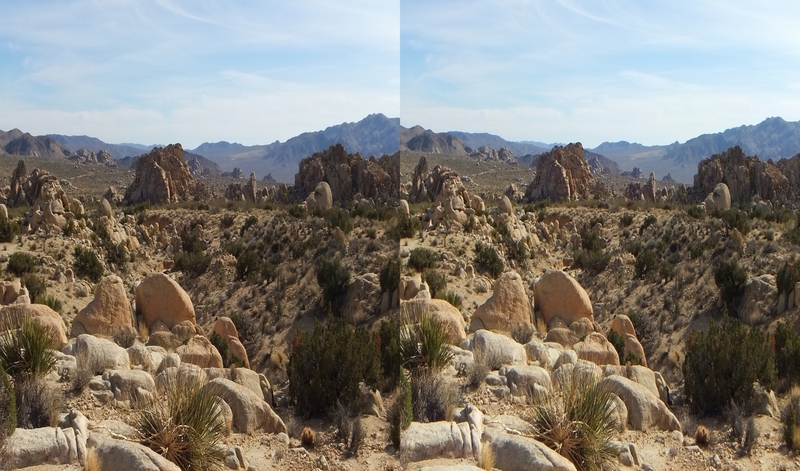 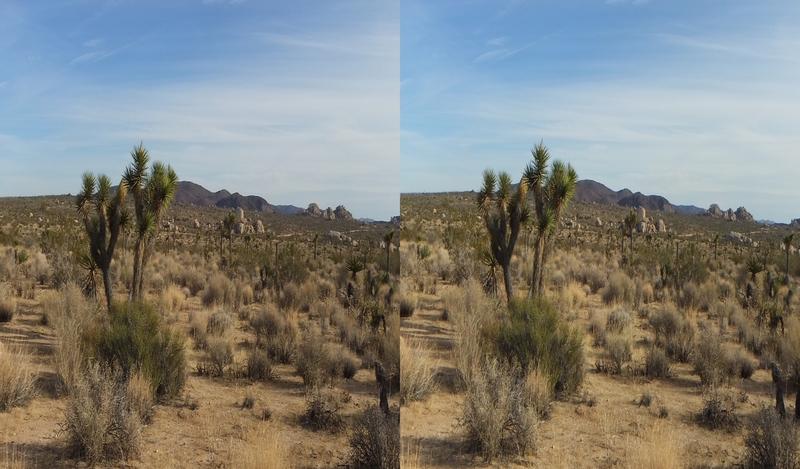 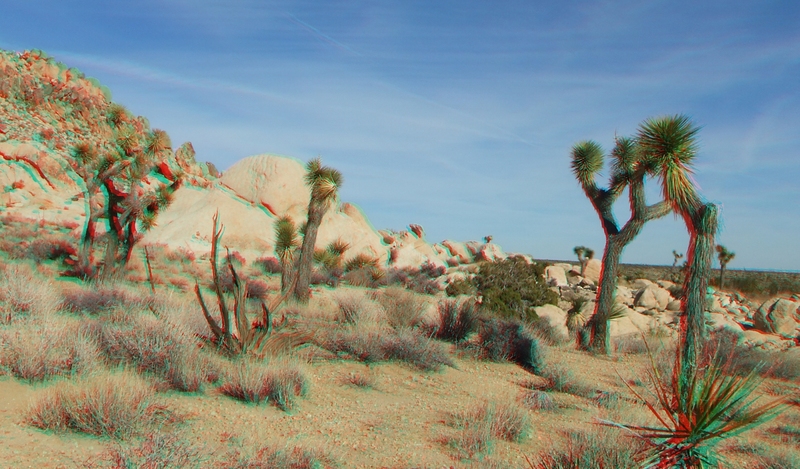 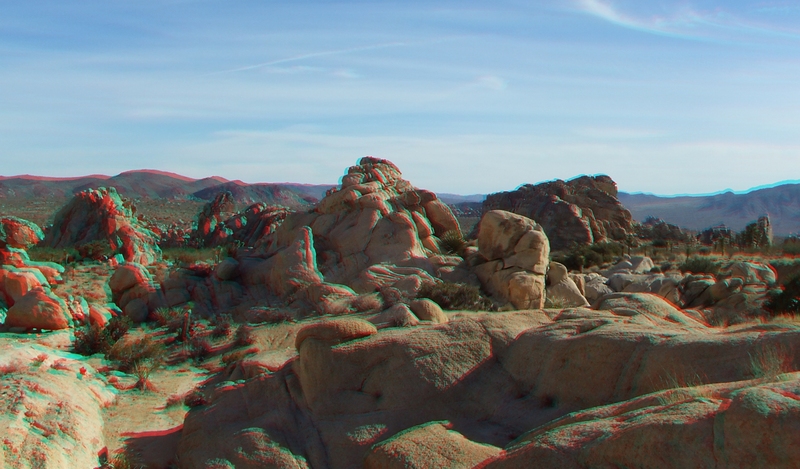 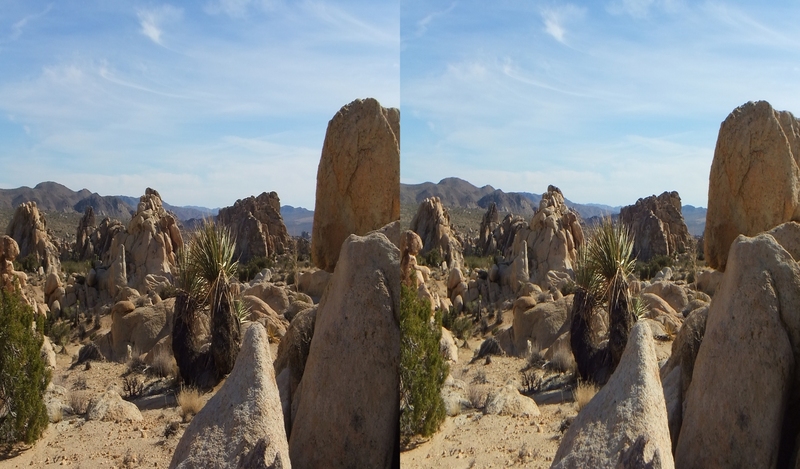 Until then, the same rule applies: use the red/cyan glasses to view the following 3D Anaglyphs. 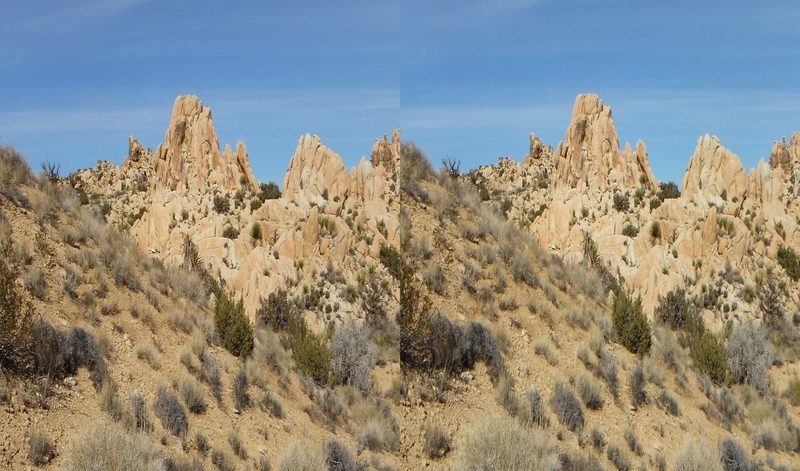 (Click image to Enlarge. 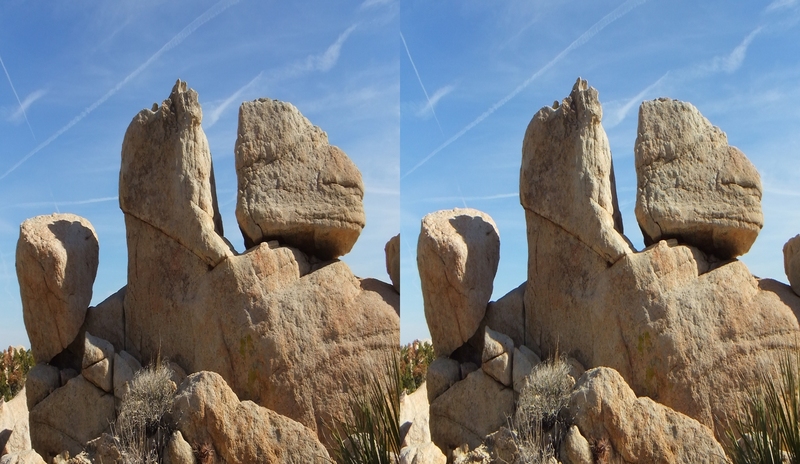 Or Right-click thumbnail and choose SAVE LINK AS to Save. 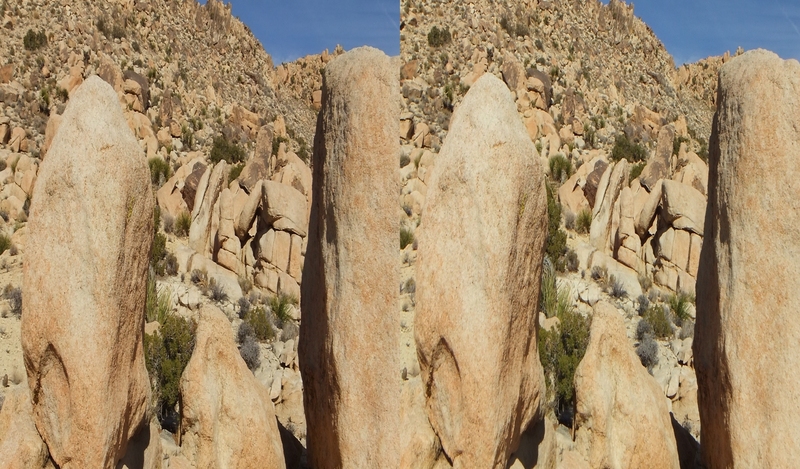 1080p. 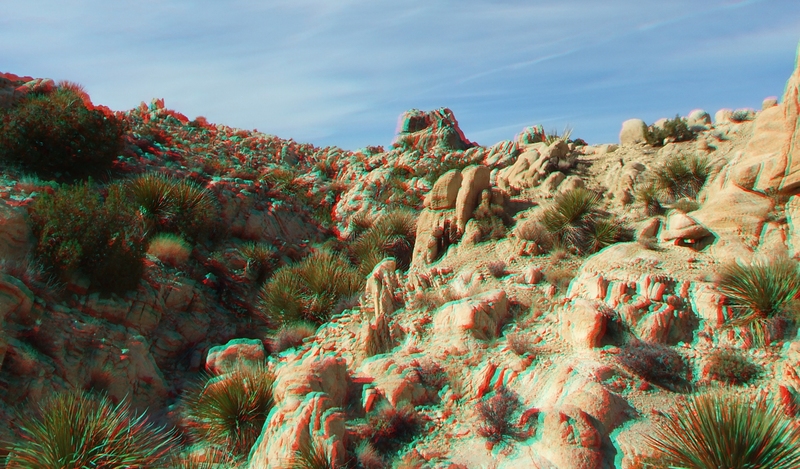 3D H-SBS. 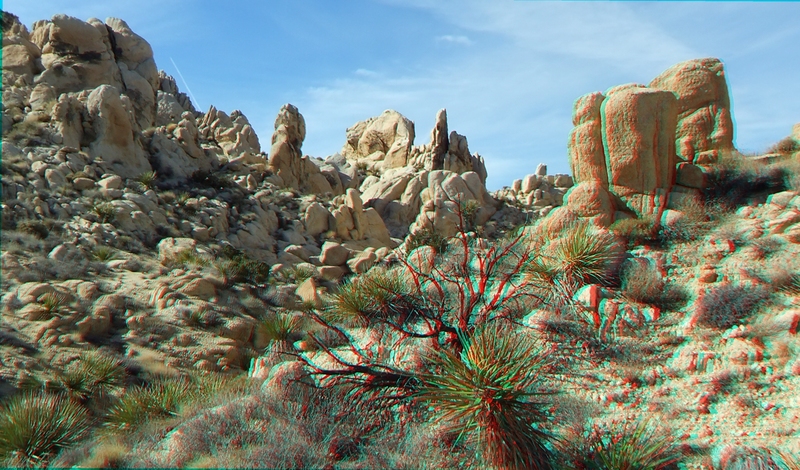 For 3D TV viewing). 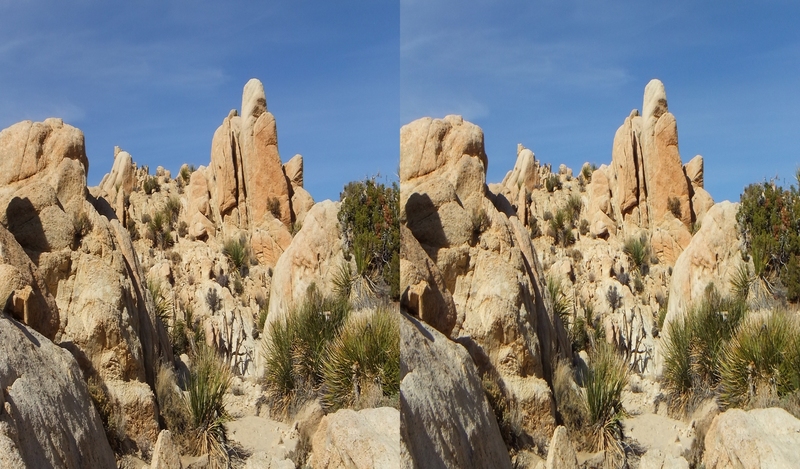 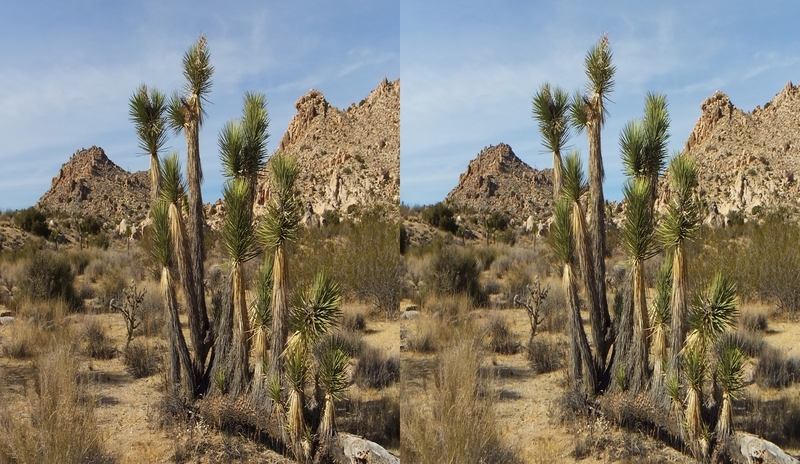 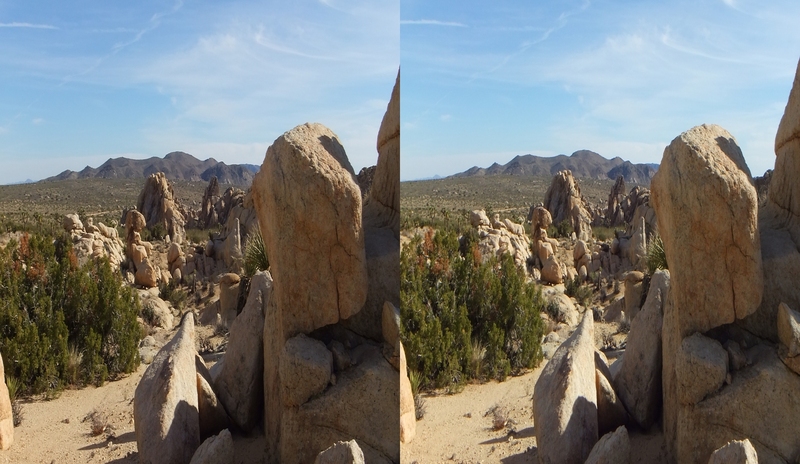 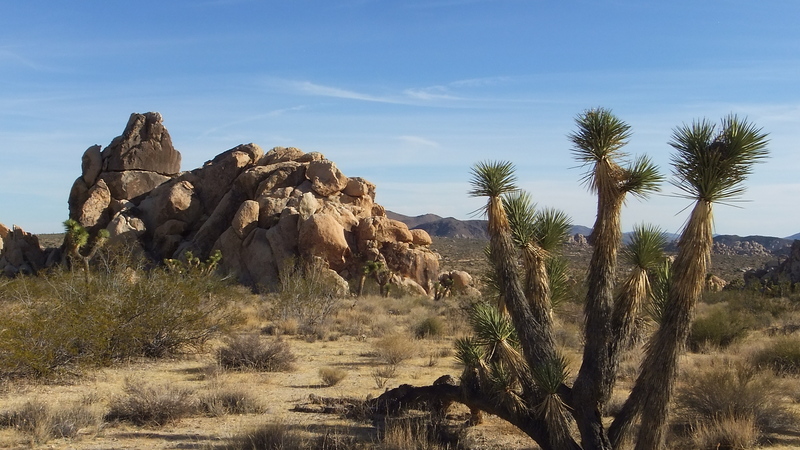 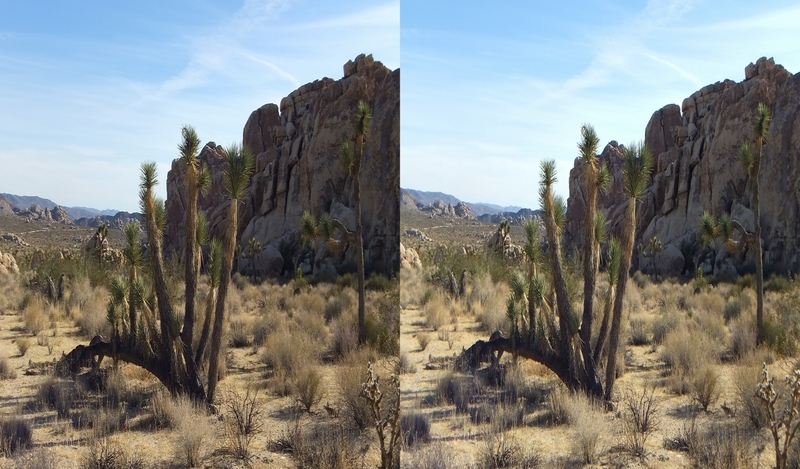 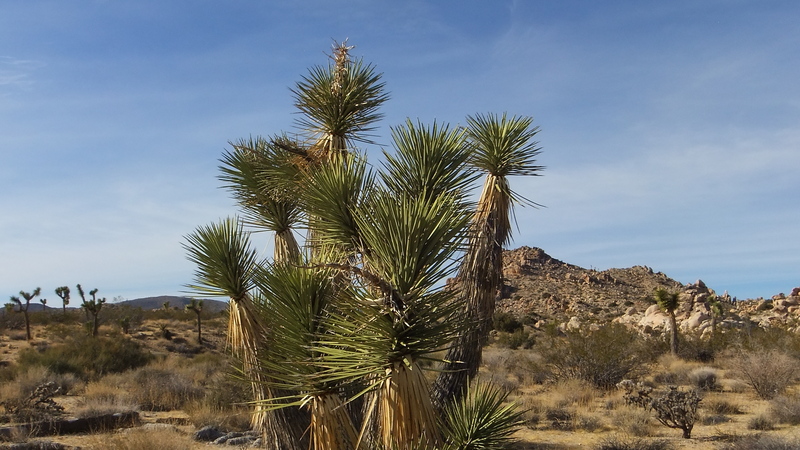 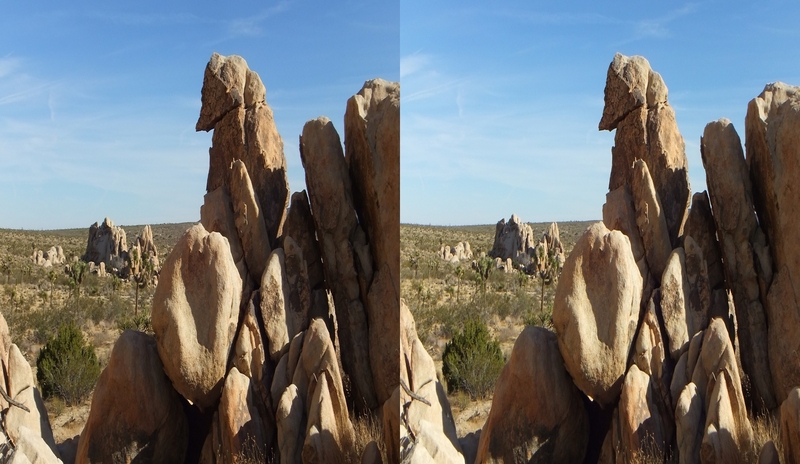 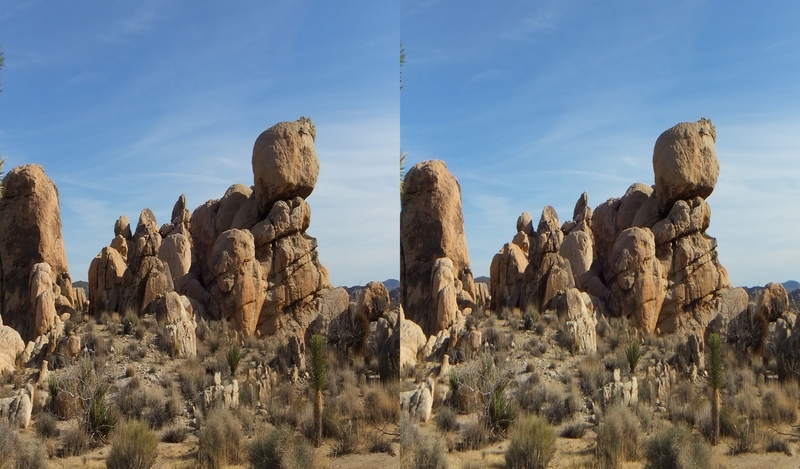 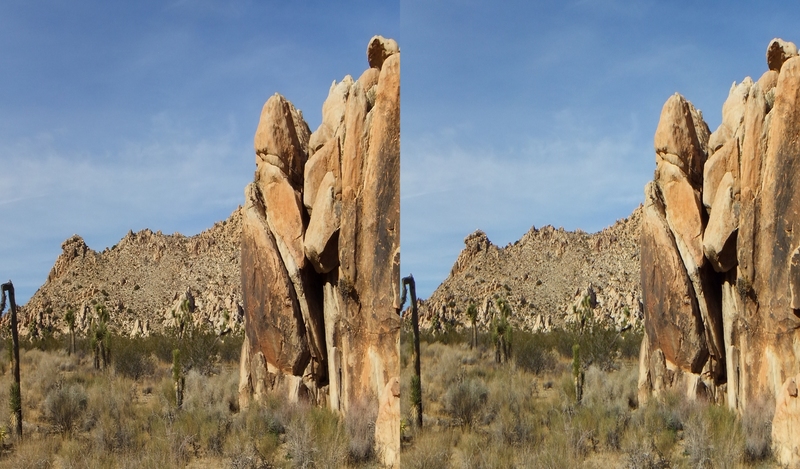 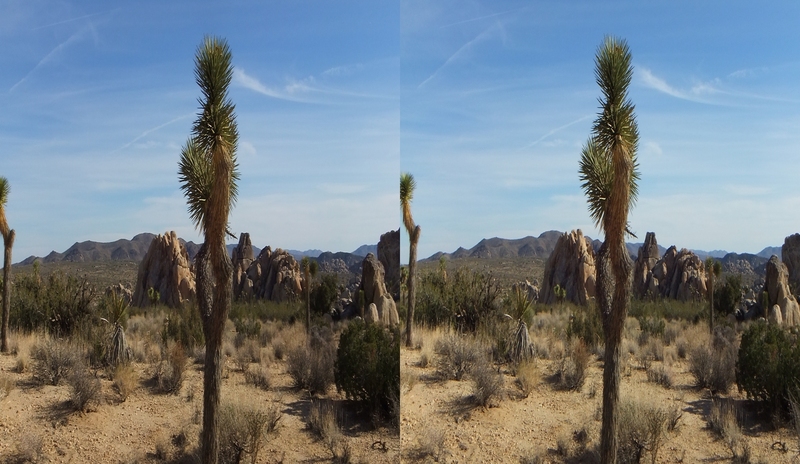 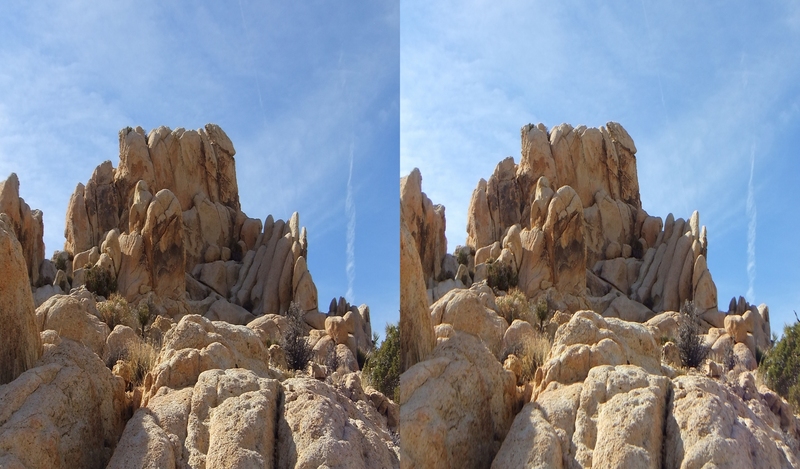 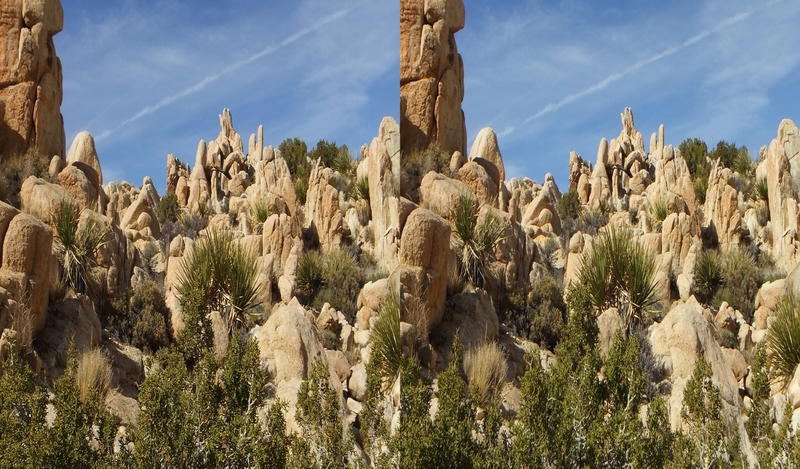 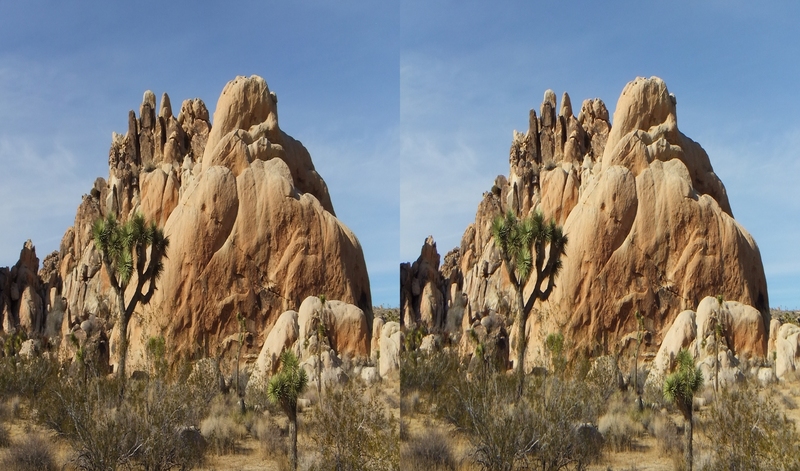 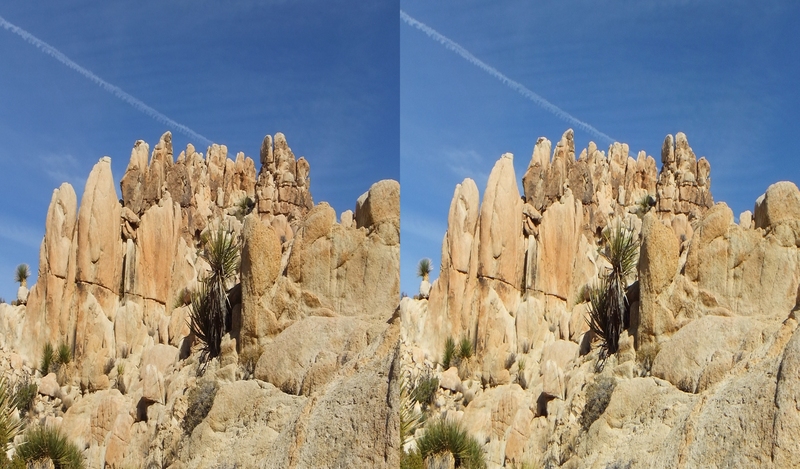 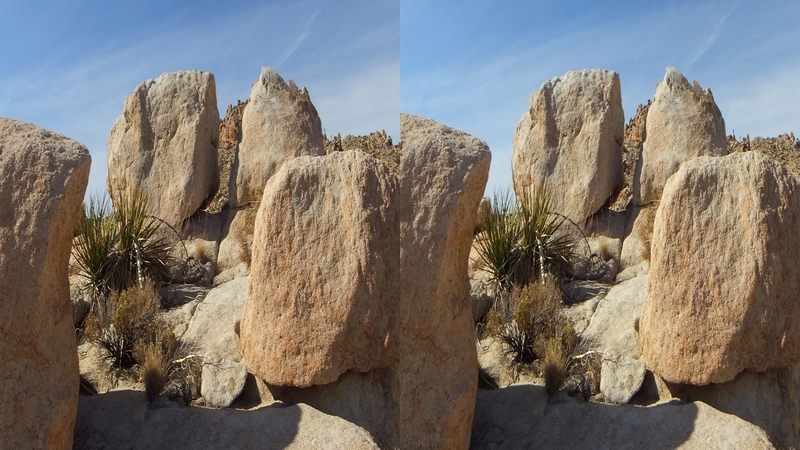 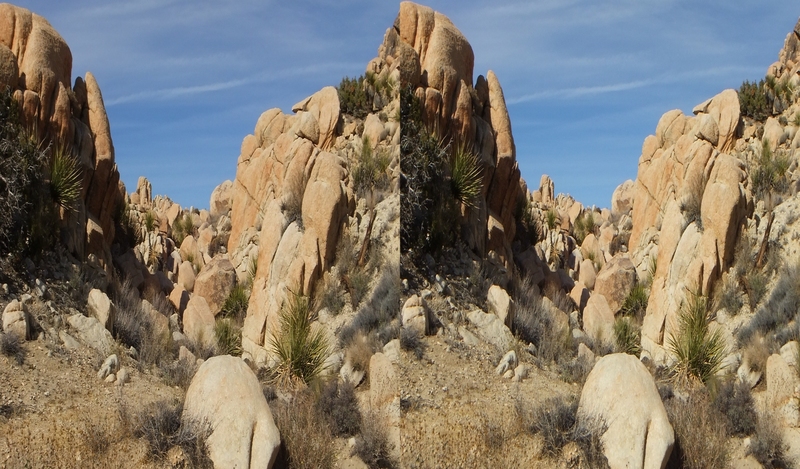 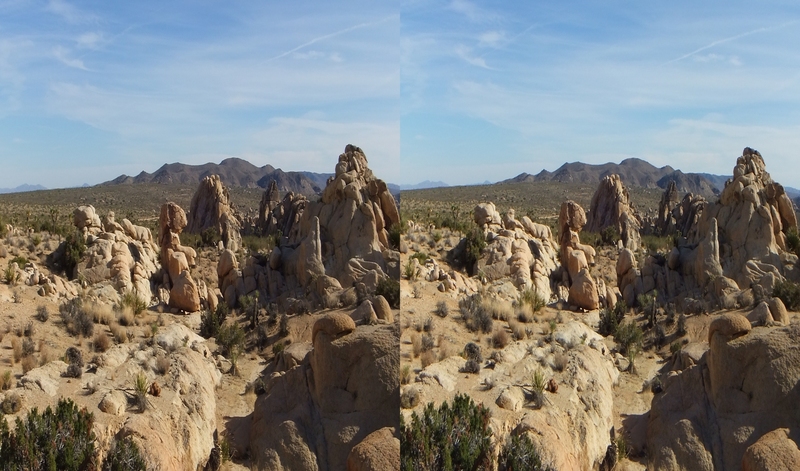 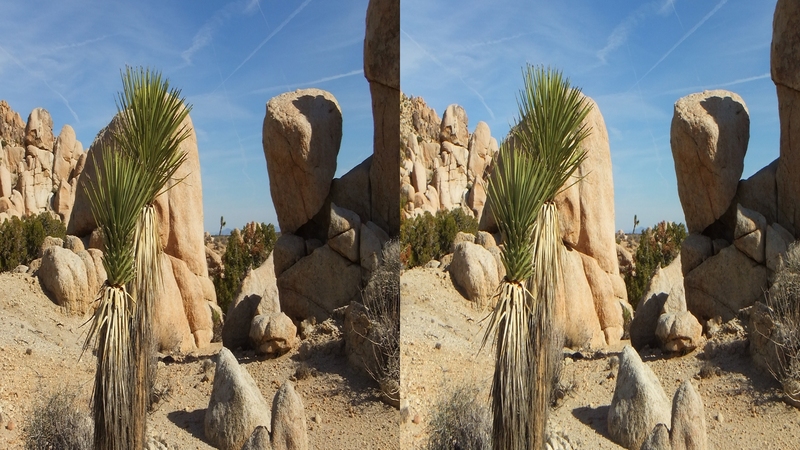 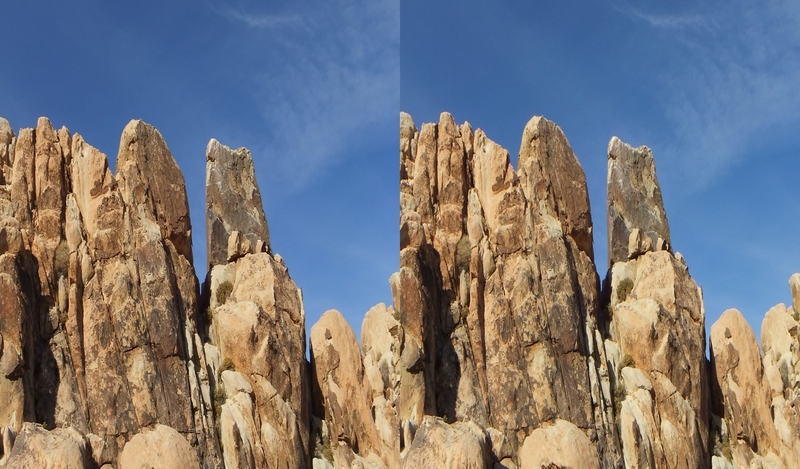 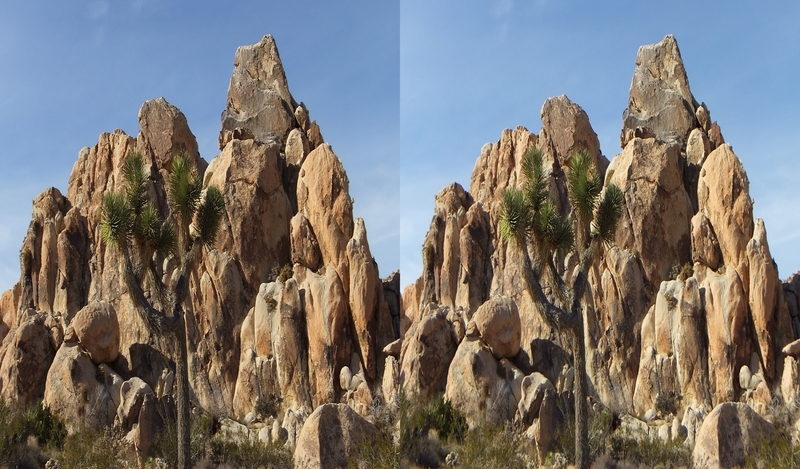 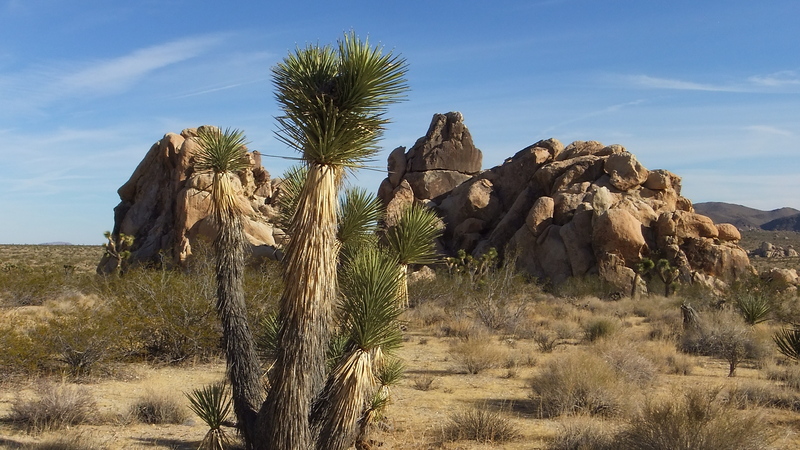 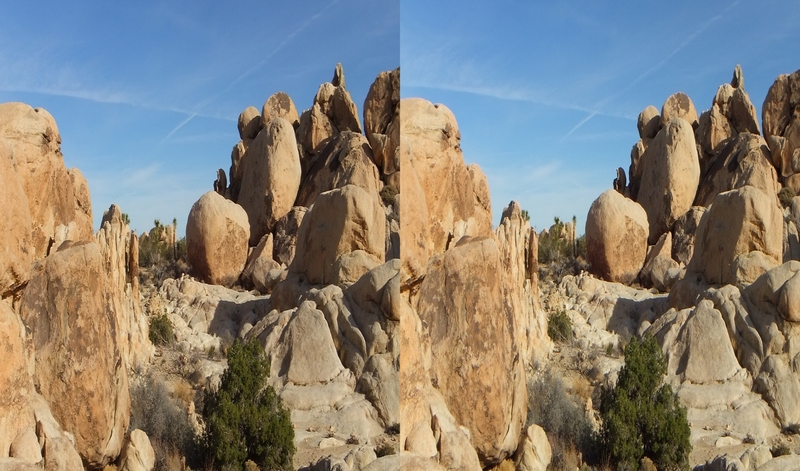 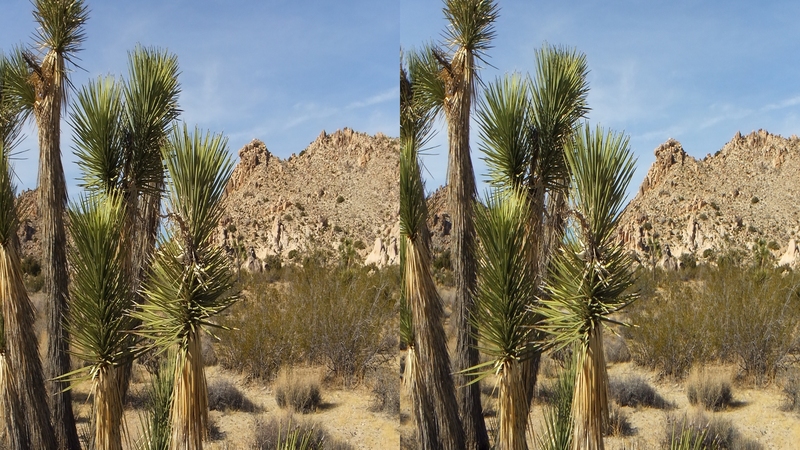 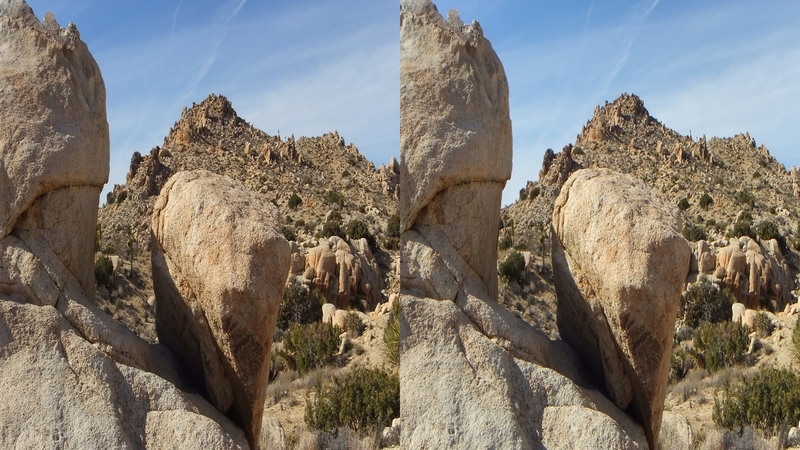 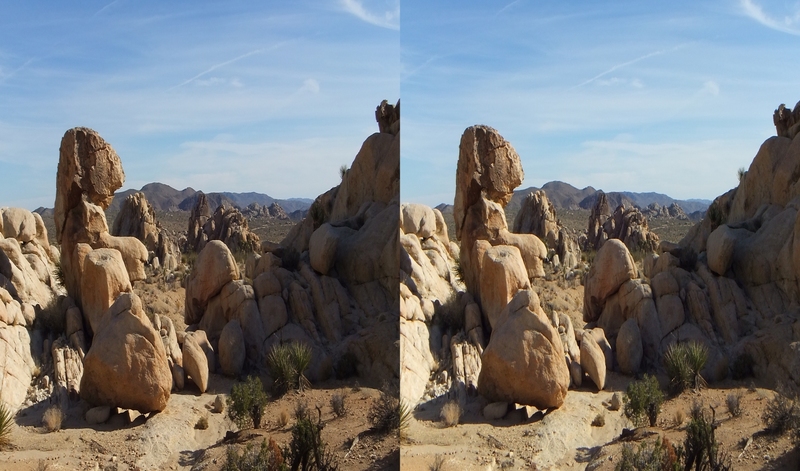 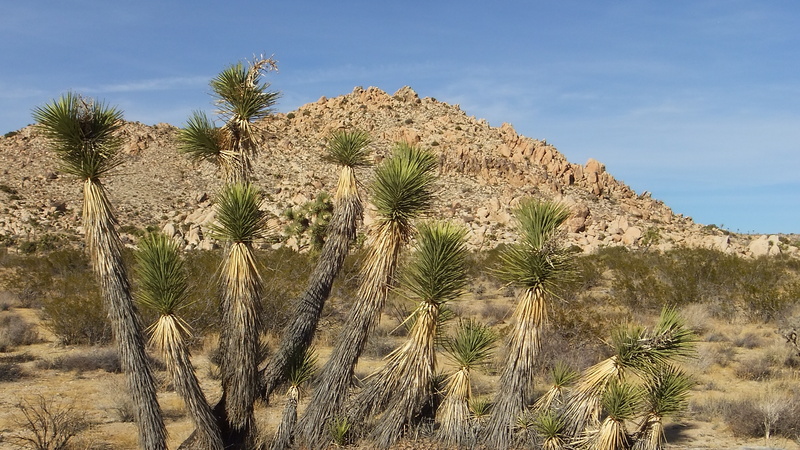 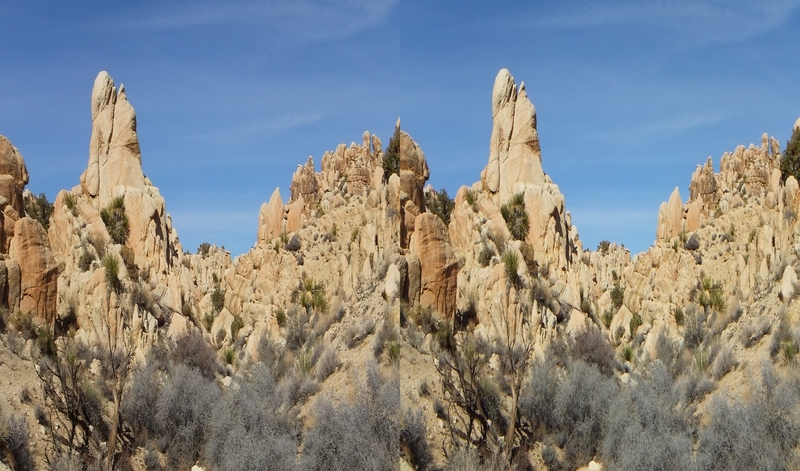 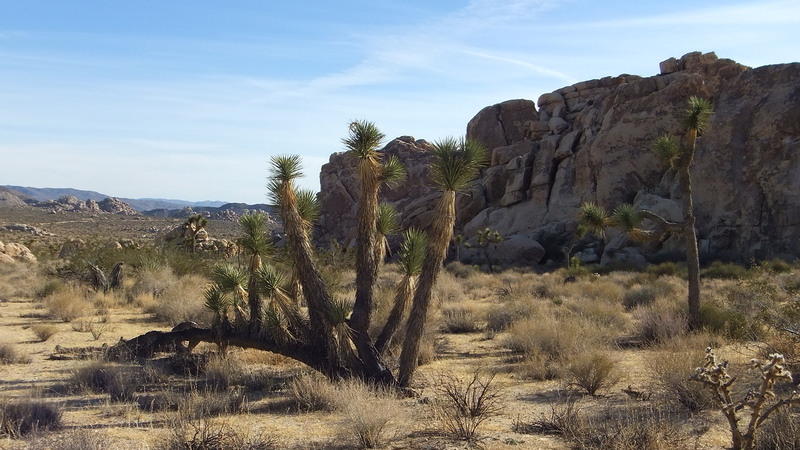 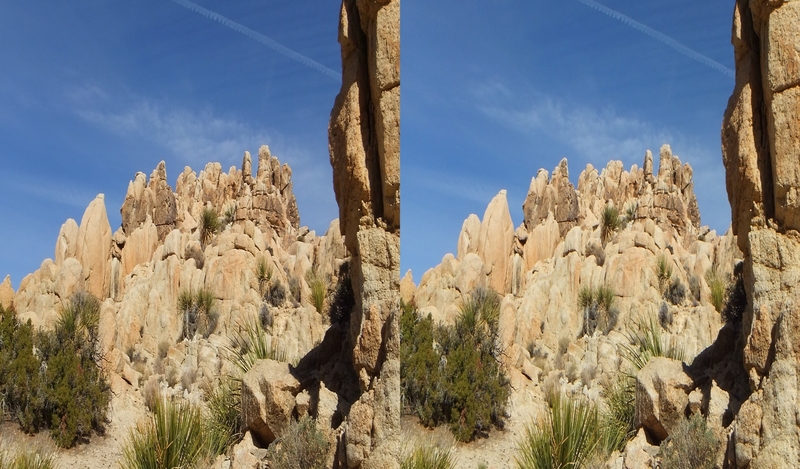 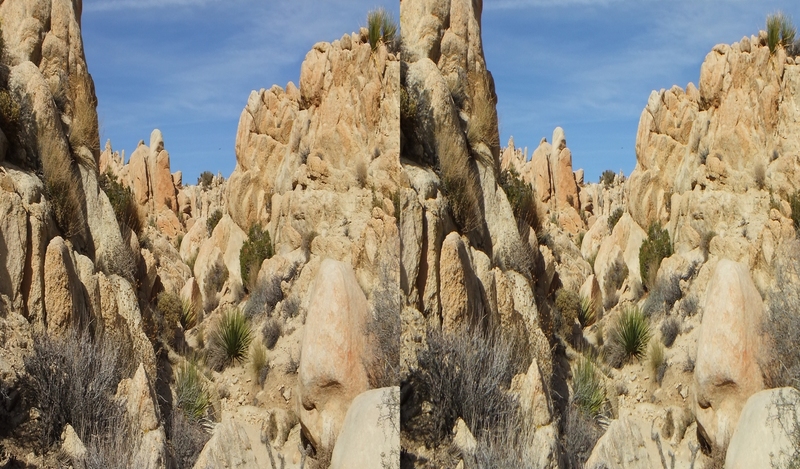 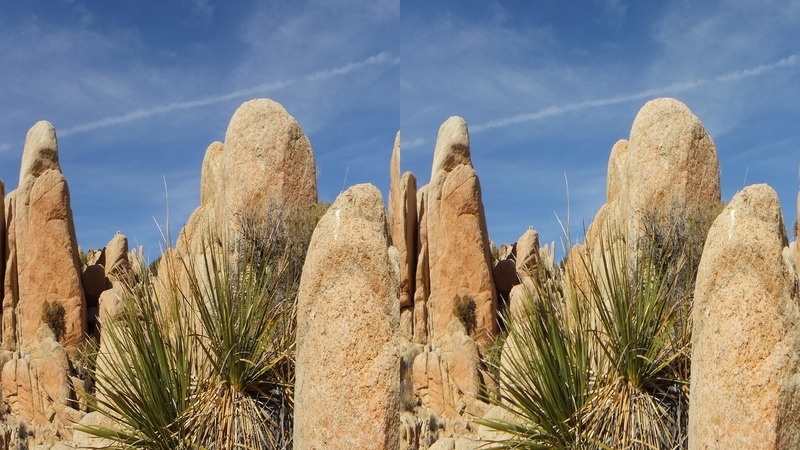 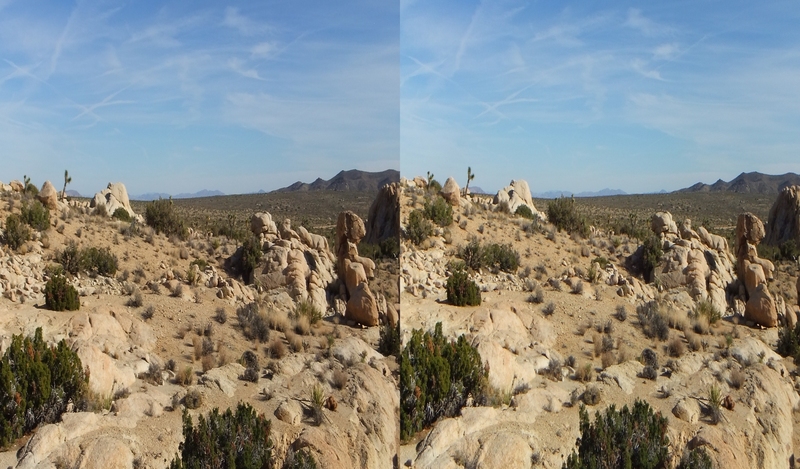 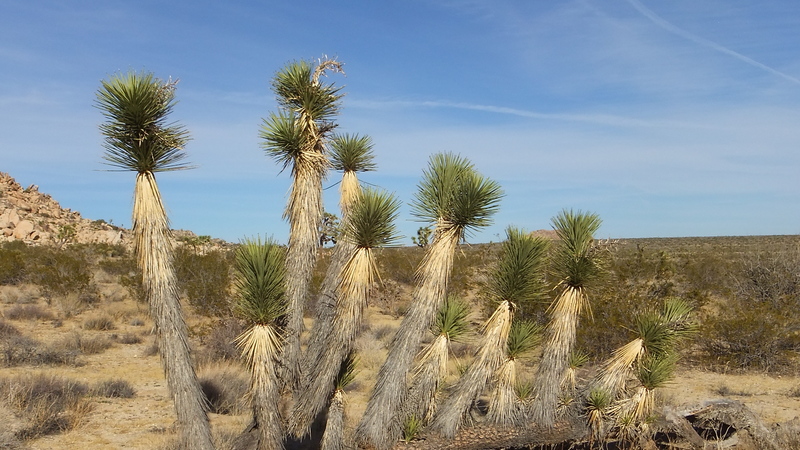 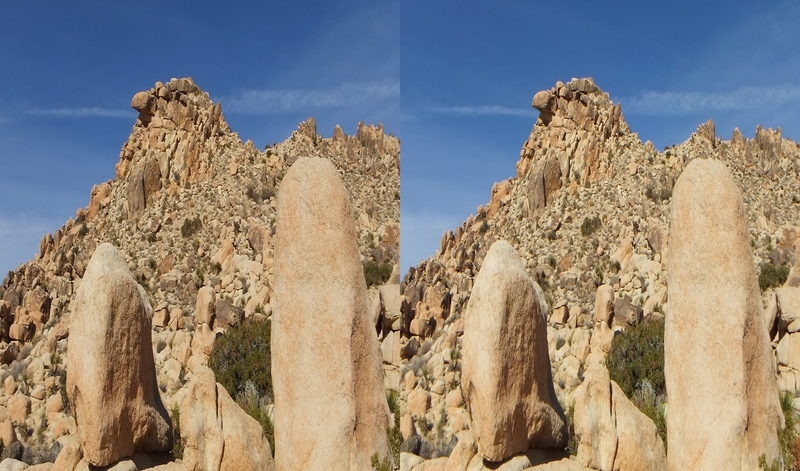 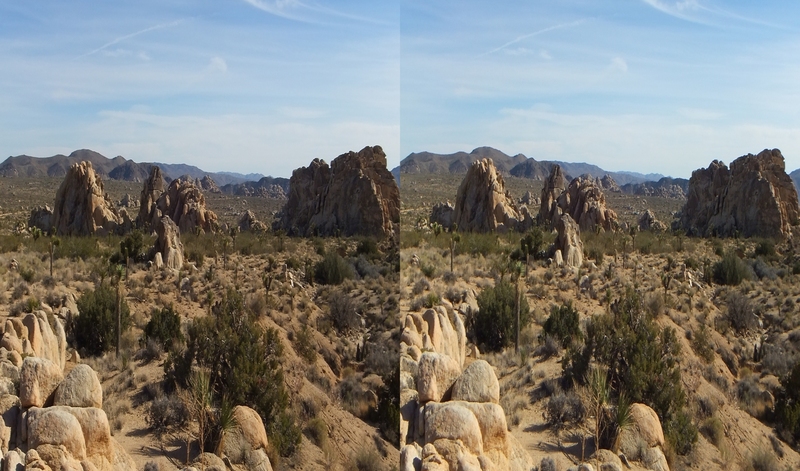 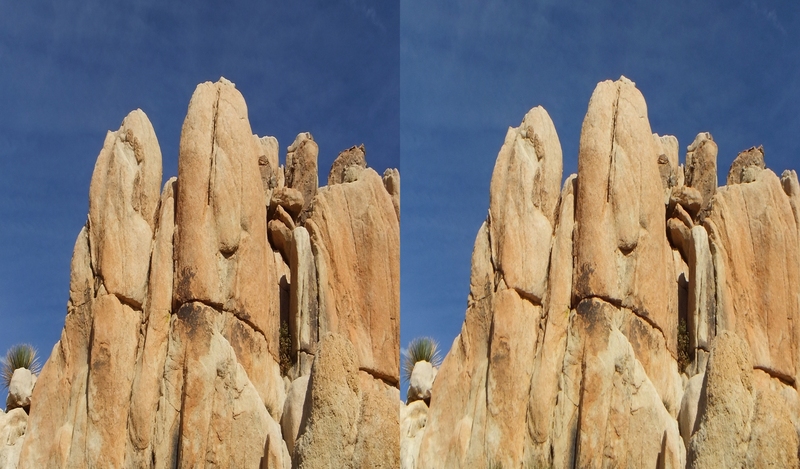 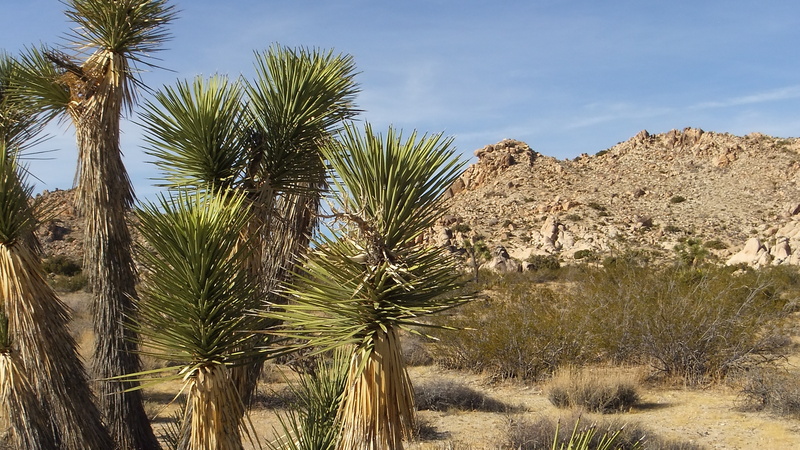 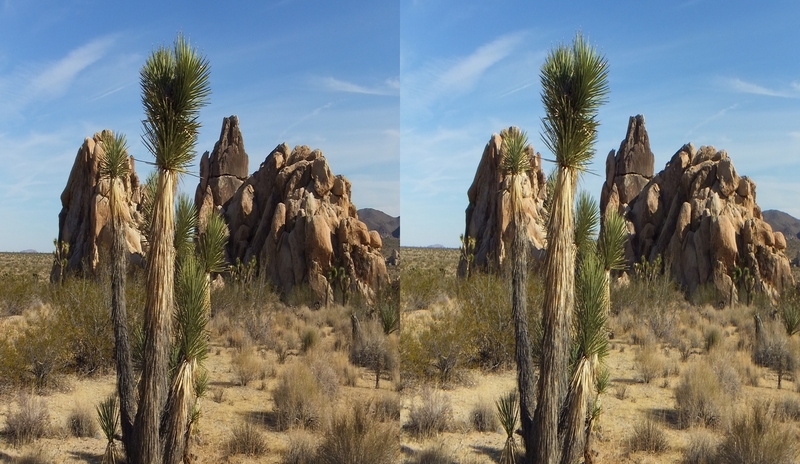 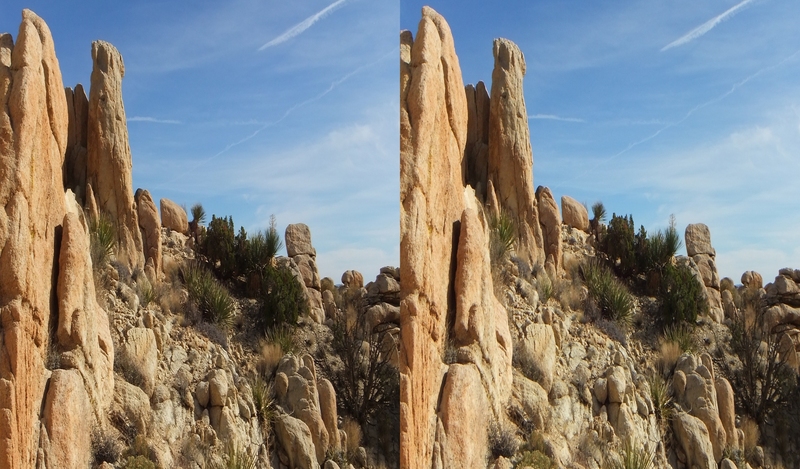 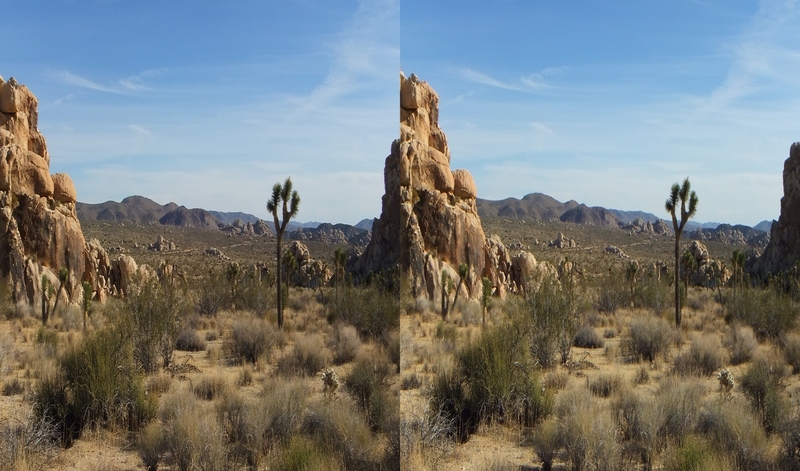 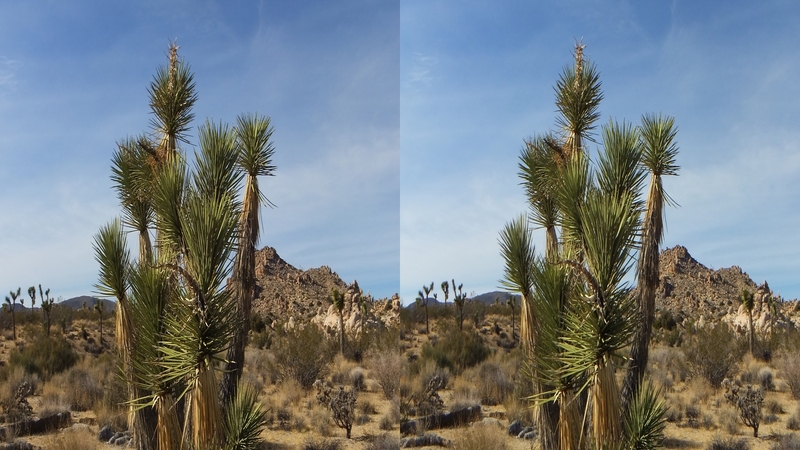 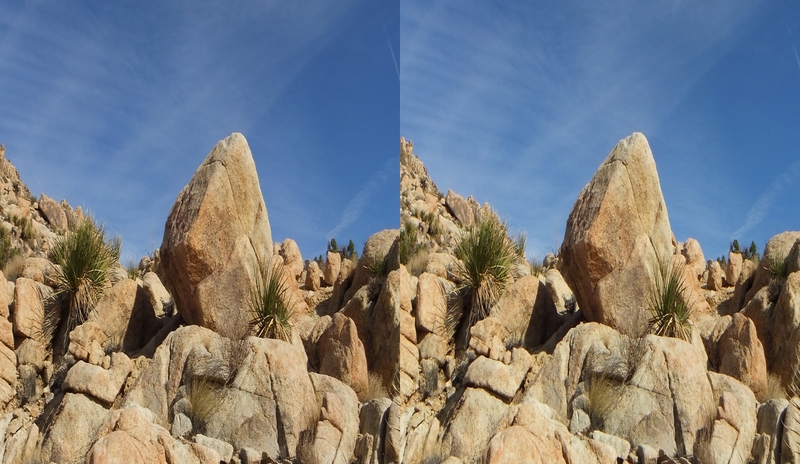 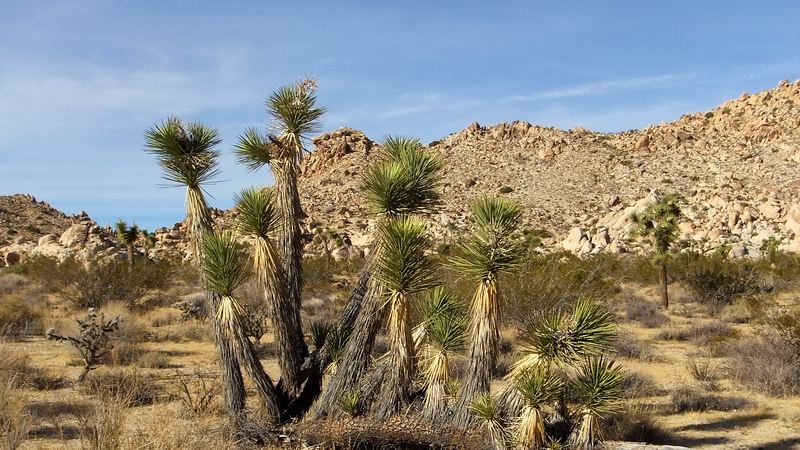 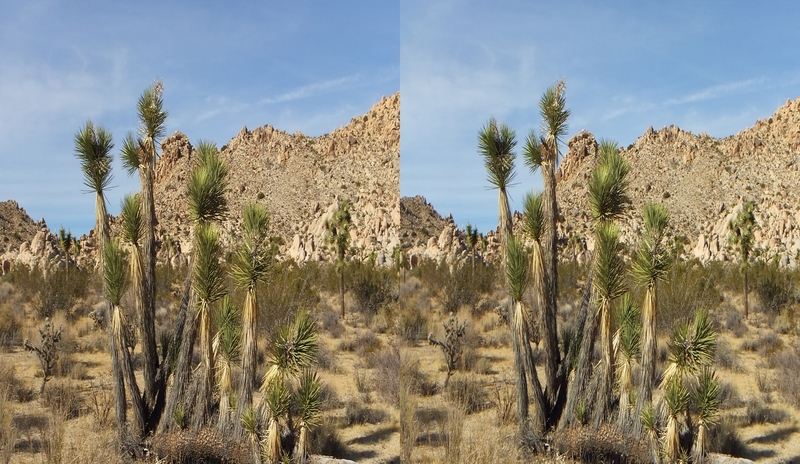 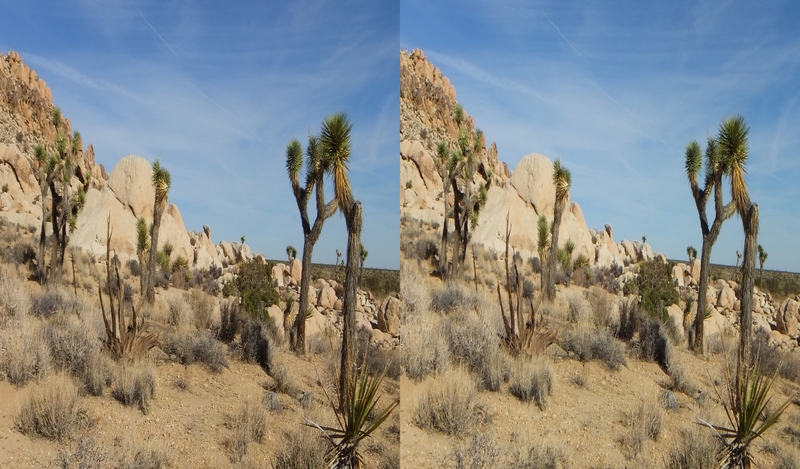 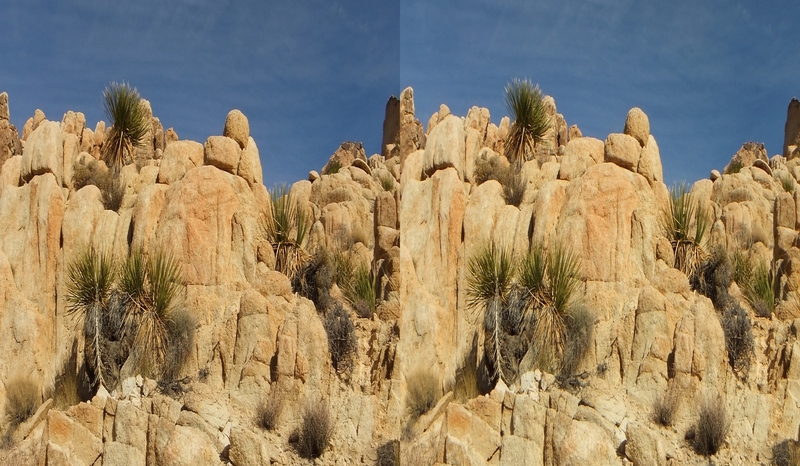 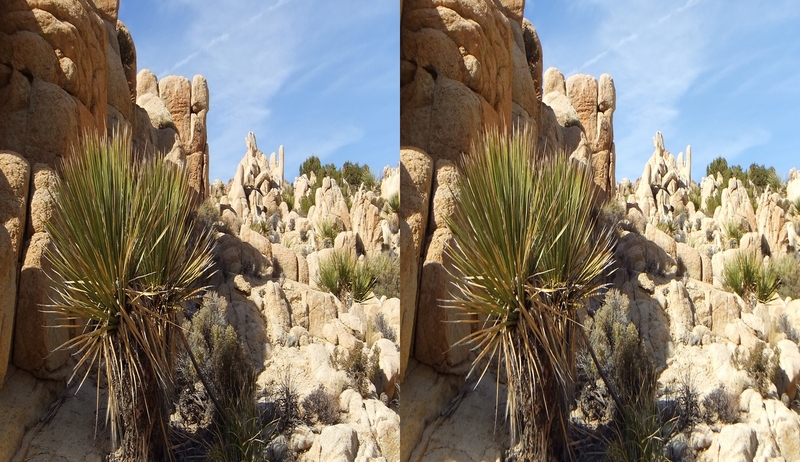 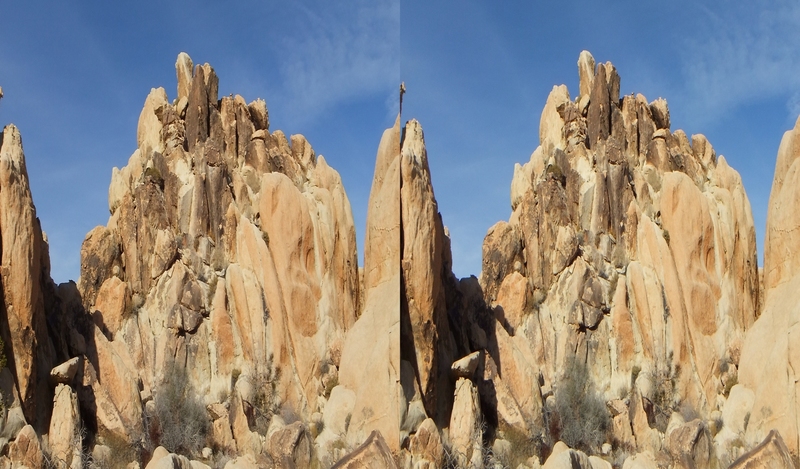 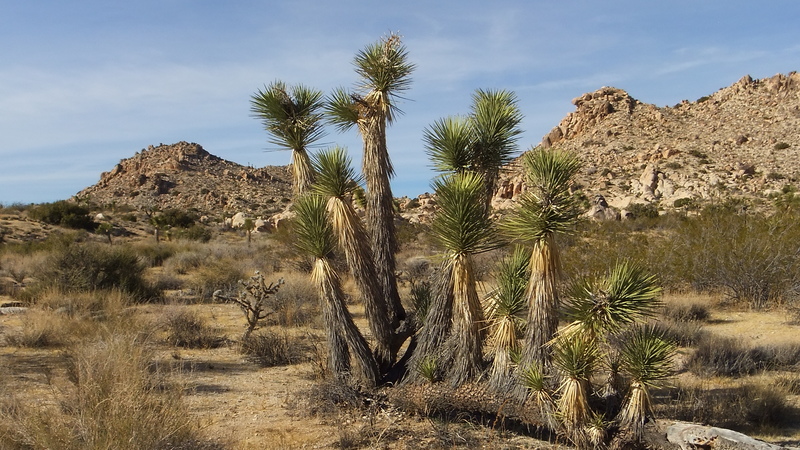 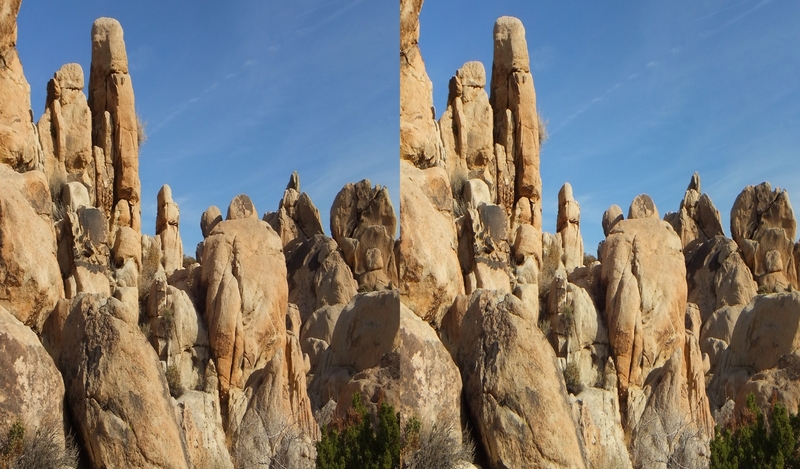 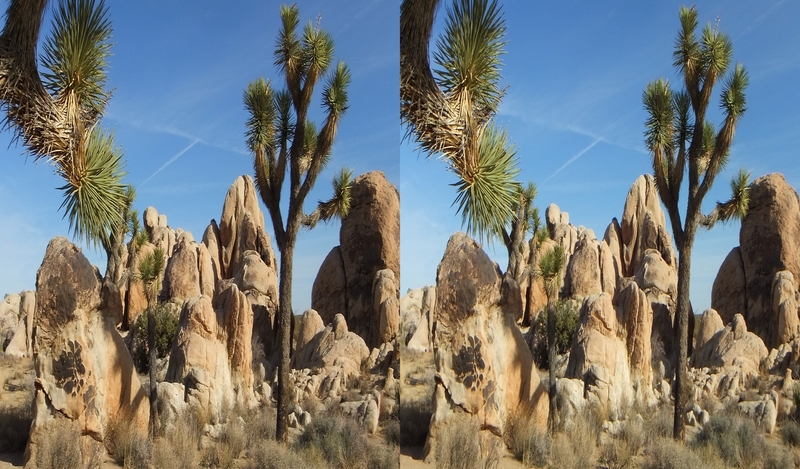 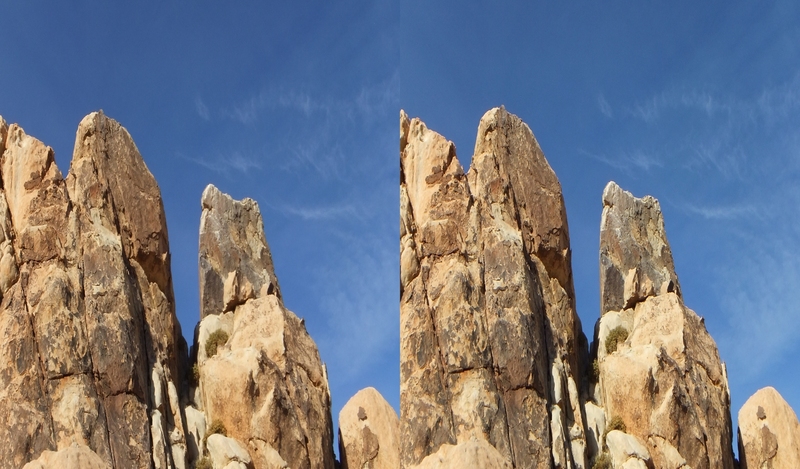 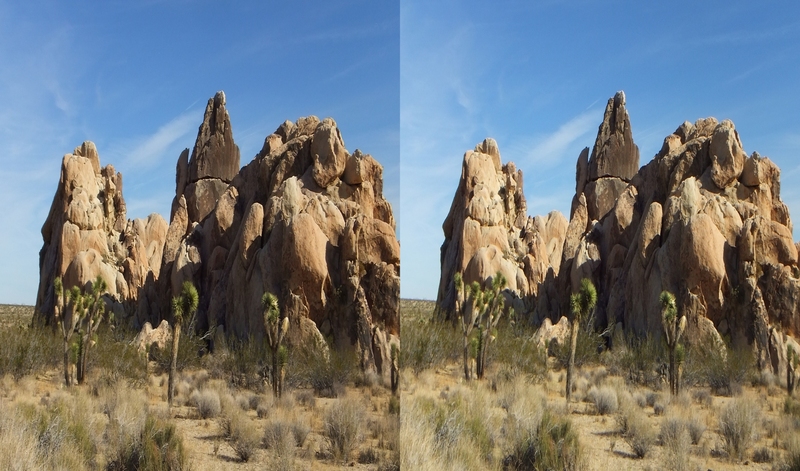 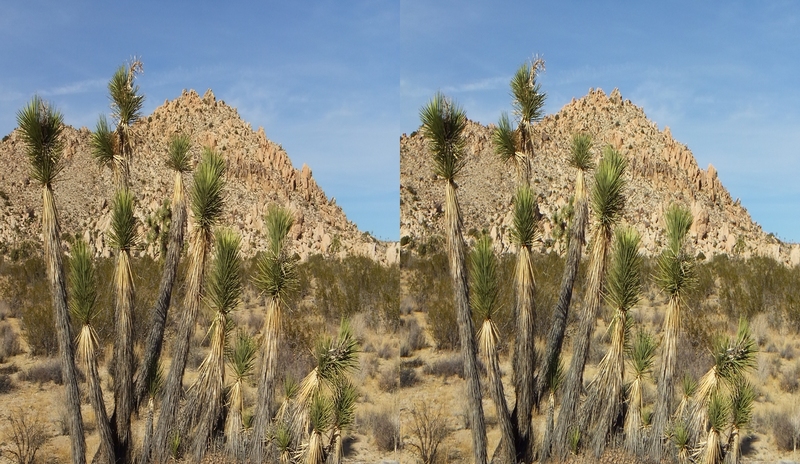 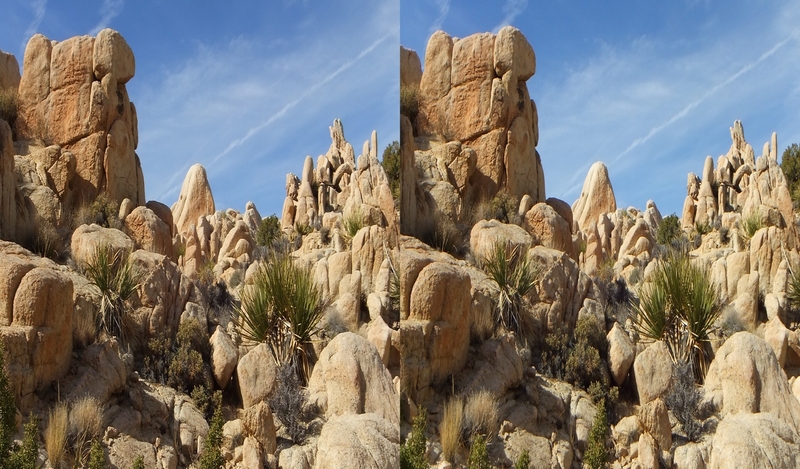 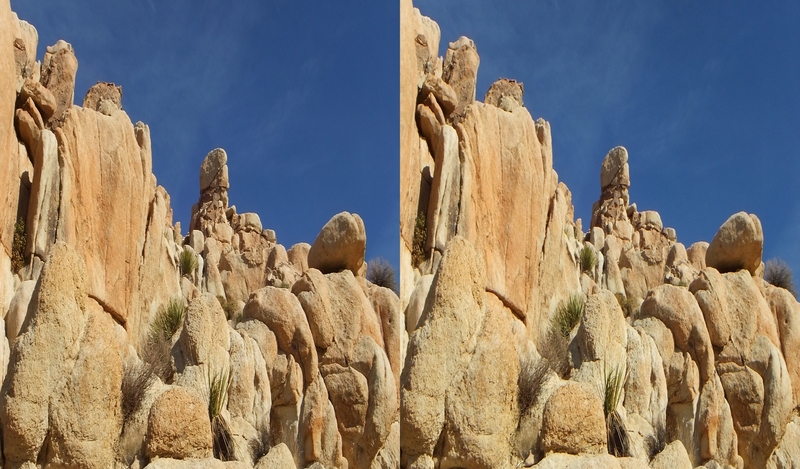 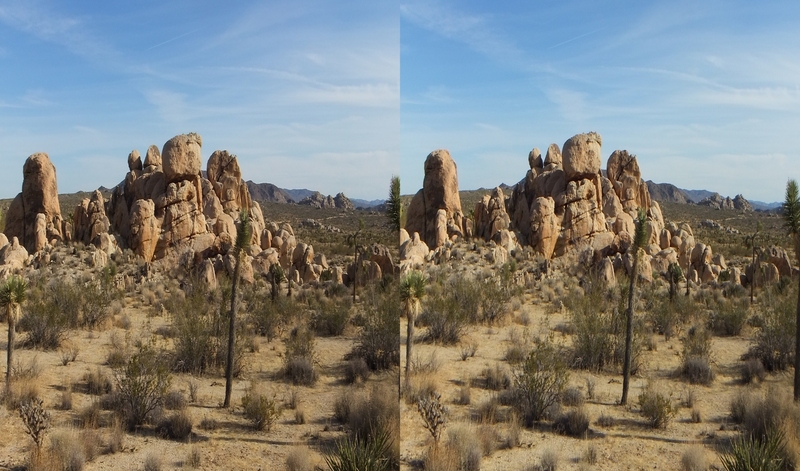 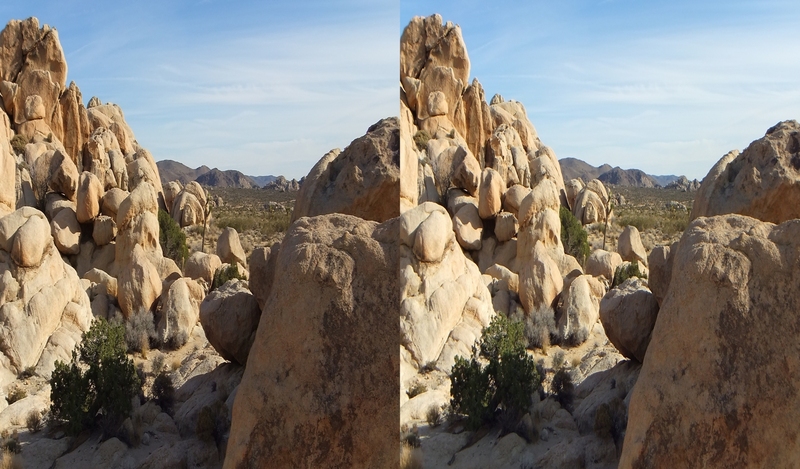 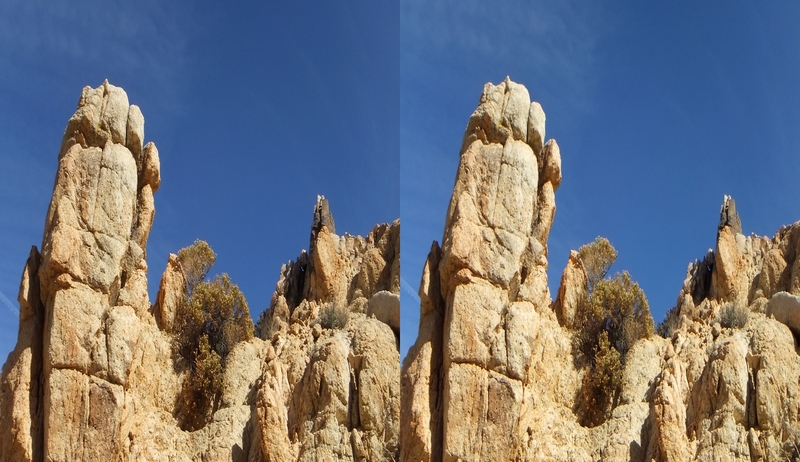 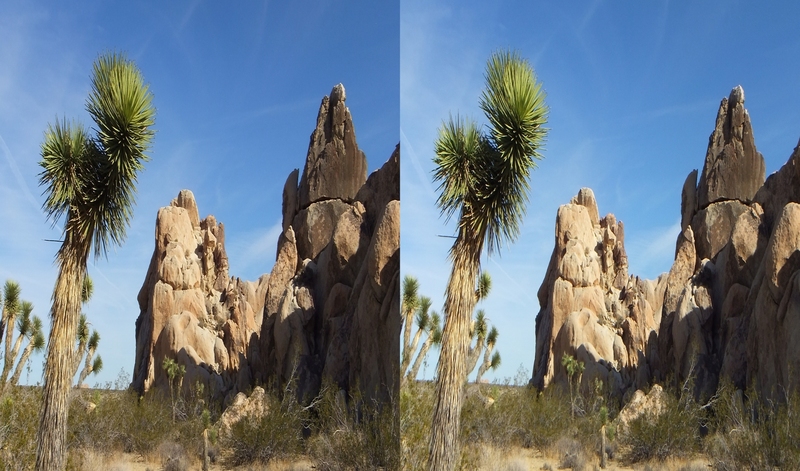 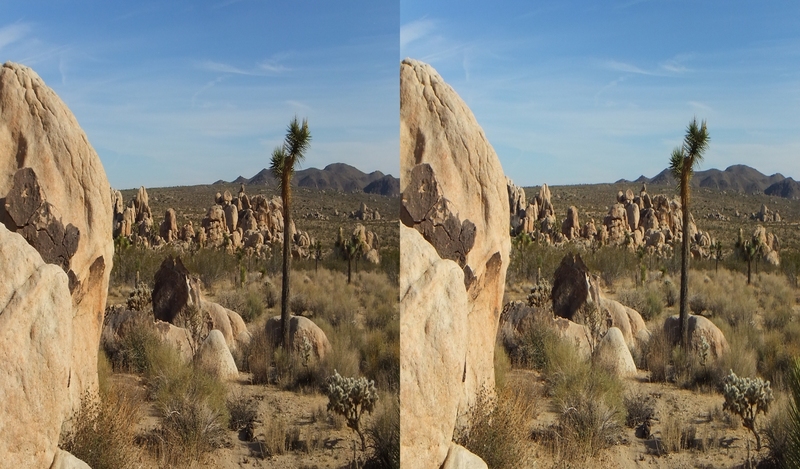 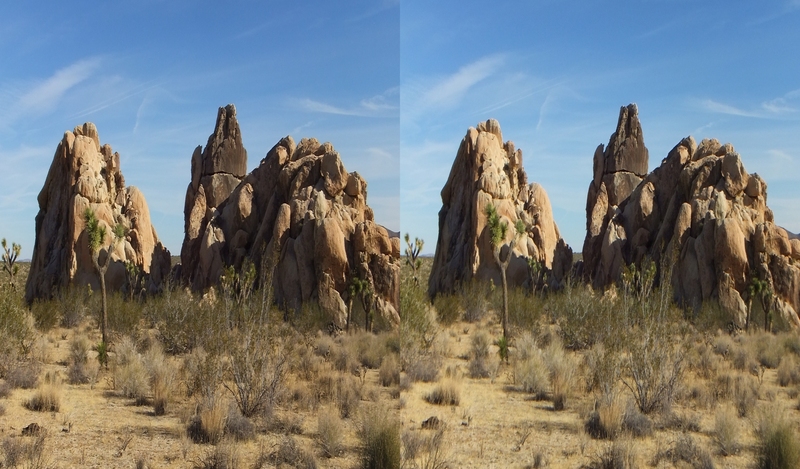 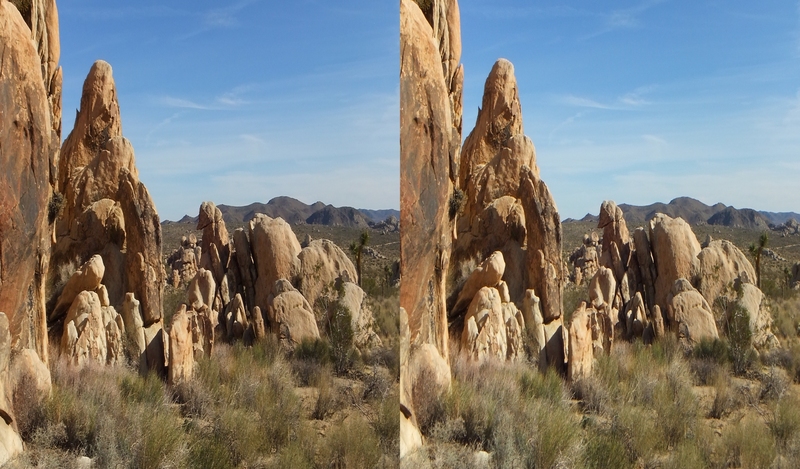 Thank you for spending a few minutes looking over the photographs from this section of Joshua Tree National Park, an area that is rarely visited and therefore pretty much in its pristine, millions years’ old condition.